The Majesty 125 M/Y AltaVita is the sixth in the Majesty Yachts series of Gulf Craft to be built and the third to be delivered in Europe. In commemoration of the Year of Zayed, Gulf Craft has partnered with Quest Media and sponsored the UAE Concours D'Elegance which was held last December 14-15 at the Bvlgari Hotel & Resorts in Dubai. Gulf Craft participated in the 17th edition of the ‘Clean-Up UAE’ campaign spearheaded by the Emirates Environmental Group under the patronage of H.E. Eng. Sultan Al Mansoori, Minister of Economy. The online walk-through of the new Touring 48 has been released! Dubai, UAE- Gulf Craft participated in the "Muttahidoon" event organized by the St. Mary's Catholic Church at the Gems World Academy in Dubai. In the spirit of the Year of Zayed, the Muttahidoon (meaning united) event has brought together more than 700 employees from different companies across the seven Emirates irrespective of their cultural background. It was a moment of great pride for Gulf Craft, the Emirates leading luxury yacht and leisure boat manufacturer, as the first Majesty 140 named "C'est La Vie" which translates to "That's Life", has been delivered to her owner. Built exclusively for the owner's private use, C'est La Vie boasts customization that raise contemporary standards to a new level of sophistication. The all new Touring 48 is the latest introduction in the Utility Series from Gulf Craft. 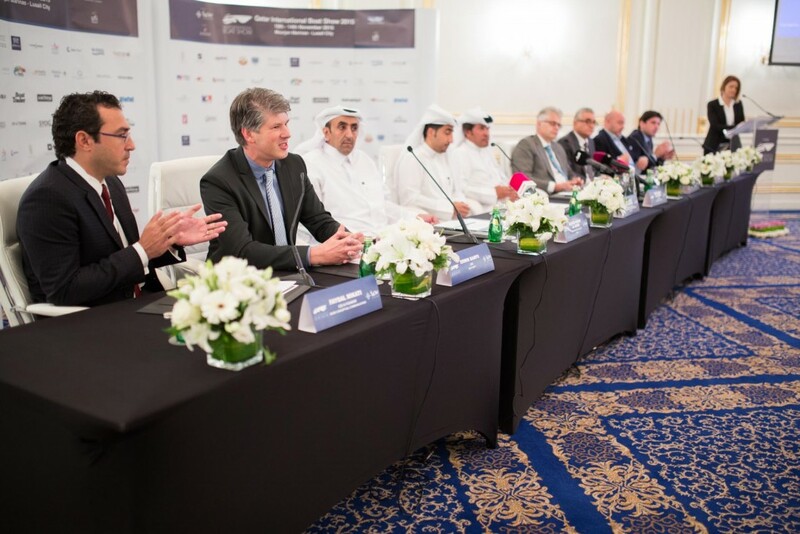 Gulf Craft Chairman Mohammed bin Hussein Alshaali was invited as one of the guest speakers at the 12th edition Middle East Yachting Conference held last November 22 at the Yas Marina in Abu Dhabi. Dubai, November 14, 2018 – Gulf Craft achieved yet another successful participation at the annual Dubai Pre-owned Boat Show 2018 that was held at the Dubai Creek Golf & Yacht Club from 8th to 10th November 2018. 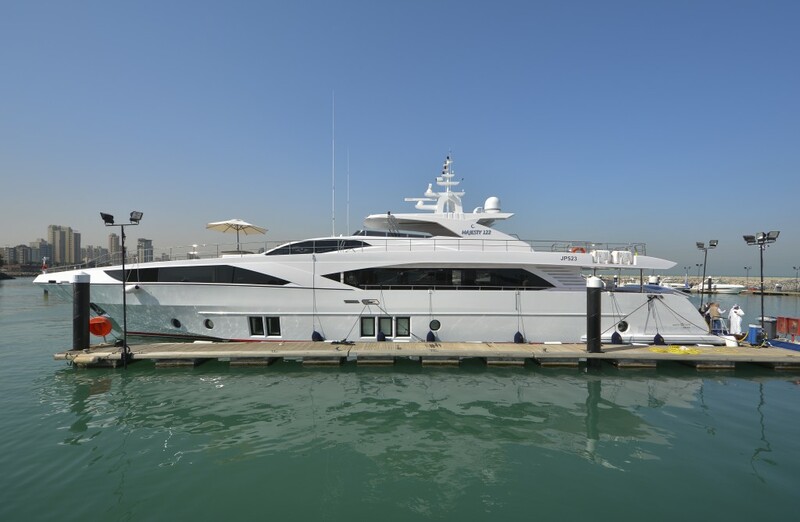 A regular participant since 2012, Gulf Craft featured three certified pre-owned yachts - the Majesty 88, Majesty 77 and Majesty 66 and a brand new Majesty 48. Abu Dhabi, UAE- Gulf Craft enjoyed the limelight at the first edition of the Abu Dhabi International Boat Show and showcased a fleet of 9 yachts and boats which included the biggest superyacht on display at the show- the Majesty 135. The annual Dubai Maritime Week, under the patronage of HH Sheikh Hamdan bin Mohammed bin Rashid Al Maktoum, Crown Prince of Dubai, kicked off with the UAE Maritime Leaders Seminar organized by the Dubai Maritime City Authority (DMCA) held last October 30 at The Address Dubai Marina. The 2018 Monaco Yacht Show has ended on a high note with the successful participation of Gulf Craft showcasing the Majesty 125 and the Majesty 100 superyachts. 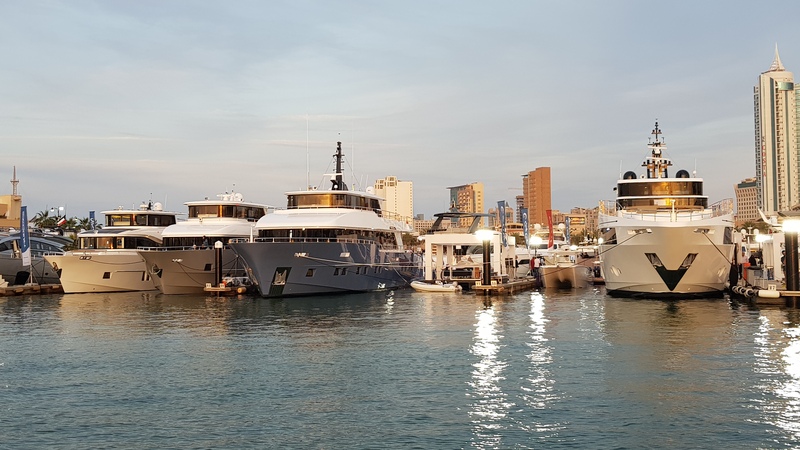 With attendance by Gulf Craft’s large network of dealers spanning from Australia, Asia and Europe, the company’s participation was even more fruitful by the event that took place onboard the Majesty 125 on Friday evening. Ferdinand Berthoud, a brand of the Chopard Group, invited their elite clients to a private function to showcase their latest watches. Gulf Craft's yachts and boats created great waves of interest at the first edition of Abu Dhabi International Boat Show. It showcased three different models of the Majesty Yachts which included the largest superyacht on display - the award-winning 43m Majesty 135, along with the Majesty 100, Majesty 62, Majesty 48 and the oceangoing Nomad 55. Leisure and commercial boats had three boats from Oryx and Silvercraft, a line popular amongst the fishing community. The third day of the Abu Dhabi International Boat Show was thrilling and full of entertainment activities. The weekend was greeted with a cooler weather after the early morning rain setting up the mood for guests to come down to the show with their families, friends and colleagues. Gulf Craft participates at the first edition of the Abu Dhabi International Boat Show which is being held under the patronage of His Highness Sheikh Nahyan bin Zayed Al Nahyan, Chairman of the Board of Trustees of Zayed bin Sultan Al Nahyan Charitable and Humanitarian Foundation, Chairman of Abu Dhabi Sports Council and organized by ADNEC. London based media, Boat International, has made a video interview with Gulf Craft CEO Gregory Yeakle to know more about the company’s expansion plan. The 3-point strategy has been announced at the Cannes Yachting Festival and the team at Boat International wanted to explore the dynamic approach that has led to these key points. Italy's premiere marine lifestyle magazine, Barche, features the Majesty 125 in its October 2018 issue. The Majesty 125 was showcased at the renowned European boat shows- Cannes Yachting Festival and Monaco Yacht Show, which were concluded last month. Singapore- A very warm welcome in Singapore was awaiting this beautiful boat, the Silvercraft 36 HT. Delivered through Gulf Craft’s representative in Singapore, Promarine Yacht Sales, the latest Silvercraft 36 HT features an extra bow seating, latest navigation and entertainment equipment. At the 2018 Cannes Yachting Festival, Gulf Craft had 2 magnificent superyachts on display, the Majesty 125 and Majesty 100. In this video, watch Gulf Craft's new Chief Executive Officer, Gregory Yeakle, as he explains the company's 3-point strategy. Yeakle illustrates the company’s future, laying down thefoundation for future innovative products in its ever growing portfolio. The Silvercraft 36 CC has been every sport fishing enthusiast's dream boat. It's center console design provides optimal deck space for both leisure and sport fishing activities. The Silvercraft 36 CC has a large forward seating area that can easily accommodate as much as 14 people. We've reached the second half of the Monaco Yacht Show. Guests passing by along Quai Chicane at the Port of Hercules quickly takes notice of Gulf Craft's proudly 'Made-in UAE' superyachts and are amazed by the quality and craftsmanship. Monaco, 26 September 2018- Shortly after its successful participation at the Cannes Yachting Festival, Gulf Craft's Majesty 125 & Majesty 100 sets off on another journey towards the iconic Port Hercules in the principality of Monaco for the 28th edition of the Monaco Yacht Show. Gulf Craft along with Aurora Yachts, its exclusive Majesty Yachts dealer for France and Monaco, made a mark at the biggest boat show in Europe, as it continued to sail to success at the 6-day event. Vieux Port, Cannes- Patrons of the Cannes Yachting Festival were greeted with a nice & sunny weather as soon as it opened its show entrances from 10 AM. Gulf Craft, in cooperation with Aurora Yachts International, exhibits at the 41st edition of the Cannes Yachting Festival where we are showcasing our novelties - Majesty 125 and Majesty 100. SuperYacht, Russian international yacht magazine, showcases Gulf Craft's Majesty 140 in the cover of their August issue. Gulf Craft's latest masterpiece, the Majesty 140, is showcased in a whopping 22-page spread in the summer issue of Superyacht One magazine. Since it's launching in Dubai, this magnificent superyacht has garnered tremendous attention from clients and media in the marine industry as well as lifestyle publications. Istanbul, Turkey- Gulf Craft's Majesty 110 took an epic cruise along the Bosphorus Straight which separates the European part and Asian part of Istanbul. The superyacht went along many historic sites and famous places in the city such as the Sultan Ahmed Mosque (also known as the Blue Mosque), Bosphorus bridge and the Sehzade Mosque. Gulf Craft and its exclusive dealer in Turkey, B&C Marine, have jointly displayed the Nomad 65 in Yalikavak Marina in Bodrum, Turkey. Gulf Craft has announced last month its participation at the upcoming Cannes Yachting Festival and Monaco Yacht Show this September. On display at these shows will be the Majesty 125 M/Y Altavita and the Majesty 100 M/Y Svetlana. 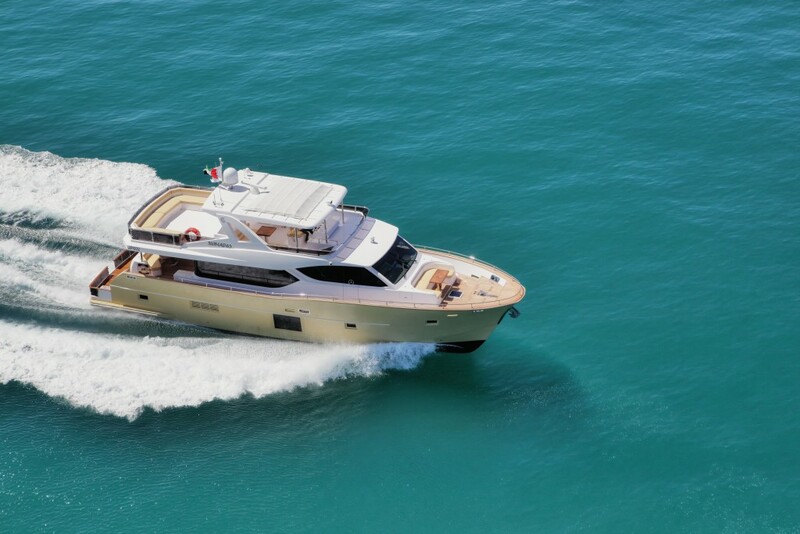 Gulf Craft has released the online virtual tour of the Majesty 62. 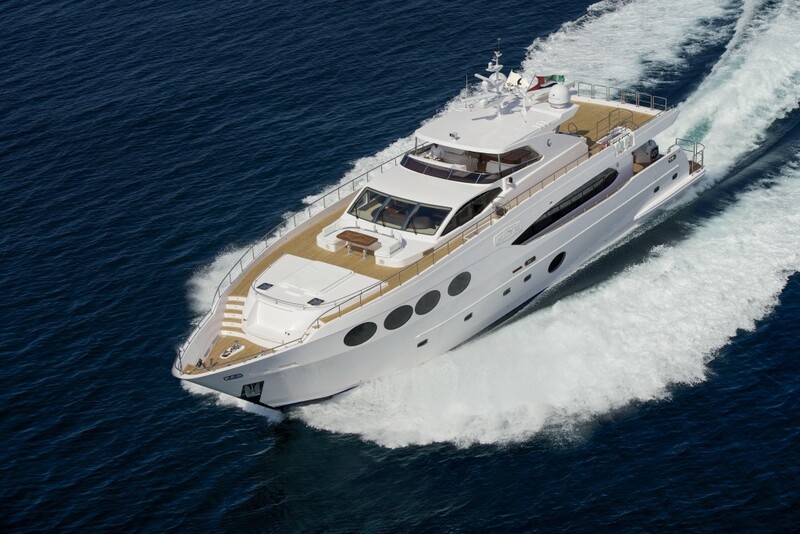 Th tour is available for viewing from the company's two websites- Gulf Craft and Majesty Yachts. The stylish Majesty 62 is the latest addition to the Majesty Yachts - Yacht Collection by Gulf Craft. 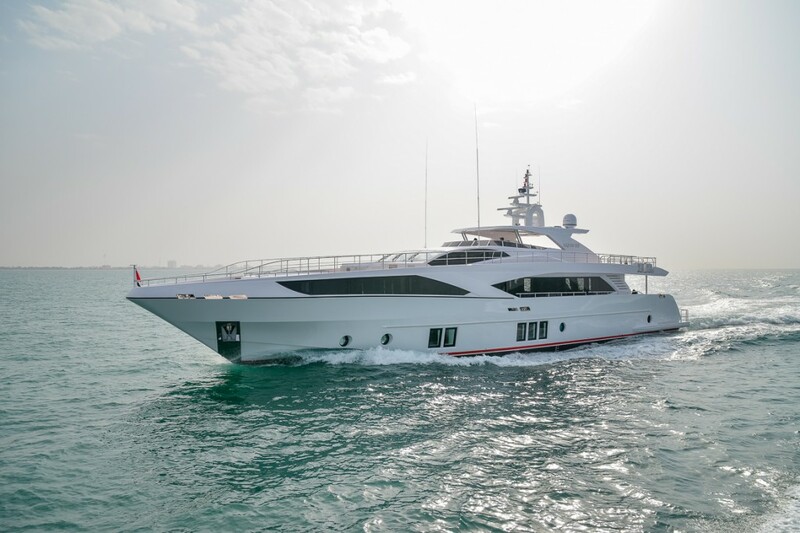 Since she was debuted in Dubai International Boat Show last March, it has attracted the attention of yachting enthusiasts who enjoy cruising with friends and family. This elegant family-friendly yacht can be handled by the owner without the need for extra crew. 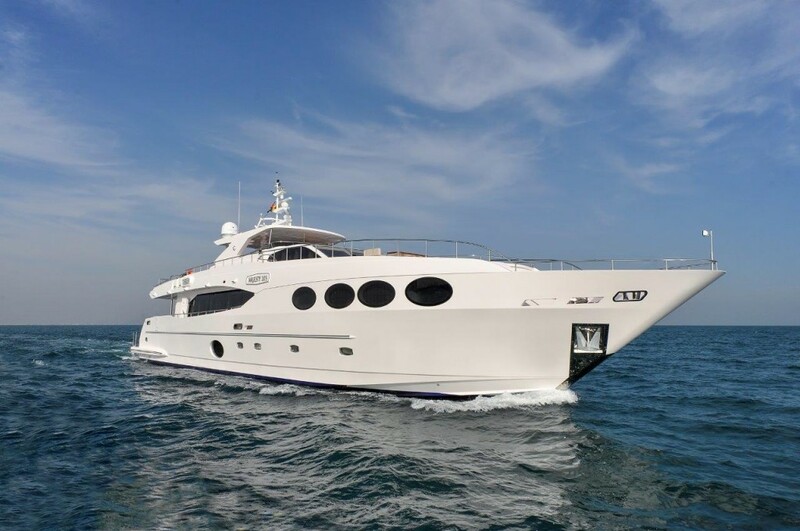 Gulf Craft has released the 360 degree online virtual tour of the Majesty 140. Come closer & view this wonderful creation and experience the magnificence that has brought this masterpiece together. Gulf Craft’s partner in Africa, Smartown, has shared an extraordinary story behind the arrival of the Touring 36 that was recently delivered to Bukavu, a city situated in the east of the Democratic Republic of Congo (DRC). The city lies in a remote area in DRC, at the extreme south-western edge of Lake Kivu, west of Cyangugu in Rwanda, and separated by an outlet of the Ruzizi River. Having just completed the Sydney International Boat Show, Capt. 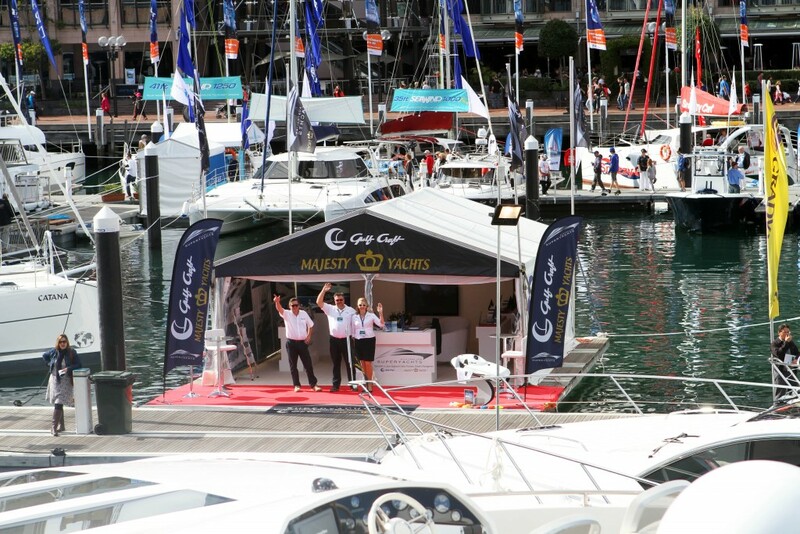 Richard Morris, General Manager of Australian Superyachts, said that it's one of the highly successful Sydney International Boat Show that we have ever had. This show marks Gulf Craft’s second exhibition in Australia this year. What a lovely evening! Gathering guests in Australia onboard the Majesty 100 M/Y Oneworld is just an amazing time. As the show progresses, more and more visitors queue at Gulf Craft stand at berth number 128 at the Sydney International Boat Show to visit this magnificent superyacht. What a beautiful day at the Darling Harbour in Sydney! It is also the location of the Sydney International Boat Show, dubbed as the "Southern Hemisphere's Premiere Boat Show" running from August 2-6. Gulf Craft's Utility Series is comprised of multi-purpose vessels used as water taxis, passenger, touring, diving, ambulance and patrol boats as well as fast intercept vessels. This range stretches from 31 feet up to 56 feet that can be built in different variants. Premier yachting lifestyle magazine, Yachts Middle East, previously known as Yachts Emirates, features the Majesty 140 in this amazing 14-page article plus front cover in its July 2018 issue entitled "Crest of the Wave". Boat International magazine features Gulf Craft's latest masterpiece, the Majesty 140, in the article entitled "Arabian Might" in its latest issue. BI Editor, Stewart Campbell, reports "Gulf Craft is turning up the heat on its Mediterranean rivals with the super cool Majesty 140 putting other yachts in the shade." Dubai, United Arab Emirates- After several sessions of training and teamwork, Gulf Craft's Ramadan Cup was organized together with the Filipino Marine League. The team reached the end of the tournament with an All-Star basketball game and a championship match held at the Raffles International School. Continuing on the success of the brand Utility Series developed by Gulf Craft, the shipyard has once again developed a new utility boat model – Touring 48. The Majesty 140 is the latest addition to the Majesty Yachts – Superyacht Collection manufactured by Gulf Craft. 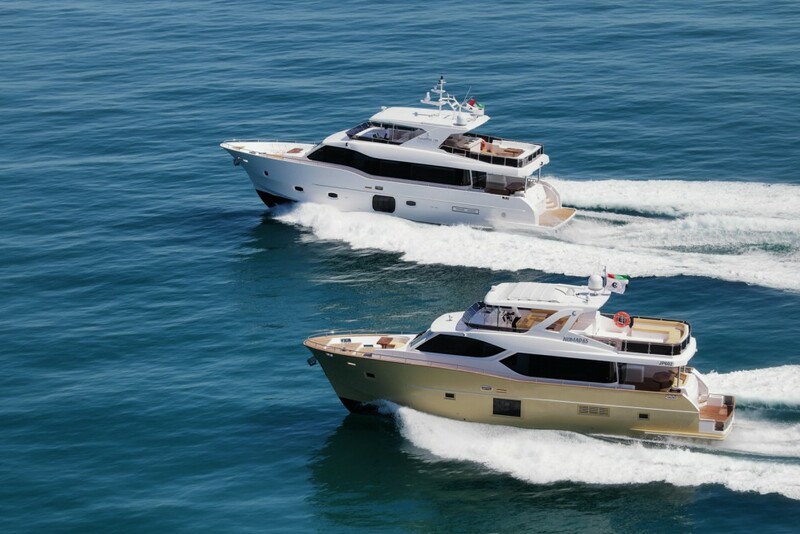 Dubai, July 2, 2018 – Gulf Craft, along with its exclusive Majesty Yachts dealer for France and Monaco, Aurora Yachts, will jointly showcase two magnificent superyachts at two of the most prestigious yachting events in Europe. 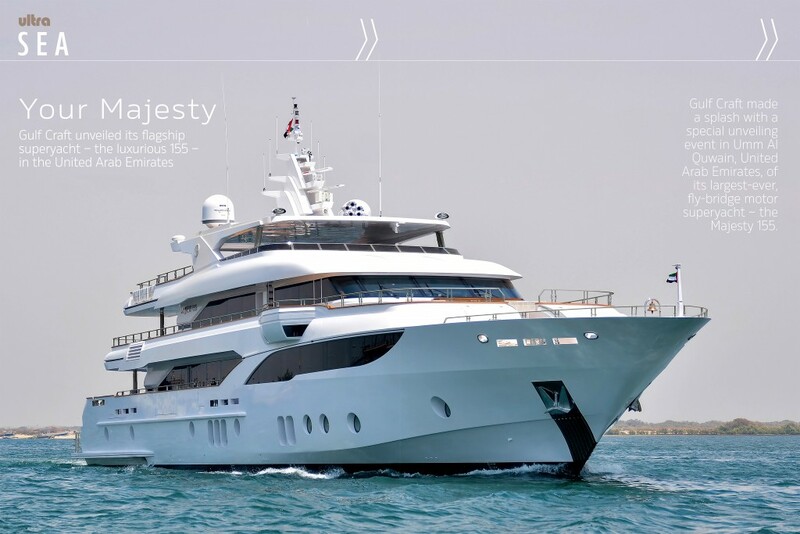 Gulf Craft has recently revamped its Majesty Yachts website for a much simpler yet elegant design. The new website is more focused on the visual engagement aspect and also enhances further the visitor’s browsing experience. Gulf Craft, in partnership with the Filipino Marine Basketball League, sponsored the Ramadan Cup Basketball Tournament held in Dubai and became the title sponsor. This is not the first time that Gulf Craft is allied with the association as it has previously also supported the teams in other games. This support is a continuation of our CSR activities that the company stands for. Following the report that was released by The Superyacht Group recently related to the global ranking of international shipyards, we are proud to note that Gulf Craft has climbed to 7th position. Gulf Craft, in conjunction with its exclusive dealer, Australian Superyachts, ride a wave of success with the premiere of Majesty 100 M/Y Oneworld at Sanctuary Cove International Boat Show - the Southern Hemisphere's premier boating festival. 24th May, Sanctuary Cove, Queensland Australia - Gulf Craft, in partnership with Australian Superyachts opened its participation at the Sanctuary Cove International Boat Show to showcase Oneworld Charter's Majesty 100 M/Y Oneworld. Check out the images below. With the recent delivery of another Majesty 100, this time to Australia, Gulf Craft marks another achievement in that continent. Majesty 100 (M/Y Oneworld) has been making a splash in the media, gaining attention from Europe, Asia and Australia. Gulf Craft has released the product video of its latest superyacht, the Majesty 140. At 43m this masterpiece boasts a number of features such as the expansive beach club, two aft balconies on the main deck and a waterfall cascading from the hardtop into the jacuzzi located on the sun deck. She was officially launched at the 2018 Dubai International Boat Show. Gulf Craft has released the product video of its latest family yacht, the Majesty 62, which was presented as a world premiere at the 2018 Dubai International Boat Show earlier this year. Gulf Craft joined another beach clean-up campaign held last April 22 as part of the World Earth Day Program organized by the Umm Al Quwain Municipality under the patronage and attendance of His Highness Sheikh Ali Bin Saud Al Mualla, Head of the UAQ Municipality Department. Gulf Craft's Chairman Mohammed Alshaali receives "Lifetime Achievement Award for Maritime Entrepreneurship"
Gulf Craft chairman Mohammed Alshaali was a proud recipient of the coveted "Lifetime Achievement Award for Maritime Entrepreneurship" at the ShipTek International Maritime Awards 2018, held on May 01, 2018 at Dusit Thani Hotel in Dubai. It celebrates his remarkable contributions to the leisure marine industry and recognises his relentless efforts to create innovation and sustainable growth of the GCC maritime industry and associated services. Through his pioneering work and dedication, he has been instrumental in the establishment of the maritime sector as a key pillar of the UAE manufacturing industry. It is a proud moment for all of us at Gulf Craft. Ajman University invited Gulf Craft to participate in its annual job fair together with over fifty other companies from different sectors all over the Emirates. The event was held last April 18-19. Gulf Craft employees joined together to celebrate the company's 36th anniversary with an annual family gathering at the Majesty Yachts and Nomad Yachts shipyard in Umm Al Quwain. Sydney, Australia- The newly-delivered Majesty 100 M/Y Oneworld is enjoying the limelight due to its increasing popularity in Australia. 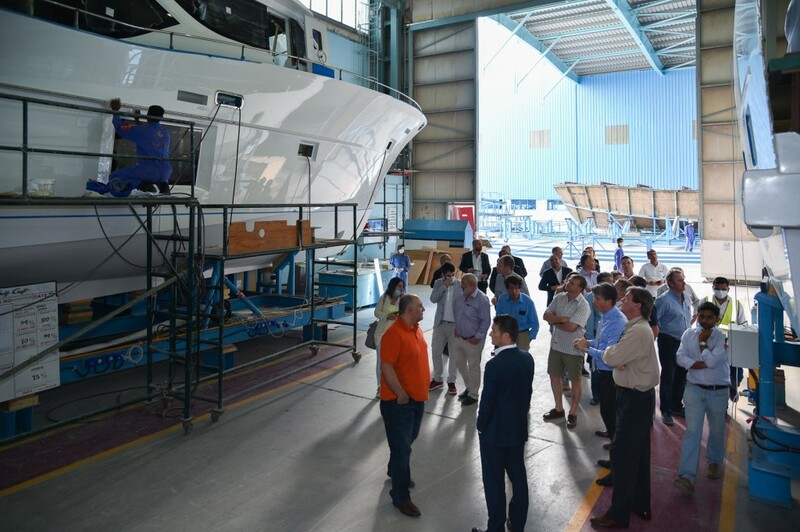 Twenty executive MBA students from the Zurich University of Applied Sciences from Switzerland visited the Gulf Craft shipyard in Umm Al Quwain for an exclusive tour of the factory. Australia's premiere marine lifestyle magazine, Ocean Magazine, has issued the article on the official Australian launching of the Majesty 100 M/Y Oneworld organized by Australian Superyachts. 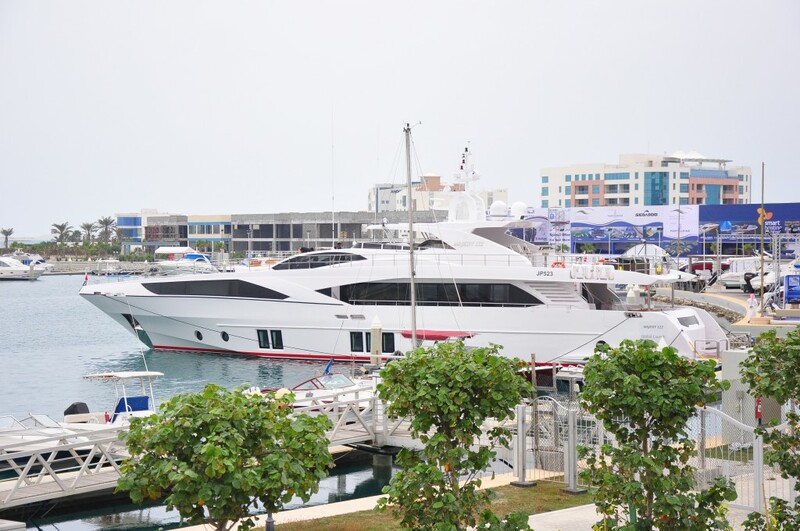 One 15 Marina, Singapore - The Singapore Yacht Show started to pick up during the weekend as seen in the growing number of visitors at the Gulf Craft stand during the second and third day. 12th April, Singapore - Gulf Craft was still in high spirits at the opening of the Singapore Yacht Show after bagging once again the "Best Asian Yacht Builder" award at the Asia Boating Boating Awards. Singapore, April 12, 2018 – Gulf Craft, the Emirates leading luxury yacht and leisure boat manufacturer will have an impressive presence at the South East Asia's most prominent boat show, the Singapore Yacht Show. Gulf Craft together with its Kuwait representative, Al Boom Marine, put on display a selection of its yachts and small leisure craft from its Majesty Yachts, Nomad Yachts, Oryx and Silvercraft brands ranging from 9-24 meters at the 6th edition of the Kuwait Yacht Show. Gulf Craft and Australian Superyachts are proud to announce the successful delivery of the Majesty 100 M/Y Oneworld to a client in Newcastle, Australia. The photos below were taken during its off-loading at Mayfield Port in Newcastle. Dubai, UAE- Gulf Craft's basketball team won the 1st runner-up title at the Season 2 of the Winter Basketball Tournament organized by the Filipino Yachtsmen Association (FYA). Gulf Craft premiered its latest addition to the Majesty Yachts superyacht collection, the Majesty 140, at the 26th edition of the Dubai International Boat Show held at the Dubai Canal in Jumeirah, Dubai. Gulf Craft, in conjunction with its exclusive Australian Dealer, Australian superyachts, is pleased to announce the delivery of the Majesty 100 M/Y ONEWORLD to an experienced Australian yacht owner. 'Oneworld' is fully customized for commercial charters in Australia and will soon commence operations on the East Coast of Australia with Oneworld Charters. Dubai, March 13, 2018 – Gulf Craft, UAE's pioneering yacht and boat builder, continued its winning performance at the region’s most influential boat show with the sale of 5 yachts and boats from across the range. 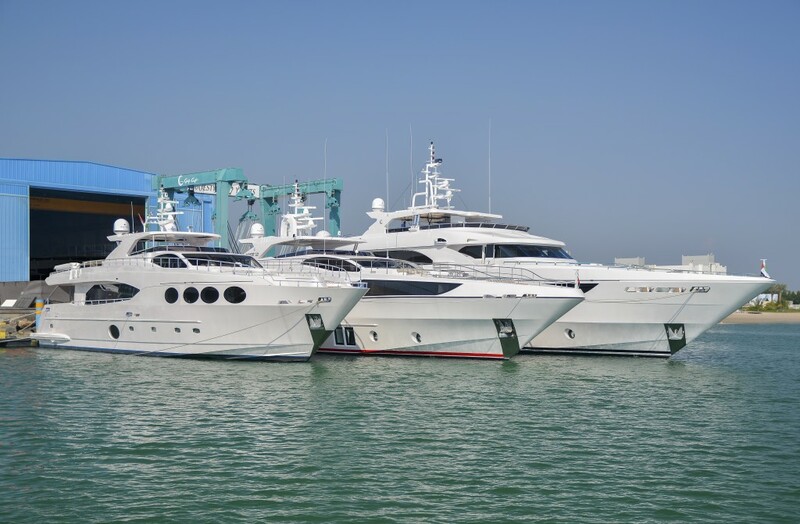 Having achieved total sales worth 85 million dirhams (USD $23m) during the 5-day international show, Gulf Craft foresees greater sales momentum in the coming months. Watch this video of Gulf Craft's Majesty 100 superyacht and be amazed at the many features which have made it an award-winning superyacht. Dubai Canal, Jumeirah- Gulf Craft has announced its three global premieres at the opening day of the Dubai International Boat Show during its press conference at its stand MD-10 ahead of the official opening of the Dubai Boat Show. Gulf Craft's Majesty 110 tri-deck superyacht continues to shine at the Tuzla Boat Show. Tuzla Boat Show guests continued to flock the Majesty Yachts stand at hall 1 and were greeted with enthusiasm by the Gulf Craft and B&C Marine team. All were eager to learn more about one of the biggest superyachts on display at the show - the Majesty 110. On January 7 Executive Management Officer Abeer Alshaali and Gulf Craft CEO Erwin Bamps invited the participants of the fifth edition of the Abdulaziz bin Humaid Leadership (ALP) Program for an extensive tour of its Majesty Yachts and Nomad Yachts shipyard and an in-depth discussion on the success story of Gulf Craft. Gulf Craft's first participation at the inaugural Tuzla Boat Show in cooperation with its Turkey representative B&C Marine features a grand showcase of its Majesty 110 superyacht, one of the largest and most luxurious yachts on display at the event. Dubai, February 17, 2018 – Gulf Craft, the Emirates-based leading luxury yacht manufacturer and amongst the top ten superyacht manufacturers in the world, along with BC Marine, its official dealer in Turkey, unveils its luxury superyacht at the prestigious boat show taking place from 17th – 25th February 2018. Launched during the 2017 Dubai International Boat Show the Silvercraft 48 HT is the largest model in the Silvercraft brand of Gulf Craft. 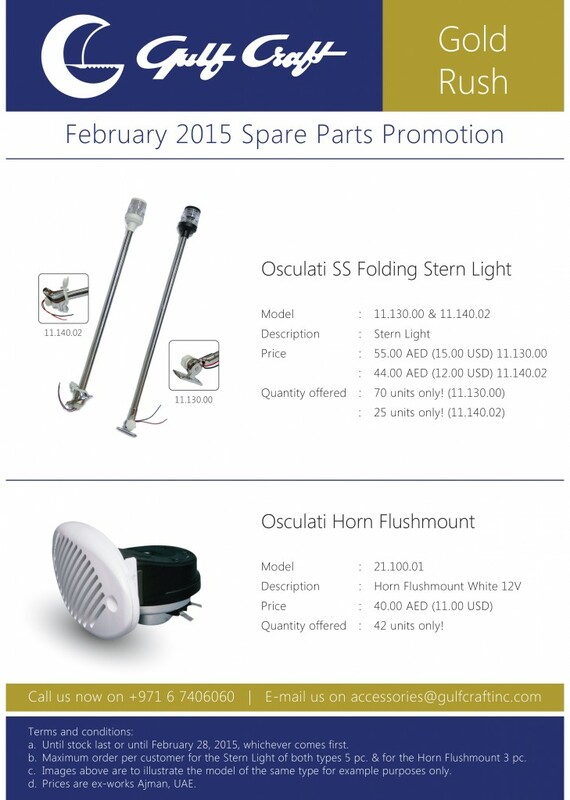 It is an ideal choice for fishing and water sports activities. Gulf Craft, together with its Turkey representative BC Marin, will participate at the Istanbul Tuzla Boat Show which will be held from February 17-25 at the Viaport Marina. The Dusseldorf Boat Show closed on a high note having welcomed about 247,000 visitors from our 100 countries between Jan 20 and 28,. Gulf Craft celebrated this year's event with a grand display of our Majesty 100 superyacht at the superyacht pavilion. There is never a dull moment at the Gulf Craft stand D59 at the Dusseldorf Boat Show 2018. 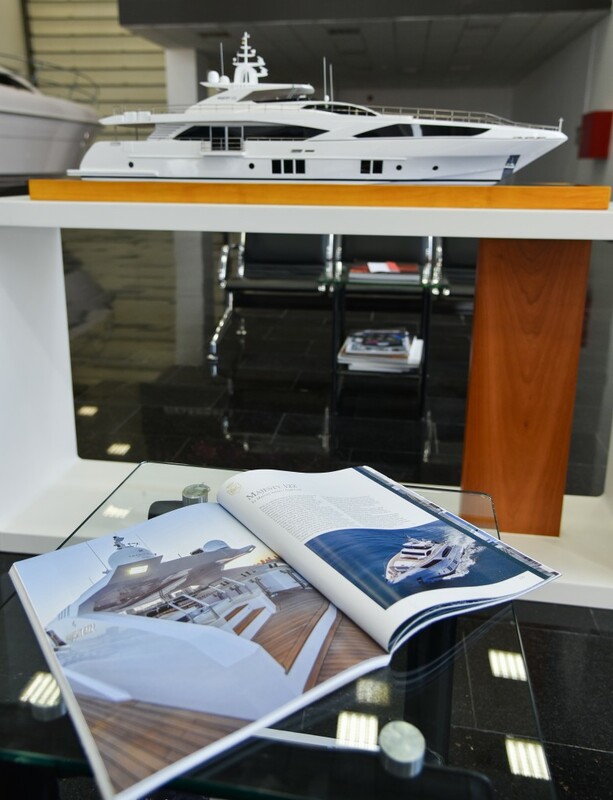 The Majesty 100 received great reviews from yachting enthusiasts & press visiting the event. Guests started to converge at the Gulf Craft stand at the Dusseldorf Boat Show while waiting in queue to view the Majesty 100 superyacht. 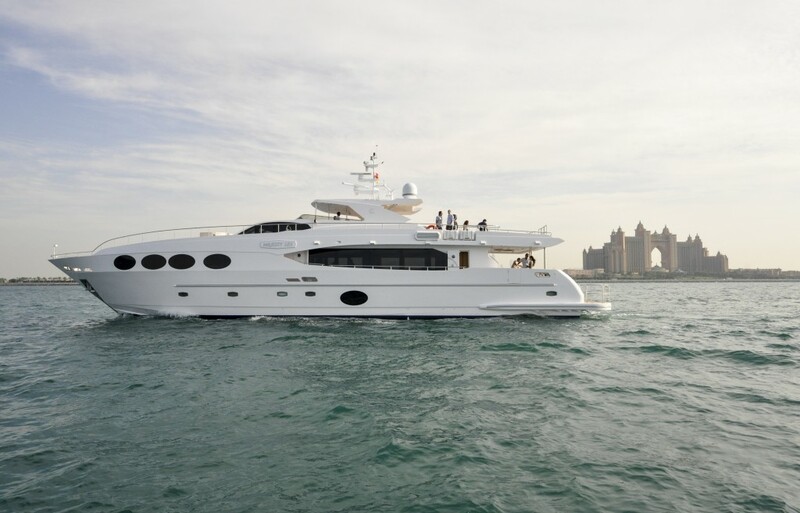 Gulf Craft's award-winning Majesty 100 superyacht has been extremely well-received by yachting enthousiasts worldwide. Visitors are mostly impressed with its innovative design and unique combination of features since its launch at the 2017 Dubai International Boat Show. Gulf Craft, in partnership with Drettmann International, participates in the biggest indoor leisure marine exhibition worldwide, the Dusseldorf Boat Show. This year, Gulf Craft showcases its iconic sky-lounge superyacht Majesty 100. The event still runs until January 28. 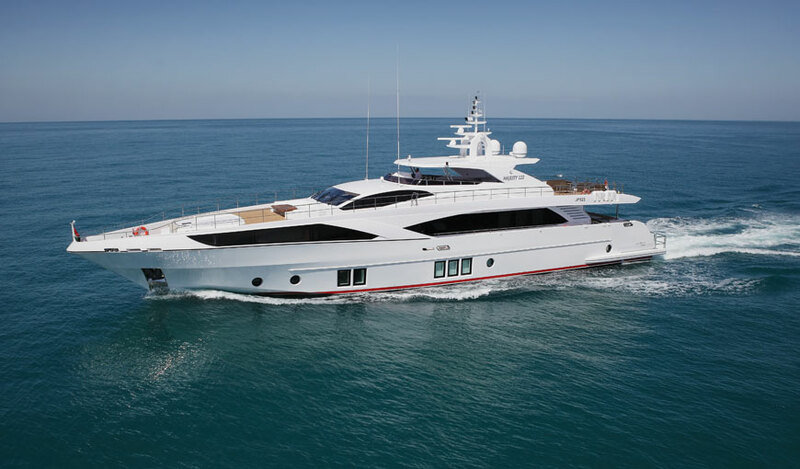 Dubai, January 21, 2018 – After a series of highly successful launches at some of the major leisure marine shows around the globe, Gulf Craft and Drettmann Yachts will jointly showcase Gulf Craft’s latest superyacht model - Majesty 100 to a highly discerning clientele featuring high-net worth individuals, yachting and boating enthusiasts, industry specialists and boat prospects. Revealed at the 2017 Dubai International Boat Show, the Majesty 100 is characterised by her unique sky-lounge and a powerful but efficient propulsion system. 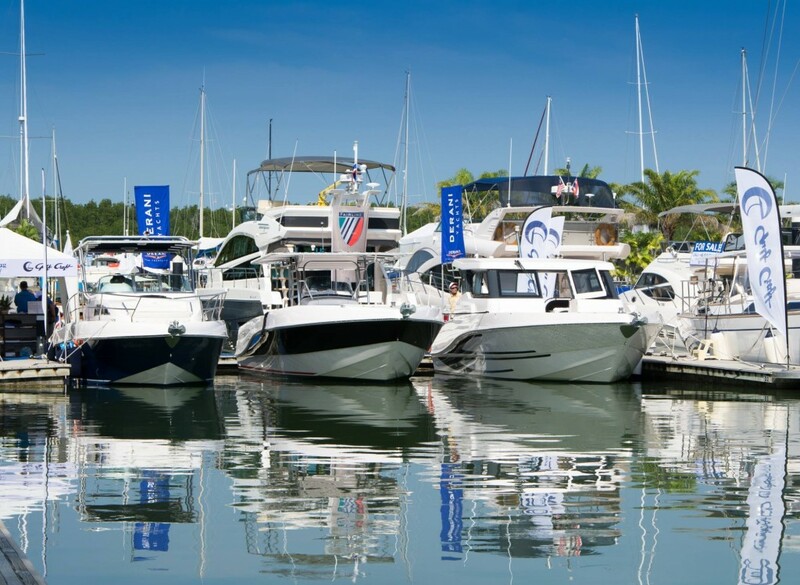 Gulf Craft together with its exclusive representative in Thailand, Go Boating Thailand, joined the first edition of the Phuket Rendezvous held from January 4-7 at the Royal Phuket Marina. 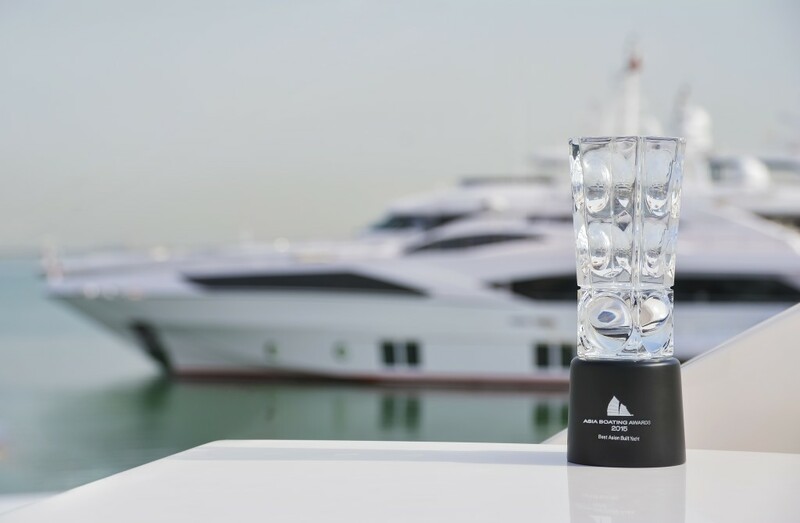 Winning an award is one of the best ways that one can start the new year and Gulf Craft has made it as one of the winners in the first edition of the Christofle Yacht Style Awards. Dubai, January 3, 2018 – Gulf Craft will start 2018 in style in Thailand at the new luxury lifestyle event Phuket Rendezvous from January 4 to 7, 2018. Gulf Craft's first sky-lounge superyacht, the Majesty 100, has been well-received in the European market. The Boat Show, an Italian leading TV program for sailing & power boats, visited Gulf Craft for a review of Gulf Craft's most talked-about superyacht. Gulf Craft CEO, Erwin Bamps sits with David Dunn of The National for a one-on-one exclusive interview onboard the Majesty 135 at the Gulf Craft shipyard in Umm Al Quwain. Gulf Craft has released the new Silvercraft 31, the latest model in the Silvercraft series of fishing boats and family cruisers. Malaysia is one of the key Gulf Craft markets in Southeast Asia. 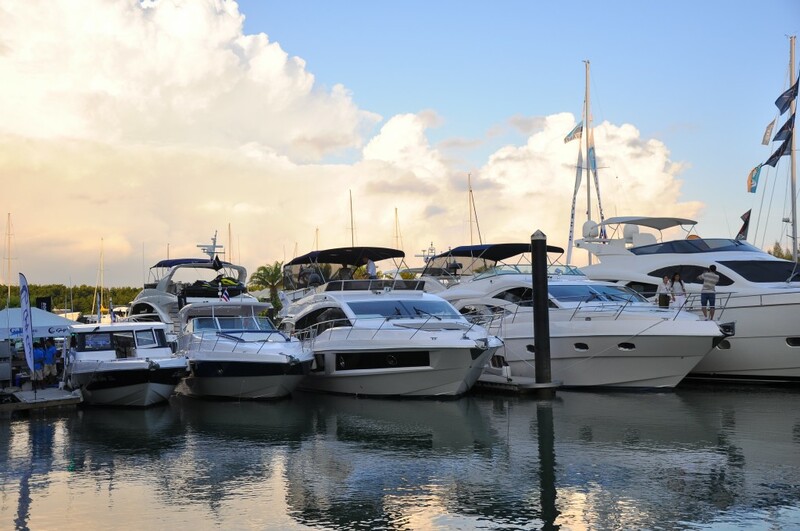 Our official representative in Malaysia , James Khoo, gives us a tour of Pangkor Marina and the Gulf Craft boats berthed in this exotic marina. 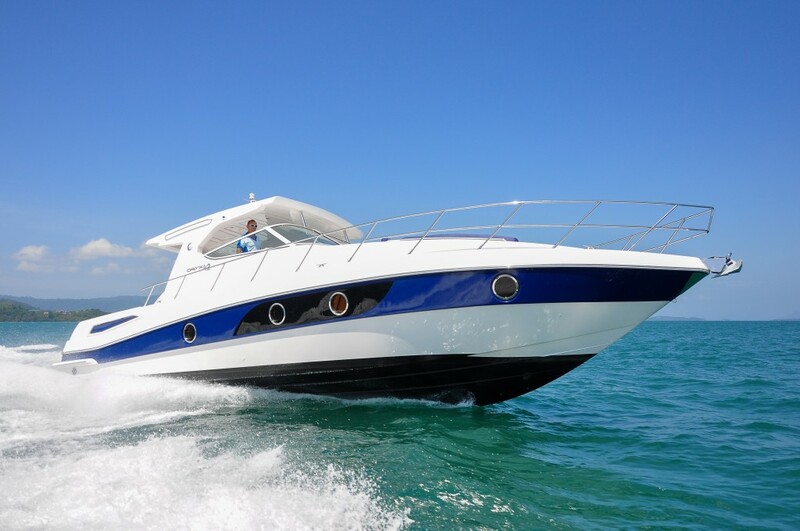 Phuket, Thailand- Gulf Craft & its Thailand representative, Go Boating Thailand, proudly announced the successful delivery of a Silvercraft 31 HT to a charter company in Phuket. Boat International, one of the leading publications for luxury yacht news, yacht reports and yachting lifestyle, features Gulf Craft's sky-lounge superyacht Majesty 100 in its latest Turkey edition. 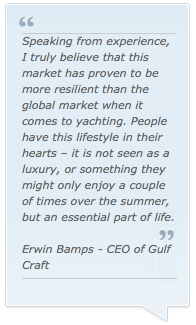 Also included in this article is an interview with Gulf Craft CEO Erwin Bamps. Dubai Sports City, Dec 7-8 - Last weekend Gulf Craft staff played and volunteered at the 24-hour football challenge organized by the Emirates Wildlife Society (EWS-WWF) in cooperation with GoFor24, Pico, Emirates Sports Academy and Dubai Sports Council in aid of marine conservation. Dubai, 11 December 2017 – Gulf Craft and Drettmann International will showcase its Majesty 100 superyacht at Germany’s Boat Düsseldorf, the world’s largest watersports gathering. Gulf Craft delivered the first Silvercraft 34 to Australia last August 2017. Australian Superyachts, Gulf Craft's representative in Australia, have facilitated the delivery. Boat International has announced the finalists of the 2018 Design & Innovation Awards, previously known as The Showboats Design Awards. Gulf Craft was delighted to deliver a Majesty 135 to a long-standing repeat customer, who named his new yacht ‘Lulwa’. Italy's premiere yachting publication, Barche, sat down with Gulf Craft CEO Erwin Bamps, for an interview about the development and conceptualization of Gulf Craft's latest superyacht - the Majesty 100. Dubai, 27 November 2017: A repeat Gulf Craft customer has taken delivery of a gleaming, technologically advanced Majesty 135 superyacht, the company reported this week. 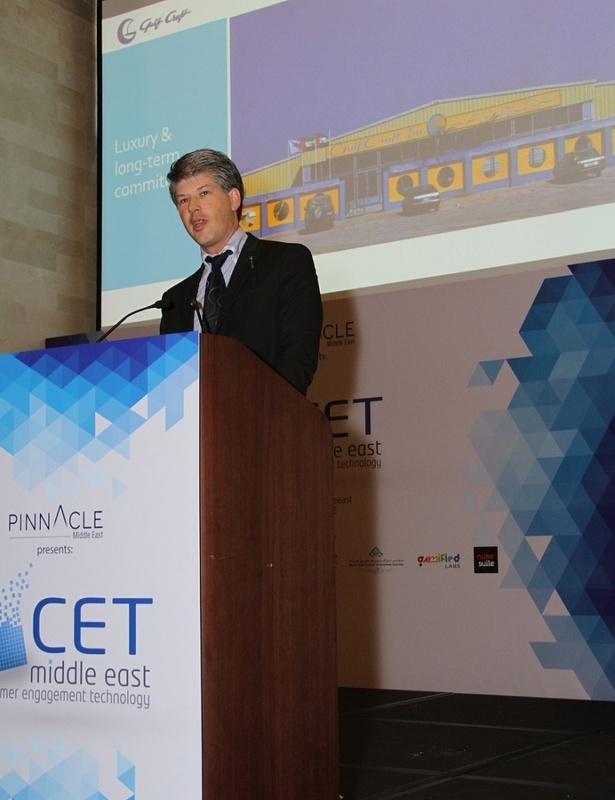 Gulf Craft CEO Erwin Bamps joined the 12th edition of the Customer Engagement Technology (CET) Middle East Conference as one of the panelists addressing the subject of "Driving Customer Engagement Across Different Channels." Dubai, 22 November 2017: Yas Marina will come alive with activity this weekend as race week rolls into the UAE capital. The vibrant waterfront location, whose buzzing nightspots and restaurants attract a cosmopolitan clientele, will welcome scores of guests for the year’s most glamorous sporting event, the 2017 Formula 1 Etihad Airways Abu Dhabi Grand Prix. Amsterdam, The Netherlands- FunAir and Gulf Craft are pleased to announce during METSTRADE 2017, the largest marine equipment trade show worldwide (Nov 14-16), that a partnership agreement has been made for Gulf Craft to be an official FunAir distributor in the Middle East territories. Boating enthusiasts queued at the Gulf Craft stand during the Dubai Pre-owned Boat Show held at the Dubai Creek Golf & Yacht Club last November 9-11. Dubai – 8 November 2017: Gulf Craft yachts and boats are designed and constructed with the ability to hold their value longer than comparable models from other manufacturers, the CEO of Gulf Craft says. Dubai, 31 October 2017: This week Gulf Craft delivered the spectacular 39-meter Majesty 125 superyacht to a repeat superyacht customer based in the GCC. Dubai, 24th Oct 2017- The 4th Maritime Standard Awards ceremony, under the patronage of His Highness Sheikh Ahmed bin Saeed Al Maktoum- President of the Dubai Civil Aviation Authority and Chairman & Chief Executive of the Emirates Airlines Group, was held at the Atlantis The Palm in Dubai on October 23. What would yachting be like without any marine life, turquoise waters and pristine beaches? Many of the pastime’s pleasures come from the interaction with nature: spotting colourful fish, swimming in crystal-clear seas, wending around unspoilt shorelines and visiting coastal communities. What drives Gulf Craft to participate in the Monaco Yacht Show every year? Chairman and Co-founder of Gulf Craft, Mohammed bin Hussein AlShaali, shares his insights in this video taken on-board its recently launched sky-lounge superyacht, the Majesty 100, at the Monaco Yacht Show 2017. Dubai, UAE- Located along the Dubai Water Canal, Marasi Business Bay is set to become a major future landmark in Dubai. The development presents a world rich with wonders featuring the region’s first purpose-built yachting destination, floating restaurants and cafes, 5 marinas, over 1250 berths, onshore boutiques and entertainment facilities. It also encloses unique water homes with pools. 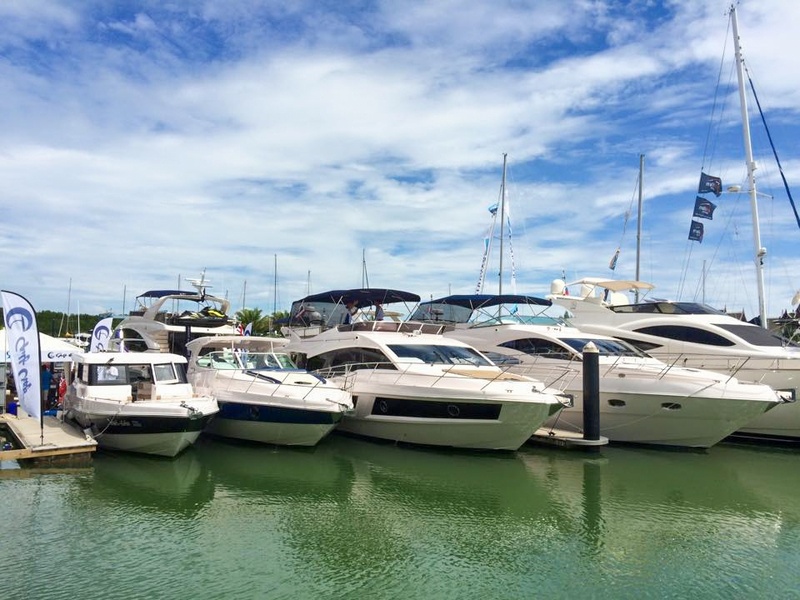 Raffles Marina, Singapore- Gulf Craft & Promarine Yacht Sales took part in the 4-day Singapore RendezVous event held at the famous Raffles Marina in Singapore last October 5-8. Mumbai, India- West Coast Marine, Gulf Craft's official representative for India, participated in INMEX SMM India 2017, South Asia's largest maritime exhibition. 8 Oct 2017 Ajman Saray Hotel, Ajman, UAE - Gulf Craft CEO Erwin Bamps and Executive Management Officer Abeer Alshaali attended the opening of the 5th edition of the Abdulaziz bin Humaid Leadership Program held at the Ajman Saray Hotel today. 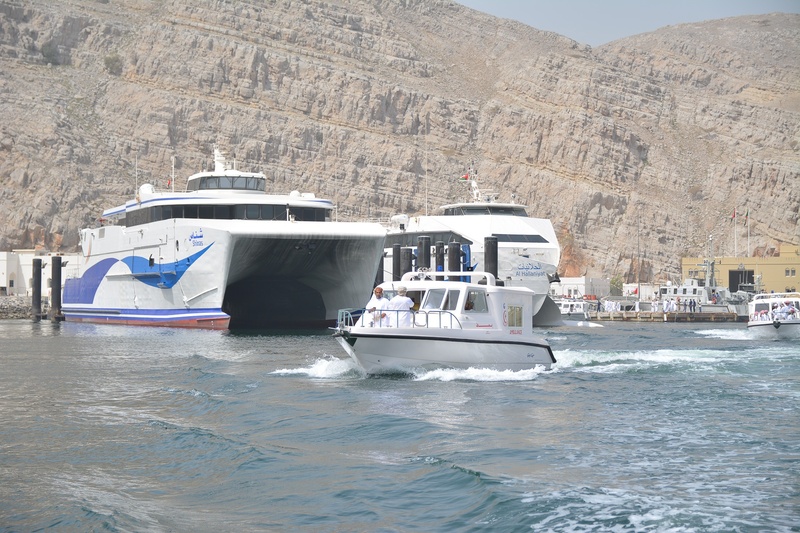 Take a scenic tour of the shorelines of Oman onboard one of the many Touring 36 tourist vessels, the most popular passenger boat model in Gulf Craft's Utility Series. Cannes, France- The annual Cannes Yachting Festival is one of the most important marketing platforms where Gulf Craft introduces its latest product offerings to the European market. This year, Gulf Craft was proud to announce the European debut of its Majesty 100 sky-lounge superyacht which received a lot of great reviews. 2 October 2017- Gulf Craft & Australian Superyachts team up for its first participation at the Auckland On Water Boat Show held at the ANZ Viaduct Events Centre & Viaduct Harbou, Freemans Bay, Auckland from September 28-October 1. 28 September 2017- Visit Gulf Craft at the T-Central at the Monaco Yacht Show where a powerhouse trio of Majesty Yachts are showcased. 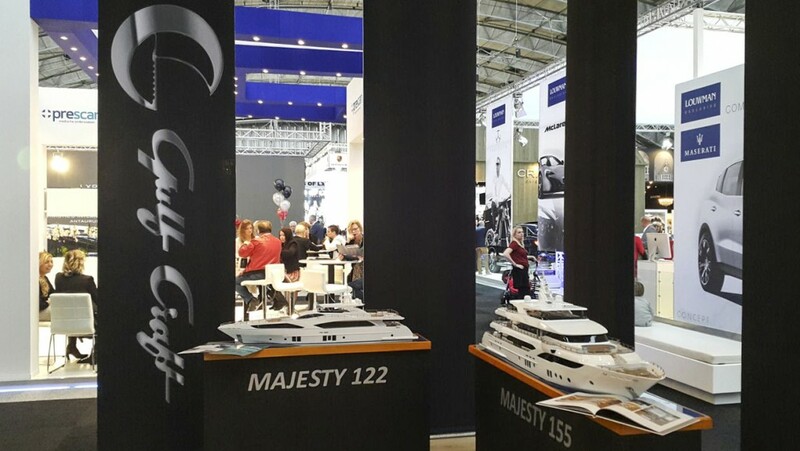 Find the Majesty 155 at T-20 and the Majesty 100 & Majesty 110 at berths T-28 & T-29. Gulf Craft's first sky-lounge superyacht, Majesty 100, is front-page featured in the latest issue of Invictus magazine, one of the US premier yachting magazines. 27 September 2017- Gulf Craft puts on display three of its Majesty Yachts superyachts -Majesty 155, Majesty 110 and Majesty 100 located at the T-Central berth numbers T-20, T-28 & T-29 at the Monaco Yacht Show. Monaco – 27 September 2017: Gulf Craft quickly follows its success at the Cannes Yachting Festival earlier this month with an all-star line-up of its flagship-brand, Majesty Yachts, on display at the Monaco Yacht Show which runs from 27-30 September. Mumbai, India- Gulf Craft, through its official representative in India, West Coast Marine, joined the biggest expotainment event in India- the Big Boys Toys Expo. Pier 7, Dubai Marina- Gulf Craft co-sponsored the Dubai Marina Yacht Owners Rally Season Opening Party and Luxury Showcase Event together with other iconic luxury brands in the region the likes of Bentley, George Jensen, Soneva Resorts, Meluha Cigars, Arnold and Sons, Godiva, Macallan, Lux Habitat and Xerjoff. Cannes, France- It's another exciting day at the Majesty Yachts stand located at the superyacht extension as guests continue to converge to get a chance to view the Majesty 110 and Majesty 100 at the Cannes Yachting Festival. Cannes, France- Fourth day photos of Gulf Craft at the Cannes Yachting Festival taken at the Majesty Yachts stand SYE 224. Show ends on September 17. Cannes, France- It's the third day of the Cannes Yachting Festival. Traffic at the Gulf Craft stand has increased as guests queue to get a personal tour of the Majesty 100 and Majesty 110 on display. Vieux Port, Cannes, France- It's an exciting opening day at the Cannes Yachting Festival. Gulf Craft showcasing for the first time in Europe it's latest Majesty 100 superyacht which was launched at the 2017 Dubai International Boat Show. 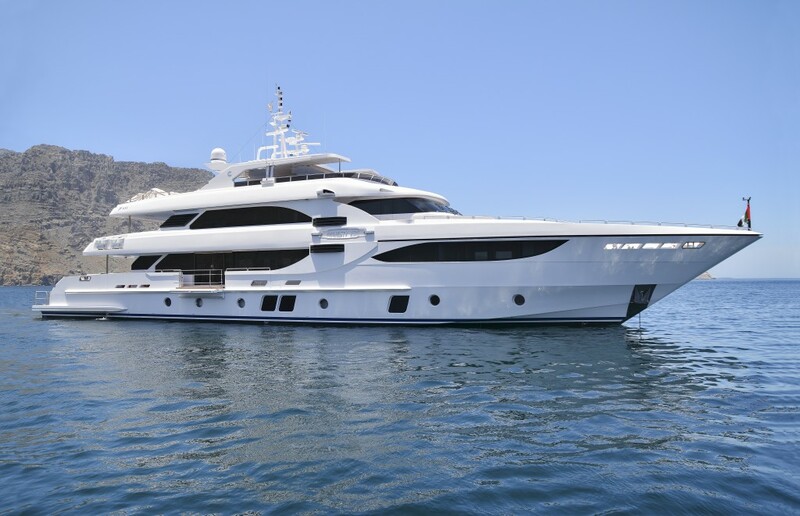 Also on display at the Majesty Yachts stand at SYE 224 is the Majesty 110. Cannes, France – 12 September 2017: As it celebrates its 35th anniversary, Gulf Craft made its European debut of the impressive Majesty 100, the newest addition to its line of Majesty Yachts – Superyacht Collection, at the 40th Cannes Yachting Festival this morning. Sky-lounge Majesty 100 is one of Gulf Craft's most revered superyacht designs. Here is one more article (in Russian) about the Majesty 100 in the summer issue of Sea Trial international yacht magazine. Male, Maldives- Maldives Transport and Contracting Company (MTCC) has signed as a priority partner of Gulf Craft. The partnership agreement was signed by Gulf Craft CEO Erwin Bamps and MTCC CEO Ibrahim Ziyath. Majesty 110 & Majesty 100 superyachts bound for Europe! 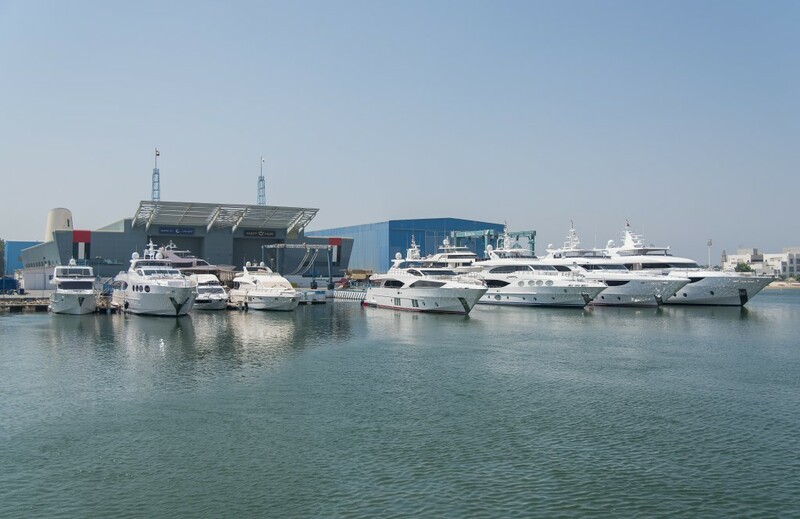 Gulf Craft gears up for the European Boat Shows as it sends off two of its most recently launched superyachts, a Majesty 110 & Majesty 100, on board the transport vessel Stellaprima to deliver them to France. Gulf Craft uploaded the latest virtual tour of our Majesty 110 superyacht. This superyacht was showcased at the 2017 Dubai International Boat Show. If you missed to see it at the show, here's your chance to tour the yacht online with all decks available for viewing. Click on any of the photos and start your exclusive viewing of this exquisite tri-deck superyacht. 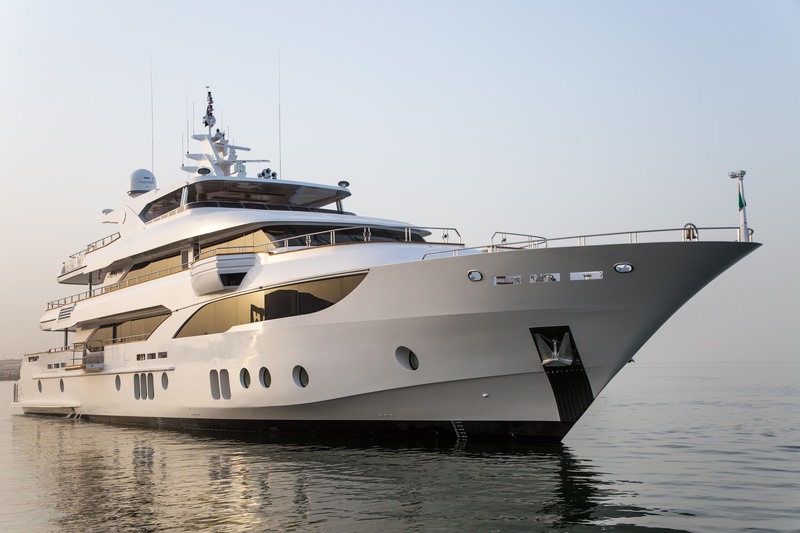 Gulf Craft's Majesty 100 can now be viewed in this latest virtual reality application using either Google Cardboard or Gear VR by Oculus. Dubai, UAE – 16 August 2017: Gulf Craft will put the world’s superyacht building fraternity on notice once again at Cannes Yachting Festival and Monaco Yacht Show, this year with the European debut of the latest superyacht addition to its Majesty Yachts brand – the Majesty 100. Dubai, 10 August 2017 – Gulf Craft has just announced the sale of a passenger vessel, a Touring 36, to a buyer in the remote Polynesian country of Tonga, a speck in the southern Pacific Ocean, more than 8,000 nautical miles from Gulf Craft’s Arabian Peninsula premises. Gulf Craft's Majesty 122 (M/Y Ghost II) is not the only UAE-built vessel that's enjoying the limelight at the Sydney International Boat Show. The Nomad 65, one of Gulf Craft's long range models from its Nomad Yachts series is also on display at the show. Grab a copy of the latest Sydney Boat Show edition of Ocean Magazine and check out their 'Chefs On Board' cover story featuring Master Chef Alessandro Pavoni cooking up his acclaimed menu on board the Majesty 122, M/Y Ghost II. Sydney, 1 August 2017 – Gulf Craft along with its Australian dealer, Australian Superyachts, will be participating in the upcoming 2017 Sydney International Boat Show exhibiting both the Majesty 122 (M/Y Ghost II) and the Nomad 65, representing Gulf Craft’s family of yachts specifically designed for comfortable long-distance crusing, underscoring the importance of the Australian market to the UAE based company. With thanks to Ghost Elite Charters, a luxury superyacht charter company boasting one of Australia’s finest crafted luxury motor yachts, for sharing this amazing charter video of the Majesty 122, M/Y Ghost II shot entirely in Sydney, Australia. Dubai, 26 July 2017 – A yachting connoisseur has made his fourth consecutive purchase from Gulf Craft – a sleek Majesty 155 superyacht. The superyacht model was named ‘Best Asian-Built Yacht’ at this year’s Asia Boating Awards for blending fine finishes with first-rate seagoing performance. Sales Executive Josh Cleaver of Australian Superyachts, Gulf Craft's Australian distributor, wrote about his experiences aboard a Nomad 65 yacht as it cruised to Sanctuary Cove, Queensland, and back again on the occasion of the Sanctury Cove Boat Show. SuperYacht, Russian International Yacht magazine, features a 10-page spread on Gulf Craft's premiere flagship superyacht, the Majesty 155. 12th July 2017- Gulf Craft opened its doors to 30 marine technology students from Delft University of Technology, the largest and oldest Dutch public technological university in The Netherlands. The tour was organized in cooperation with the Consulate of The Netherlands in Dubai. 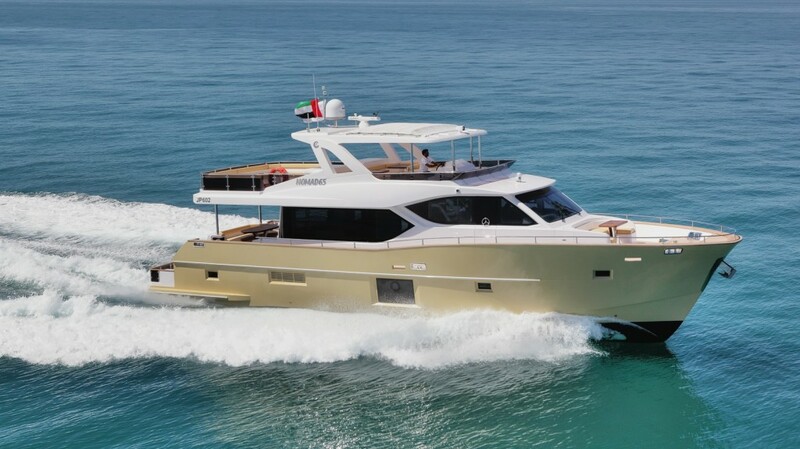 Do you want to see more of Gulf Craft's Majesty 155 ? Take a virtual tour onboard this magnificent superyacht by clicking on any of the photos below. New Dubai Showroom now Open! 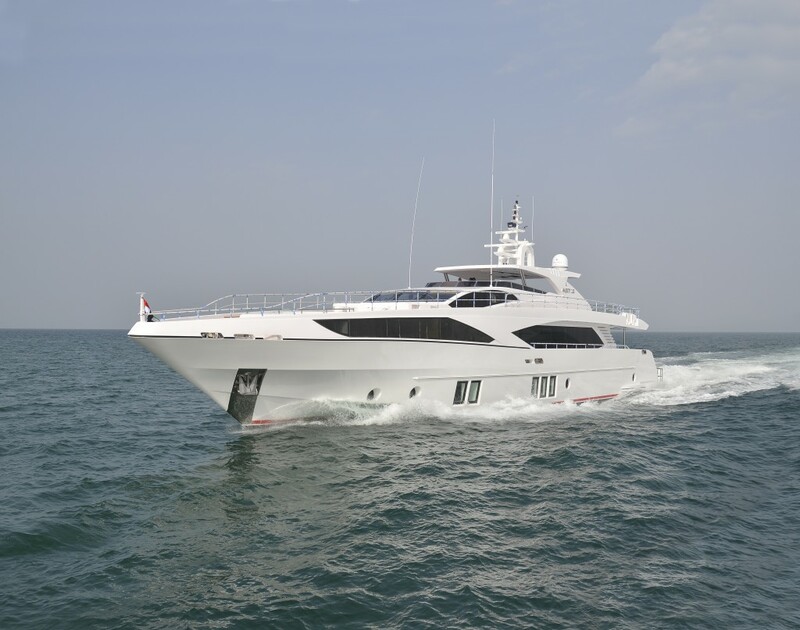 Gulf Craft has recently assigned Speed Marine for the Dubai based distribution and sales of its Oryx sport yachts & cruisers and Silvercraft family cruisers & fishing boats ranging from 27 up to 48 feet (8-15 meters). Motor Boat & Yachting Russia, one of Russia's leading magazines about yachting, showcases Gulf Craft's Majesty 155 superyacht in a 6-page editorial. Showcased at the Dubai International Boat Show, the Majesty 155 M/Y Sehamia superyacht features sophisticated design and state-of-the-art engineering. Gulf Craft has released the latest product video of the Majesty 155 shot entirely in Dubai while cruising the Arabian Gulf. The Majesty 100's immaculate exterior styling and uncompromised naval engineering makes it one of the most sought after superyacht models in the Majesty Yachts series of Gulf Craft. Italy's premiere marine lifestyle magazine Barche published a special feature on Gulf Craft's flagship superyacht Majesty 155 M/Y Sehamia in their June 2017 issue. 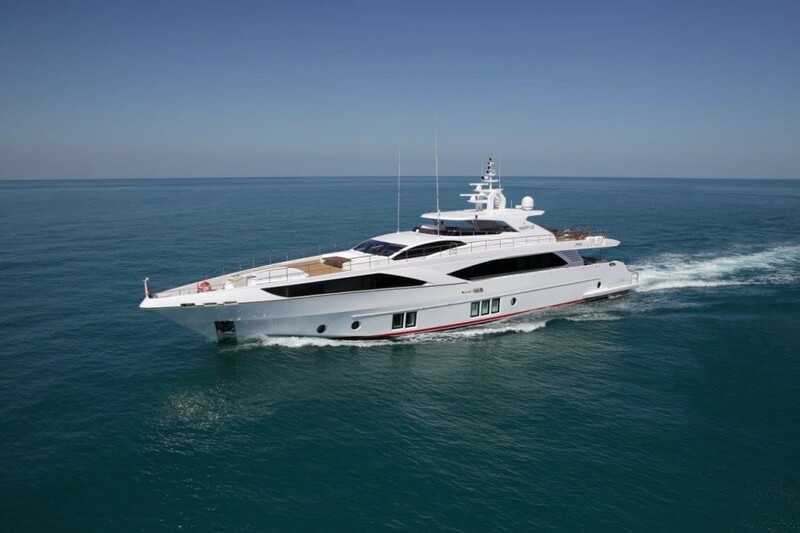 Gulf Craft's success is built on its ability to adapt to ever changing market trends. It values continuous product development which was recently manifested in the newly revamped Majesty 125 showcased at the 2017 Dubai International Boat Show. We have released the latest product video of the Majesty 125 superyacht on our Youtube channel! 28th May 2017- Gulf Craft & Australian Superyachts concluded their participation at the Sanctuary Cove International Boat Show on a high note with an overwhelming response to the Australian premiere of the Nomad 65. 23rd May 2017 Sanctuary Cove, Queensland, Australia- The 7th edition of the Australian Superyacht, Marine Export & Commercial Marine Industry Conference (ASMEX), organized by the Australian International Marine Export Group (AIMEX), was held before the opening of the Sanctuary Cove International Boat Show at the InterContinental Sanctuary Cove Resort from May 22-24. Check out the latest issue of Australia's premiere marine magazine, Ocean, for the article on the Majesty 122 Ghost II commercial charter in Australia. Chartering is an attractive prospect for any yacht owner in Australia. But, as Capt. Richard Morris of Australian Superyachts highlights, it’s important to know the lay of the land before you jump into a yacht purchase with the intention of going commercial. Gulf Craft celebrated its 35 years of craftsmanship with an annual gathering of more than 1,200 of its employees at its yacht & superyacht shipyard in Umm Al Quwain for a day of fun-filled activities, sports, arts, entertainment and of course, a few speeches, after enjoying a giant open buffet. During the recent Monaco Yacht Show, the Editor-in-chief of Boote Exclusive, Marcus Krall, interviewed Gulf Craft's CEO Erwin Bamps. The interview (in German) covered the company's expansion plans as well as its recent venture into the megayacht world. Product video of the new Silvercraft 48 HT, Gulf Craft's latest sport fishing design with stepped hull. In the picture she is showing off with 4 x 350 hp outboard engines in front of the Doha corniche in Qatar. 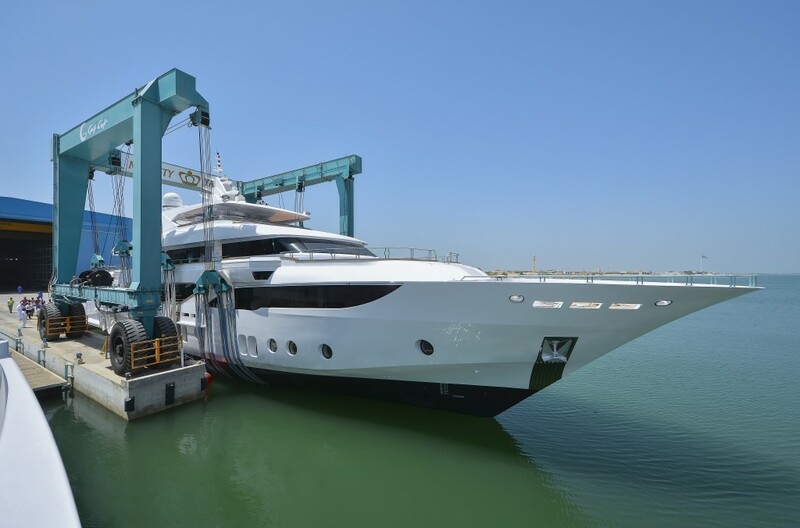 Gulf Craft has recently taken into operation a 75 ton marine travel lift in its Ajman service facility, thus increasing its capacity to service yachts as well as boats. This investment is part of its company-wide expansion plan that the company is undergoing in its different shipyards. Gulf Craft has the most diverse product range under one roof, and our yachts and boats have been created around emerging customer trends and requirements. This is why, by popular demand, the Silvercraft 36 HT model has been modified to include a lower deck cabin in the front. Gulf Craft’s Chairman had an exclusive interview with Al-Iktissad Wal-Aamal magazine following the success the company had in Dubai International Boat Show and Qatar Exclusive Event. 1 May 2017- Following its global debut at the 2017 Dubai International Boat Show, the stunning Majesty 100 was a sure hit amongst yachting enthusiasts being the first Majesty Yachts superyacht model with a sky lounge. Dubai, 3 May 2017 – Emirates-based Gulf Craft continues to eye global expansion amid what the company’s Chief Executive Officer, Erwin Bamps, is describing as an “evolutionary and exciting time for the leisure marine industry.” The award-winning yacht and boat builder recently forged new distribution partnerships, and has embarked on a program of major investments and a global strategy that puts evolving client demands at the center of product development. 1 May 2017- Today, Gulf Craft attended the Abdul Aziz Bin Humaid Leadership Program, which seeks to empower talented young people of all the GCC. Take a virtual tour of the latest addition to the Silvercraft line-up of family cruisers - the Silvercraft 36 HT Cabin. 25 April 2017: Characterized by her innovative design and her spacious lay-out, the Majesty 100 offers owners a seamless luxury cruising experience. From a unique skylounge fly-bridge – Gulf Craft’s first – and a powerful but efficient propulsion system, to lavish interiors and copious lounging areas, the superyacht’s magnificence can be seen throughout her generous 32-meter length. 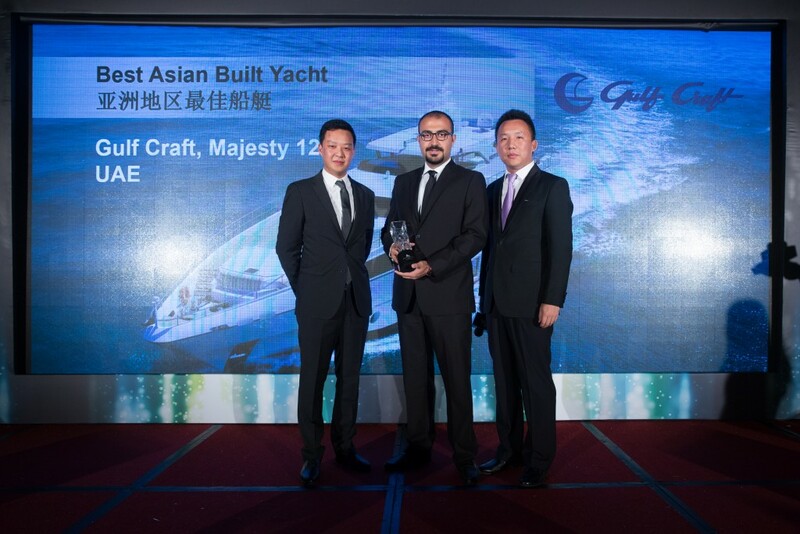 Singapore, 17 April 2016: Gulf Craft continues to put the UAE on the map in the manufacturing sector, having most recently received a prestigious award in Asia for its flagship superyacht – the Majesty 155. You missed to see it during the Dubai Boat Show? Or at Gulf Craft's Qatar Exclusive Preview? No problem. Gulf Craft's Silvercraft series of family cruisers & fishing boats has expanded with the addition of two brand new models- the Silvercraft 48 HT and Silvercraft 36 HT Cabin. 8th April 2017- Gulf Craft welcomed the members of the Dubai Marina Yacht Club rally programme at its shipyard in Umm Al Quwain for a special weekend tour. 9th April 2017 Singapore- Gulf Craft's congratulates its team for its priceless efforts during the Singapore Yacht Show including Promarine Yacht Sales, Pangkor Marina and Australian Superyachts. Gulf Craft is generally known for its wide range of luxury yachts and leisure craft, but the company is also producing an entire range of semi-custom built Utility Series vessels. 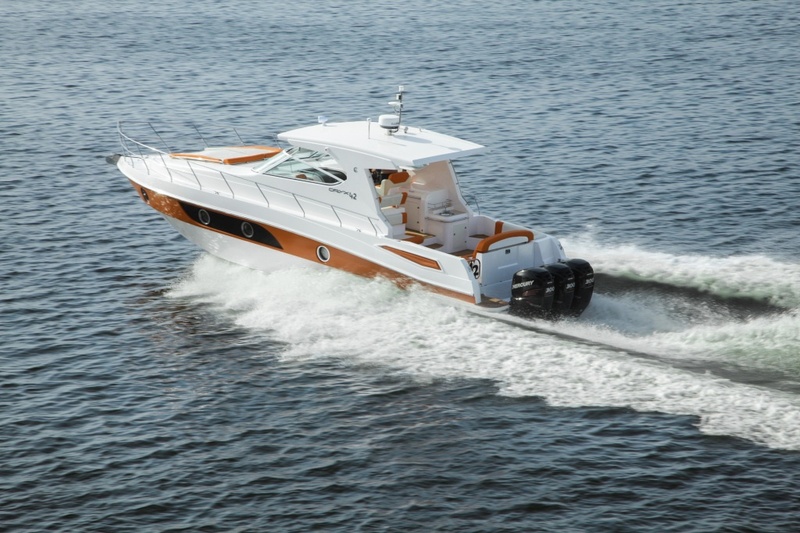 Over the past 35 years, Gulf Craft shipyards have produced thousands of water taxis, passenger, ferry or touring boats, diving boats, ambulance boats and patrol & fast intercept boats, mostly below 45 feet in length. 7th April 2017, Singapore- It's another wonderful sunny day at the Singapore Yacht Show as our Nomad 65 and Majety 48 basks in the summer sun awaiting guests to climb aboard for an exclusive tour. 7th April 2017, Singapore – Gulf Craft showcases samples of its innovative yachts series at this year’s Singapore Yacht Show, which runs from 6-9 April, presenting its long-range Nomad 65 and family-oriented Majesty 48 yachts at the event. 6th April 2017, Singapore- Singapore Yacht Show has kicked off and on display are 2 of Gulf Craft's novelties, Nomad 65 and Majesty 48. At this year’s Gulf Craft Exclusive Preview in Qatar, Gulf Craft and Bentley joined hands to highlight and promote yachting and luxury car ownership as part of the same luxury lifestyle. Five prestigious Bentley cars were on display along with Gulf Craft's 15 yachts and boats at the Pearl Qatar marina. 31 March 2017 Doha, Qatar- It's the last day of the special preview of Gulf Craft's line-up of Majesty Yachts, Nomad Yachts, Silvercraft and Oryx brand models on display at The Pearl-Qatar. 30 March 2017- It's the second day of Gulf Craft's Exclusive Preview at The Pearl-Doha. 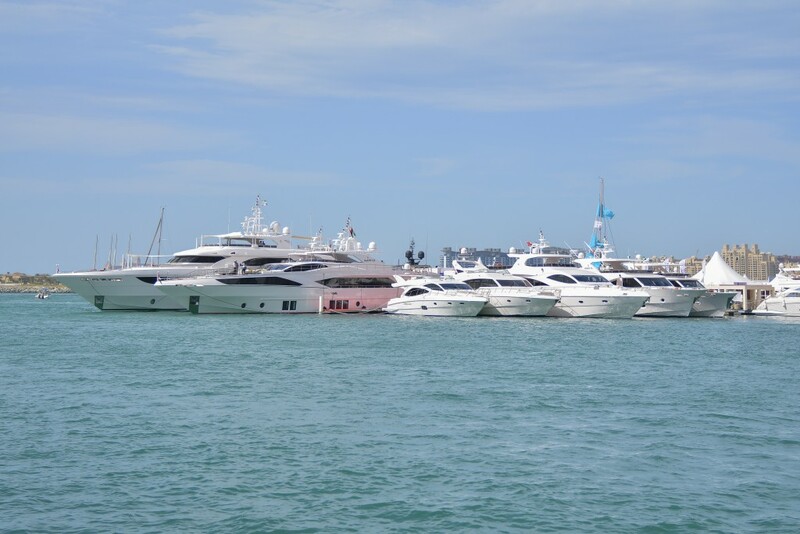 Guests arrived late afternoon for a special viewing of Gulf Craft's premium line-up of yachts & boats. 29 March 2017 Doha, Qatar- Gulf Craft's Exclusive Preview kicked off with a press conference held in the main deck seating area of its tri-deck Majesty 110 superyacht on display at The Pearl-Doha. 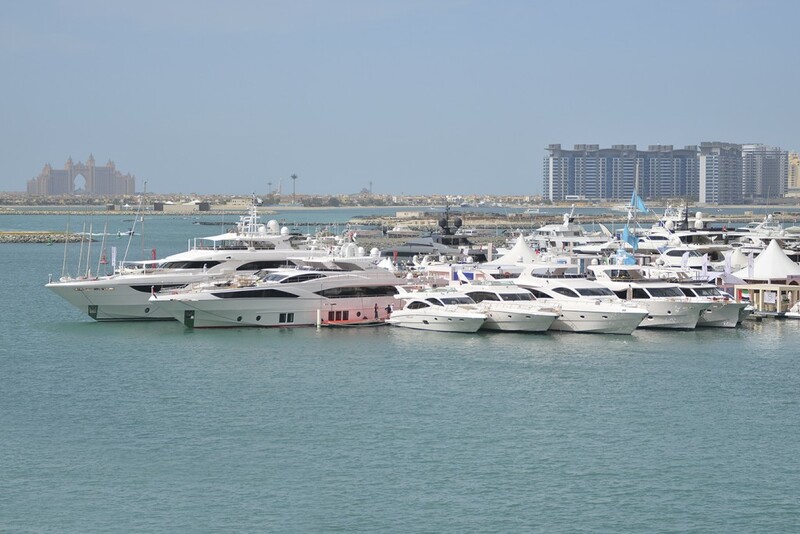 Doha, Qatar – 29 March 2017: Growing private wealth and marine developments in the country and across the region are combining to create a thriving leisure boating community in Qatar, according to the country’s market leader for yachts and boats, Gulf Craft. What better place to celebrate Gulf Craft's 35 years of craftsmanship then during the Dubai International Boat Show 2017! The annual event has always been one of the key platforms for Gulf Craft to showcase its world premieres. This year's edition saw the unveiling of the new Majesty 100 superyacht, the Silvercraft 48 HT fishing boat and the Silvercraft 36 HT cabin cruiser. Gulf Craft's expansion continues with the completion of a new launching bay at its service center facility in Ajman earlier this week. 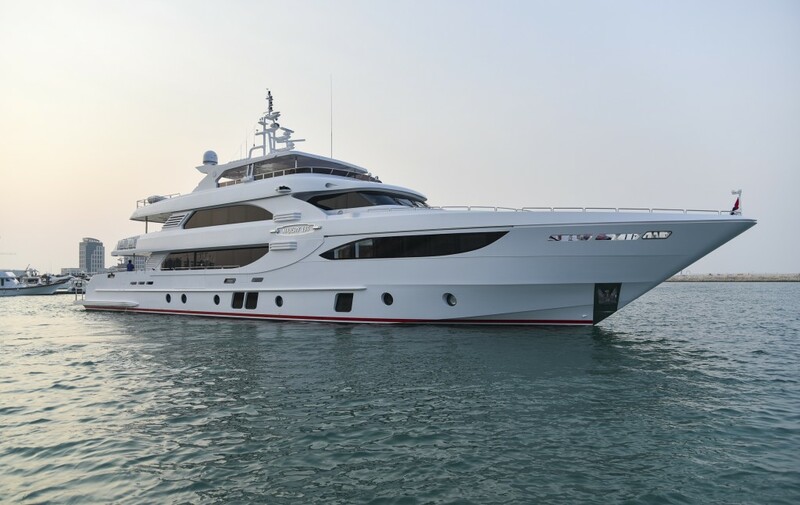 The new addition now enables the Gulf Craft's Ajman service center to service yachts and leisure craft up to 75 tons and approximately 80ft in length, up from the previous limitation of 15 ton leisure craft only. As with other craft in the Silvercraft range, this family and fishing craft is based around a center console design which maximizes deck space for both leisure and sporting activities. March 2017- It's the last stretch of the 4th edition of the Abdulaziz bin Humaid Leadership Program (ALP) organized by the Sheikh Abdulaziz bin Humaid Al Nuaimi Foundation since it started 6 months ago. Gulf Craft has sponsored the last week of the program with the theme 'My World' held at the Fairmont Hotel in Ajman. Gulf Craft, in cooperation with Exalto Emirates, proudly supported the 'Project Earth Initiative', conducted during the Dubai International Boat Show to help raise awareness on the impact of marine pollution in the environment. 12th March 2017 Fairmont, Ajman- Gulf Craft's Executive Management Officer. Abeer Alshaali, officially opened the 4th Edition of the Abdulaziz bin Humaid Leadership Program with the theme 'My World', held at the Fairmont Hotel in Ajman on March 12. Daily Mail Australia talks about Adele's R&R onboard the Majesty 122 M/Y Ghost II before her Australian tour. Maldives Chief of Defence Force Major General Ahmed Shiyam paid a courtesy visit to the Gulf Craft shipyard in Umm Al Quwain end of February. 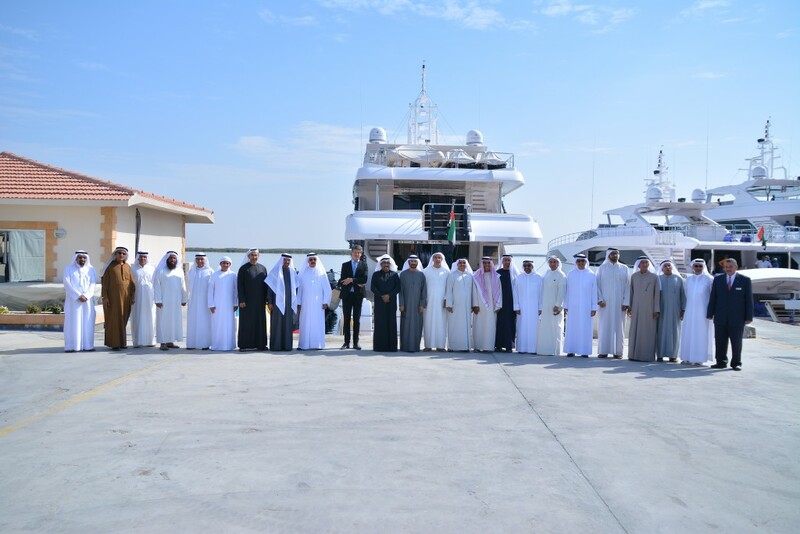 The Gulf Craft welcoming team was headed by Chairman Mohammed Alshaali and CEO Erwin Bamps. It's the last day of the Dubai International Boat Show and even with dark skies looming, guests still flocked to the Gulf Craft stand at the marina display area to see the variety of yachts & boats which Gulf Craft has to offer. The Majesty 155, Gulf Craft largest superyacht on display, was truly a sure hit amongst the crowd. 2nd March 2017, The Westin Dubai- Gulf Craft's Chairman, Mohammed bin Hussein Alshaali, was honored with the 'Lifetime Achievement Award' at The World of Yachts Recognition Awards held at The Westin Hotel in Dubai Mina Seyahi during the Dubai International Boat Show 2017. 3rd March 2017- The Dubai Boat Show was filled with excitement as HH Sheikh Mohammed bin Rashid Al Maktoum, Vice President and Prime Minister of the United Arab Emirates and Ruler of Dubai, entourage arrives at the show making his way to the Gulf Craft stand where the Gulf Craft team headed by Chairman Mohammed Alshaali awaits. 2nd March 2017- The show must go on rain or shine! The gloomy rainy afternoon didn't stop the yacht & boats fanatics from visiting the Gulf Craft stand at the Dubai International Boat Show. One of the highlights of the show was the visit of the Ruler of Ajman, HH Sheikh Humaid bin Rashid Al Nuaimi together with HH Sheikh Rashid bin Humaid Al Nuaimi. Dubai, UAE – 2nd March 2017: Emirates-based Gulf Craft today revealed that it has received yet another build order for the award-winning Majesty 135. 1st March 2017- Ruler of Fujairah, HH Sheikh Hamad bin Mohammed Al Sharqi's was warmly welcomed by Gulf Craft Chairman Mohammed Alshaali during his visit at the Gulf Craft stand along with the representatives from the Dubai World Trade Centre. Dubai, 1 March 2017 – Gulf Craft’s all-new superyacht, the Majesty 100, is proving to be a head turner at the Dubai International Boat Show, where the award-winning builder’s latest masterpiece made its global debut. Dubai, 28th February 2017- Gulf Craft opens the show with exciting news of its 35th anniversary and new boats & yacht global launches during its press conference at the Dubai International Boat Show together with Mohammed Alshaali- Gulf Craft Chairman, Erwin Bamps- Gulf Craft CEO & special guest, Dr. Saeed Hareb- Secretary General of Dubai Sports Council & Senior Advisor to the Dubai Boat Show. Dubai, 28 February 2017 – All eyes were on Gulf Craft at the Dubai International Boat Show, where the pioneering Emirates-based shipyard impressed guests with the largest fleet of yachts and boats on display, collectively worth well over AED 300 million and accounting for more than 20% of the total value of leisure craft on exhibit at the show. The industry trailblazer also announced multiple global debuts across its diverse portfolio of seaworthy innovations. Gulf Craft brings together a formidable fleet to quench boat & yacht enthusiasts' thirst for new trends in boating. Proud to be presenting you the video of the Majesty 155 & Majesty 110 cruising in the French Riviera after its successful debut at the European Boat Shows in Sept 2016. Dubai, February 2017 – Gulf Craft is preparing to make a lasting impression at the upcoming Dubai International Boat Show, as the shipyard plans to commemorate 35 years of yacht and boat building excellence with the largest showcase it has ever presented at the region’s premier marine luxury, leisure, and lifestyle event. With the build quality guaranteed by the Gulf Craft label, the Silvercraft 36 CC is a center console design which maximizes space on deck for both leisure and sporting activities. The Silvercraft 36 CC comes in two configurations with a cuddy cabin or open plan, allowing for a large seating area at the bow accommodating up to 14 people. With capacity for 4 rod holders on deck and an additional 5 holders on the aluminum T-top, this is the ideal craft for the sports fishing enthusiast. Gulf Craft CEO Erwin Bamps was invited as one of the guest speakers at the 4th UAE Maritime Forum 2017, the UAE summit of marine and maritime Leaders. The forum was held in Abu Dhabi on the 24th of January in Abu Dhabi hosted by TASNEEF and organized by Mare Forum. Drettmann International participates for the first time at the 2017 Dusseldorf Boat Show as Gulf Craft’s exclusive sales partner for the European continent and Russia for the builder’s flagship brand, ‘Majesty Yachts’ and the long-range ‘Nomad Yachts’ series. 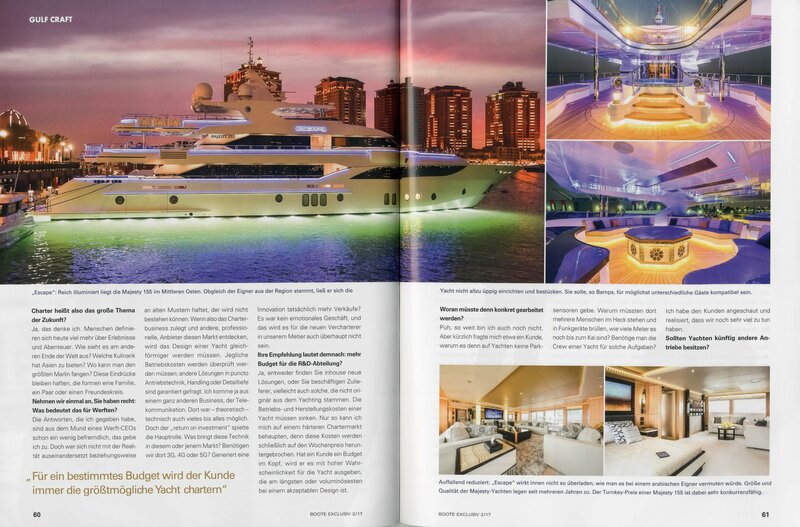 Italy's famous yachting magazine, Barche, features top superyacht builder from the Emirates, Gulf Craft, in the article 'Megayachts dal deserto' (Megayachts from the desert). 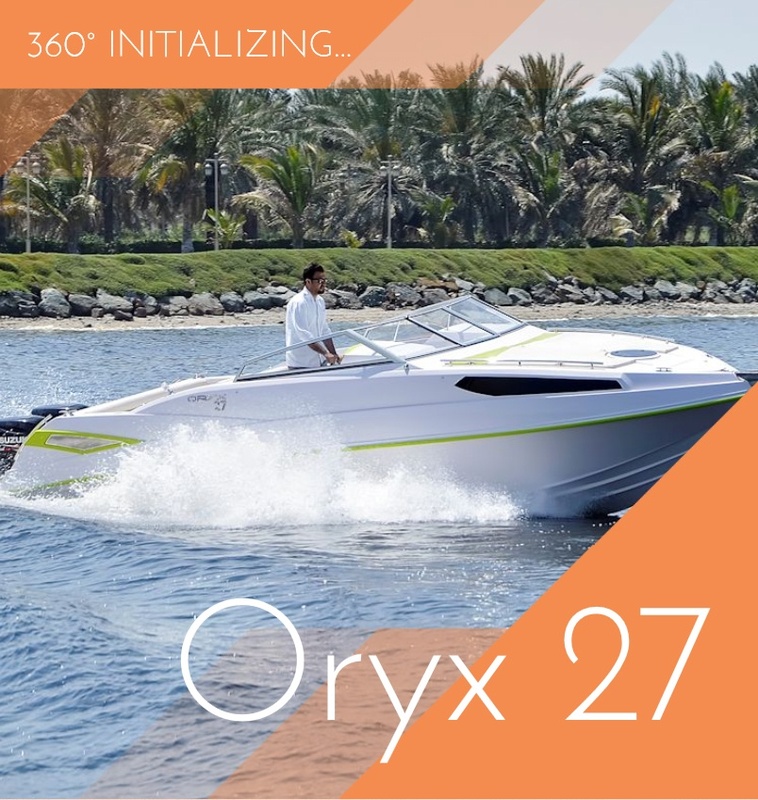 The Oryx 42 is one of the largest open cruiser model in the Oryx line of sport yachts and cruisers, which includes the Oryx 43 Fly, Oryx 36 and Oryx 27. 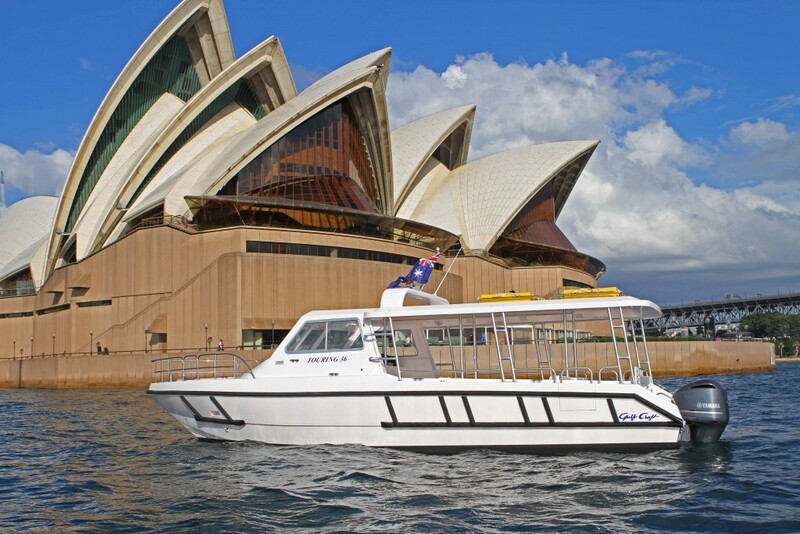 Here are new photos of the Nomad 65 cruising in the Sydney Harbour and around the famous Sydney Opera House courtesy of our dealer, Capt. Richard Morris from Australian Superyachts. Cannes, France- After their impressive debut at the 2016 European Boat Shows, the Majesty 155 and Majesty 110 met up at the South of France for this rare photo opportunity. Robb Report (Australia), one of the leading luxury-lifestyle magazine features the Majesty 122 M/Y Ghost II in its Summer 2017 edition in the article 'Free Spirit'. Phuket, Thailand- Pioneering yacht and boat builder Gulf Craft presented its luxurious Majesty 56 and Majesty 48 yachts and Silvercraft 34 family boat at the Phuket International Boat Show (PIMEX 2017) in cooperation with Go Boating Thailand. One of Italy's leading TV program for sailing & power boats, The Boat Show, takes a closer look at the Majesty 110, for an in-depth review of Gulf Craft's latest tri-deck superyacht. Gulf Craft's megayacht announcement at the Monaco Yacht Show 2016 drew a lot of interest in the press. Ed Slack of Superyacht Business sat down with Gulf Craft Chairman Mohammed AlShaali and CEO Erwin Bamps for an in-depth talk about Gulf Craft's plans of transforming the shipyard in preparation for the production of megayachts. Incumbent Vice-President of the Maldives, Abdulla Jihad, recently payed a courtesy visit at the Gulf Craft shipyard in Umm Al Quwain together with Deputy Under Secretary at the President's Office, Ilham Idris. Cannes, France- Following it's successful European debut at the Cannes Yachting Festival and Monaco Yacht Show earlier this year, Gulf Craft took its tri-deck superyacht, Majesty 110, out for a photo shoot in Cannes. Gulf Craft joined the 15th edition of the 'Clean Up UAE' campaign with the theme 'A united cause for a cleaner UAE'. 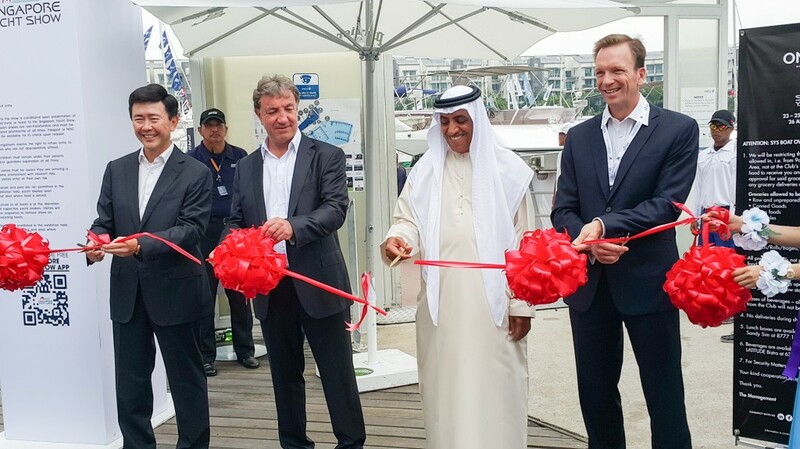 Dubai, UAE 7th December 2016: The much awaited inauguration of the Dubai Canal last November 9 marked another milestone for the Dubai boating community. It spans three-kilometers starting from Business Bay into the Arabian Gulf through Safa Park and Jumeirah with width ranging from 80-120 meters and around six meters deep. Gulf Craft's latest tri-deck superyacht, Majesty 110 is featured in the the December 2016-January 2017 issue of Altitudes Magazine (Arabia Edition), one of the Middle East's leading magazines in business aviation. 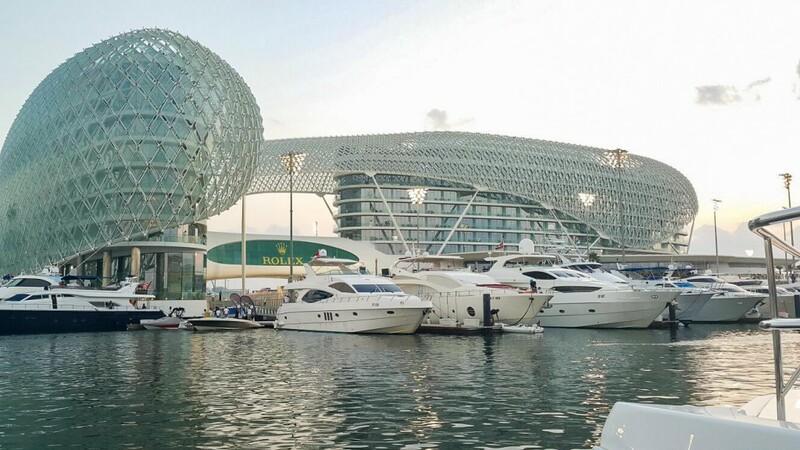 Abu Dhabi, UAE: The 2016 Formula 1 Abu Dhabi Grand Prix at Yas Marina Circuit will draw close to 100 yachts and boats, 20 percent of which were made in the UAE by Gulf Craft, and will be berthed for VIP viewing of the annual event. 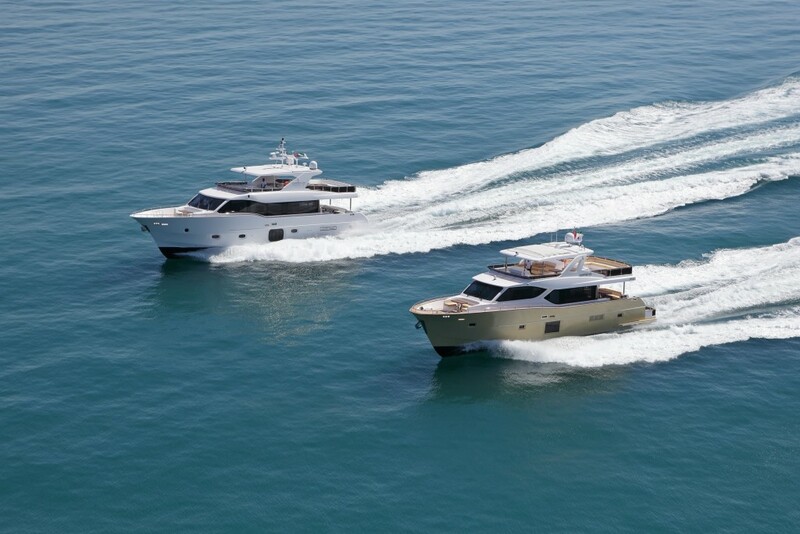 In addition to the ever-growing Gulf Craft fleet that are already located in Singapore, Gulf Craft has delivered 2 more vessels- Nomad 65 and Silvercraft 36 HT through our Singapore representative, ProMarine Yacht Sales. Hoterlier Magazine, Maldives' top-rated tourism magazine, talks with Gulf Craft CEO, Erwin Bamps about the company and the boat building industry in the Maldives. 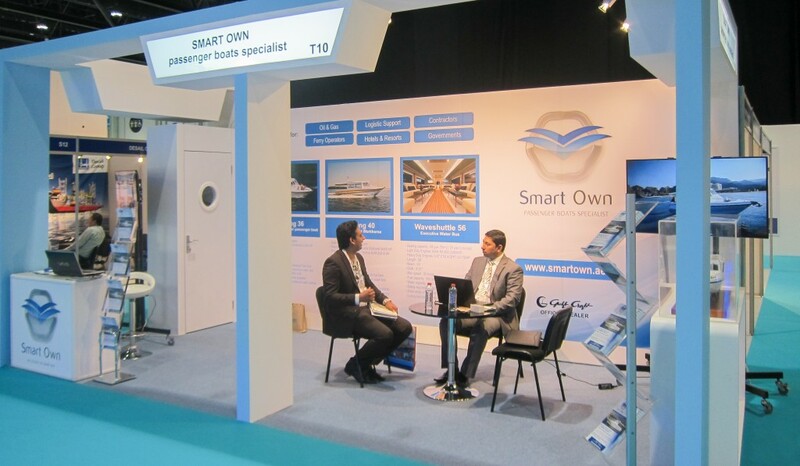 Gulf Craft has successfully concluded its participation at the Dubai Pre-owned Boat Show which was held last November 3-5. This year, four of its yachts were put on display at the Dubai Creek Marina- pre-owned Majesty 66, Majesty 48, Nomad 55 and Oryx 43 Fly inboard version. The show opened with the celebration of the UAE Flag Day on November 3. All the Gulf Craft yachts and boat are proudly Made-in-the-UAE. International guests were still surprised at the high level of quality that Gulf Craft has attained for more than 30 years of its manufacturing excellence. Dubai, UAE – 3rd November 2016: Emirates-based Gulf Craft raised the UAE flag high and proud on board its world-class yachts on display at the Dubai Pre-Owned Boat Show today. 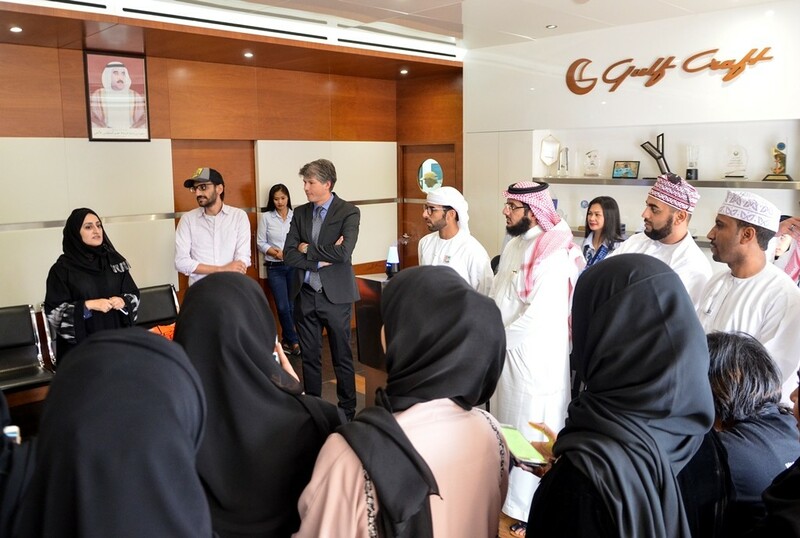 As part of Gulf Craft’s ongoing initiative to welcome students and future leaders and entrepreneurs onboard to witness the story we tell the world, Switzerland’s Lucerne School of Business visited the Gulf Craft Shipyard just north of Dubai in connection with the Dubai Study Week. The Majesty 122 M/Y Ghost II is gaining popularity in the Australian charter market with its striking black hull and metallic silver superstructure. This superyacht is now based in Sydney and offered for charter on the East Coast of Australia. Hailed as “the most significant superyacht to arrive in Australia for many years”, Ghost II is the custom designed and built, 37.3-metre (122-foot) Majesty Yachts that boasts a string of ‘firsts’ and will exponentially boost the credentials of the Australian charter market. The world’s most exclusive yacht magazine, Invictus, presents a yacht review of the Majesty 110 in the article ‘Spanning the Gulf’ in their September- October 2016 issue. Majesty 122 (Ghost II) finally arrived in Australia. Gulf Craft’s exclusive Australian distributor, Australian Superyachts, collaborated the sale & delivery of the vessel to its proud owners. Gulf Craft proudly displays its Majesty 155 and Majesty 110 superyachts at the 25th Monaco Yacht Show at the T-Central, Port Hercules. The show will be held from September 28- October 1. 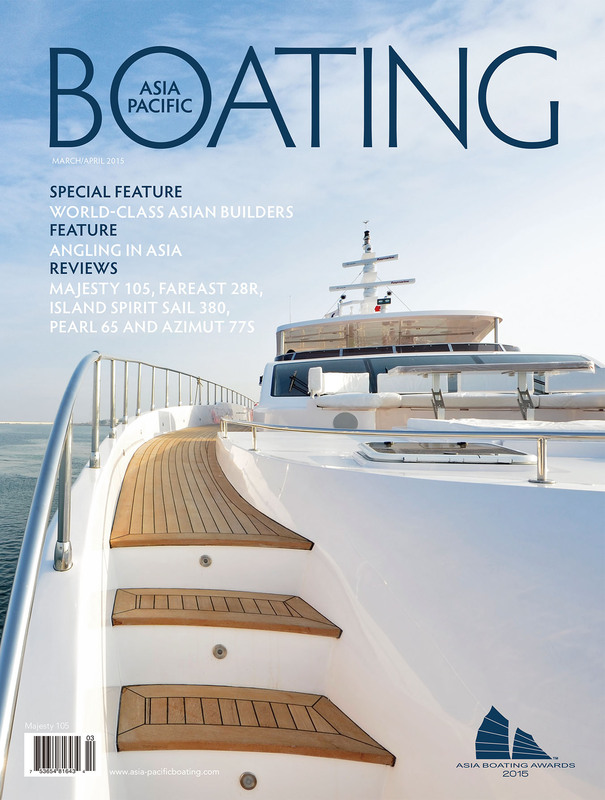 The September-October 2016 issue of Asia-Pacific Boating, premiere yachting magazine, features the Majesty 110 in the article, “Continuing to Amaze’, a well-fitting title for this tri-deck superyacht after receiving overwhelming response from the recently concluded European boat shows- Cannes Yachting Festival and Monaco Yacht Show. 9th October, 2016– Dubai Eye 103.8 FM‘s Richard Dean continues his Made in the UAE series – talking to Erwin Bamps, CEO of Gulf Craft, one of the world’s leading superyacht shipyards, based in the Emirates. In its 68th issue, Australia-based Ocean Magazine reviews Gulf Craft‘s latest tri-deck superyacht, the Majesty 110. Ms. Shari Liu Grimaldi, Luxury Director & Media Anchor at Superyachts.com sits down with Gulf Craft CEO, Erwin Bamps for an exclusive interview at their Breaking News Center during the Monaco Yacht Show. Original article & video courtesy of Superyachts.com. Ajman, UAE 9th October, 2016– The opening ceremony for the 4th edition of the Abdulaziz bin Humaid Leadership Program took place at Fairmont Ajman Hotel yesterday, and was attended by His Highness Sheikh Abdulaziz bin Humaid Al Nuaimi, HE Mohammed AlShaali, Founder and Chairman of Gulf Craft, HE Salem Al Suwaidi, Director General of the Ajman Chamber of Commerce and Industry, Mr. Yahya Al Jasmi, Managing Director of Ajman Holding, and a representative of Thumbay Group. Gulf Craft recently concluded a successful participation at the 3rd Maldives Marine Expo held in Hulhumalé, Maldives last September 27-30. The expo, with the endorsement of the Visit Maldives Year 2016 campaign, was carried out with a great focus on marine tourism in the Maldives. Superyacht News’ William Mathieson discussed the future of the new build market with Gulf Craft CEO, Erwin Bamps, during a tour of the yard’s new flagship at the Monaco Yacht Show. Original article here. Sochi, Russia– Gulf Craft, through its representative, Admiral Yachts, participated at the Imeretinskiy Boat Show held at the Imeretinskiy Yacht Marina, Ulitsa Golubaya, Imeretinskaya Valley, Sochi last September 30- October 1. 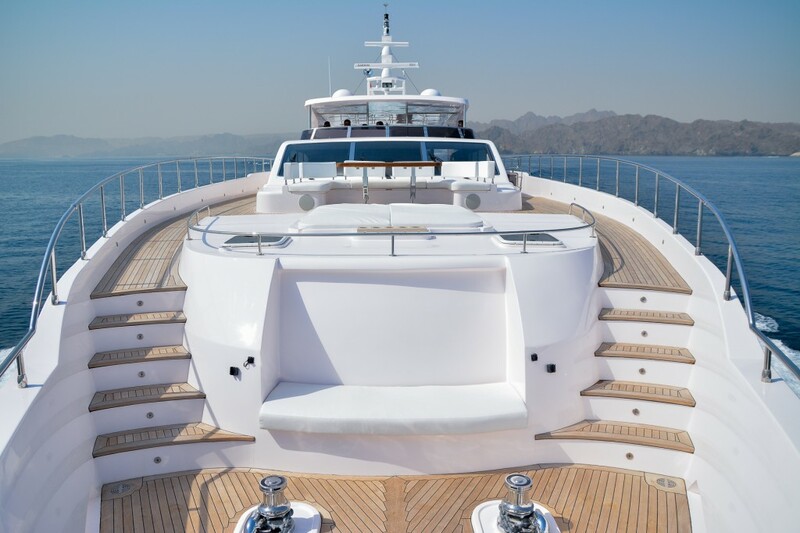 Emirates-based shipyard, Gulf Craft, showcased its largest superyacht, Majesty 155 at the Cannes Yachting Festival, while its latest tri-deck masterpiece, Majesty 110, intrigued guests. Vieux Port, Cannes- Gulf Craft has marked its presence at the Cannes Yachting Festival with two grand European debuts of the Majesty 155 (M/Y My Escape), the largest superyacht on display at the event and its tri-deck superyacht, the Majesty 110. Cannes, France - Gulf Craft, the world’s innovative builder of luxury yachts and leisure boats, is enjoying the limelight at the Cannes Yachting Festival showing off its flagship, Majesty 155, now suitably named as My Escape. The Majesty 155, proudly Made-in-the-UAE, boasts as the biggest superyacht on display at this prestigious event. France 6th September, 2016- It's a wonderful sunny day the Vieux Port in Cannes. Gulf Craft proudly puts on display at the Cannes Yachting Festival the Majesty 155, which is the biggest superyacht on display at the show and its newly launched tri-deck superyacht Majesty 110. Gulf Craft Maldives signed a purchase and sale agreement with the Maldives National Defence Force (MDNF) for speed boats. Present during the signing were Mohamed Zuhair- Maldives Minister of State, Maldives National Defence Force representatives, Erwin Bamps- CEO of Gulf Craft and Terry Stamatakos- Sales Manager of Gulf Craft Maldives. Following its official launch last July 2016, Gulf Craft, the world’s innovative builder of luxury yachts and leisure boats, has released the sea trial photos of the second edition of its award-winning Majesty 122 superyacht (M/Y Ghost II). Male, August 2016 - Gulf Craft's CEO, Erwin Bamps, had exclusive interviews with Raajje TV and Channel 13 during his recent visit to the Gulf Craft shipyard in the Maldives. Unveiled at the 2016 Dubai International Boat Show, the Majesty 110 is the latest addition to the Superyacht Collection of the Majesty Yachts brand of Gulf Craft. A unique venture into the world of tri-deck, Gulf Craft has taken its decades of experience combined with the need to elevate the yachting experience to a different class to create the Majesty 110. 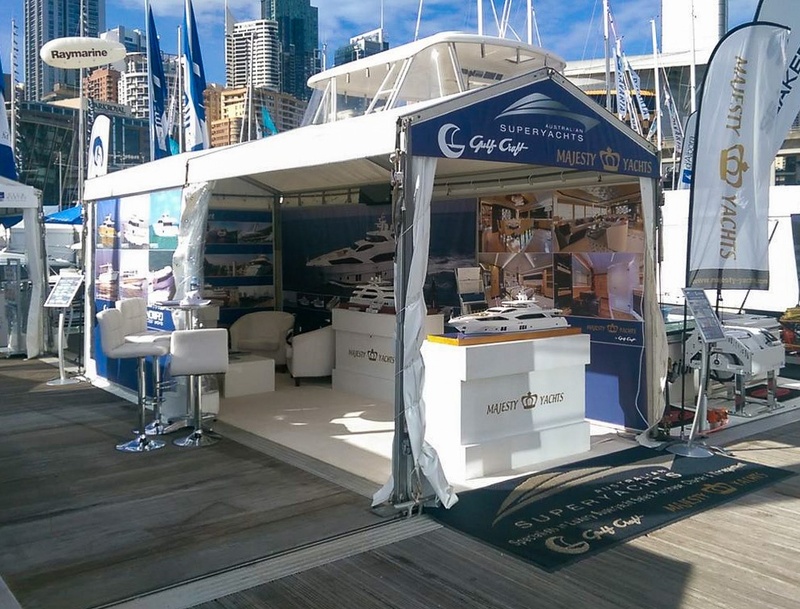 2nd Aug 2016- Gulf Craft in cooperation with its Australia counterpart, Australian Superyachts, wrapped up another successful participation at the Sydney Boat Show. Debuting at this year's show is the Nomad 65, a popular model in the Nomad Yachts series of Gulf Craft. 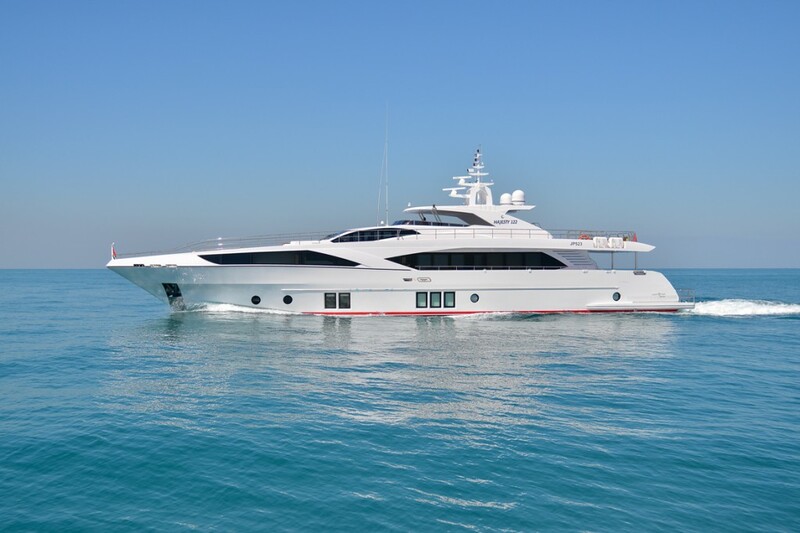 Gulf Craft has recently delivered one of its special projects, the Sea Lounge 40. Built according to the specifications laid out by our partner, Smart Own, for a Kuwaiti client allowing their management to closely inspect the work progress on their USD 3 billion over-the-water bridge project in Kuwait, the Sheikh Jaber Al-Ahmad Al-Sabah Causeway Project, which is one of the largest infrastructure projects to be constructed in the GCC region. The Doha Link is a 13 km long marine bridge structure crossing the south of Kuwait bay linking the Shuwaikh Port with the Doha motorway. Majesty 90 new video released! Since its successful launch at the 2016 Dubai International Boat Show last March and Gulf Craft's exclusive event in Qatar, the Majesty 90 has gained popularity quickly thanks to its innovative design. Gulf Craft's largest superyacht, Majesty 155, bags 'Best Yacht Installation' award at the CEDIA Awards for through its A/V entertainment systems provider, Archimedia. The CEDIA Awards was held last July 1 at the Guildhall in London. Gulf Craft's Oryx 43 Fly is available in two possible configurations, either an inboard or an outboard engines version. The recently introduced outboard version is powered by triple 300 hp engines. Superyacht Digest magazine, a monthly publication focused on the superyacht industry & luxury lifestyle, featured Gulf Craft and one of their latest superyacht models, the Majesty 110 in their May 2016 issue. 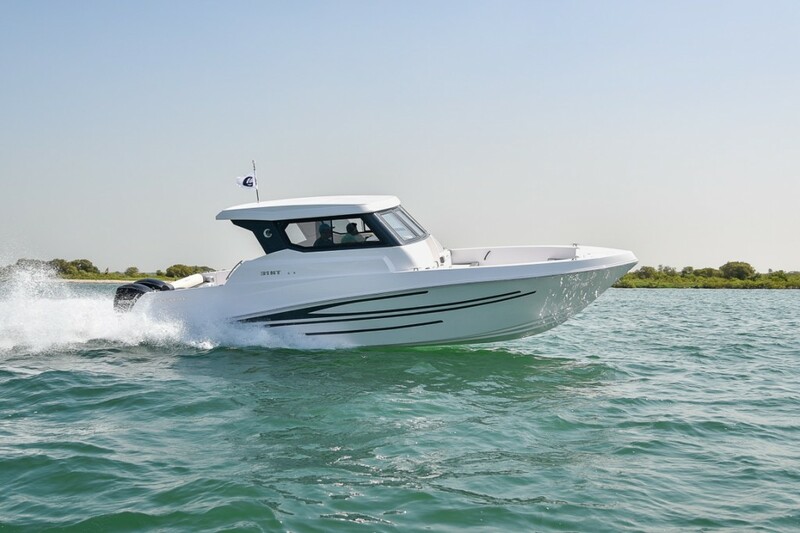 The Touring 36 is part of Gulf Craft’s Utility Series of passenger and transport boats - one of its most successful model ranges. It is popular as a charter vehicle and is sold through a network of dealerships across the UAE, Maldives, Africa and wider Middle East region. Gulf Craft, award-winning yacht and boat builder, has launched the virtual tour of its recently renovated Silvercraft 31 HT, boasting higher engine capacity, better utilization of space, and more ergonomic features, all complemented by a sleeker and contemporary appearance. Since its global launch at the March 2016 Dubai International Boat Show, the Oryx 43 Fly has gained popularity among sport yachts enthusiasts. This fly-bridge yacht is the largest model of the Oryx series of sport yachts & cruisers. Check out the new product video of the Nomad 55 which is now live at the Gulf Craft Youtube channel. Gulf Craft's largest superyacht, Majesty 155, has been shortlisted in the 2016 CEDIA Awards in the "Best Yacht Installation" category through its A/V entertainment systems provider, Archimedia. Experience this extensive online view of the new Majesty 90 featuring a 360 degree tour of each specific areas per deck layouts- main deck, lower deck and fly-bridge. The Majesty 90 is part of the Yacht Collection series of the Majesty Yachts brand of Gulf Craft. The new Majesty 110 was recently launched at the Dubai International Boat Show 2016. The youngest superyacht in the fleet of Majesty Yachts series of Gulf Craft is a tri-deck with ample interior space and great outdoor entertainment features. 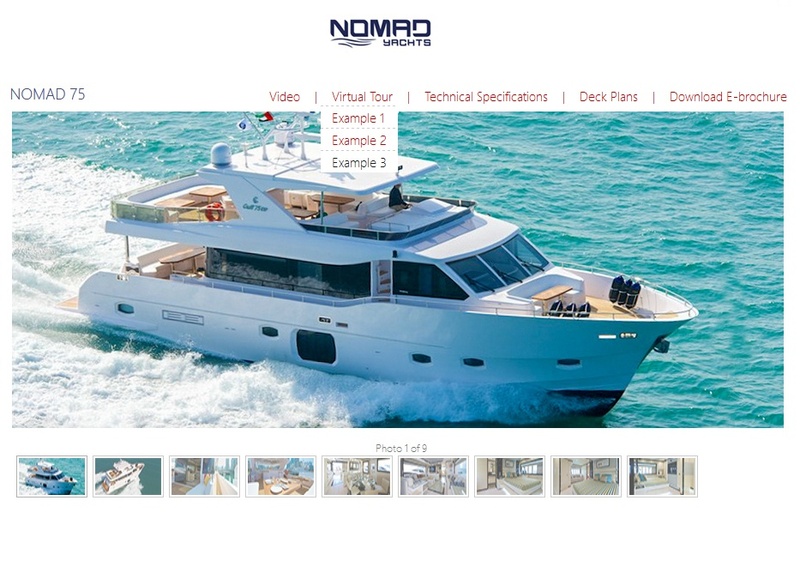 Gulf Craft has recently released the virtual tour of the Nomad 55, the latest addition to Gulf Craft's Nomad Yachts long-range series. The Nomad 55 is designed for those with an appetite for extended sea travel. This model was launched at this year's Dubai International Boat Show. Gulf Craft, the Emirate's award-winning yacht & boat builder, also takes pride in the provision of after-sales & warranty services to its clientele. Recently launched at the 2016 Dubai International Boat Show, the Majesty 110 is the latest superyacht in the Majesty Yachts series of Gulf Craft. A unique venture into the world of tri-deck, Gulf Craft has taken its decades of experience combined with the need to elevate the yachting experience to a different class to create the Majesty 110. 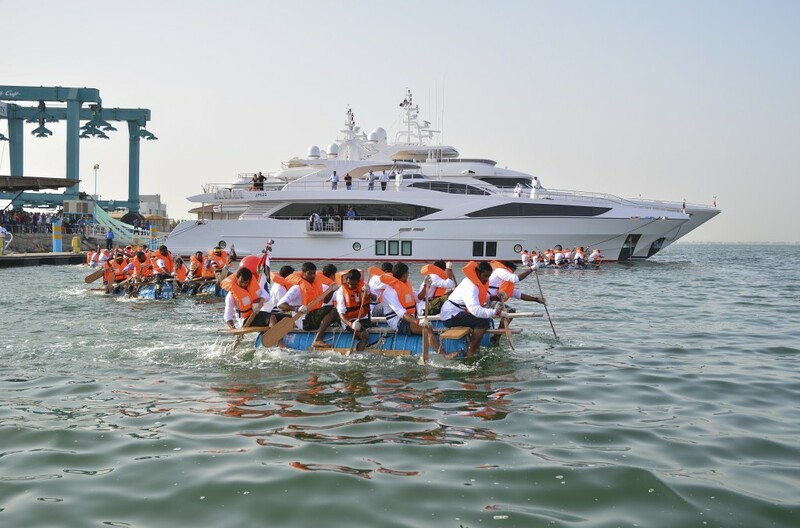 On April 14 distinguished yacht & boat builder based in the Emirates, Gulf Craft, celebrated its 34th year with its Annual Sports Day together with its 1,500 employees. The company stands proud and recognizes the capabilities and diversity of its workforce as one of the main factors of its success as a leading manufacturer of luxury yachts & boats. Gulf Craft, the distinguished yacht and boat builder globally premiered at the 2016 Dubai International Boat Show, the newest addition to its Nomad Yachts long-range series, the Nomad 55 – designed for those with an insatiable appetite for extended sea travel. 11th April 2016- Gulf Craft reaffirmed its commitment to Asia's diverse boating requirement after its successful participation at the recently concluded Singapore Yacht Show held on April 7-10 at the prestigious ONE° 15 Marina Club, Sentosa Cove. 3rd April 2016- Gulf Craft concluded another successful Exclusive Preview event at The Pearl-Qatar in Doha. The event was held at the Marina Gate 5 from March 30 till April 2. Oman's number one business magazine, Business Today, talks to Erwin Bamps, Gulf Craft's Chief Executive Officer. about what qualities that make Gulf Craft the leading luxury yacht manufacturer in the GCC, what are the significant features of Gulf Craft's Majesty Yachts brand, if the current economic crisis has affected Gulf Craft's business and what is the importance of the Oman market for Gulf Craft. The Majesty 155 , as well as Gulf Craft's Majesty 121, are seen in the video posted by Qatar Television last March 22, 2016. This 47m Majesty Yacht dubbed M/Y Escape was launched in 2015 at a private event at the Gulf Craft shipyard in Umm Al Quwain. It was recently delivered to its owner and The Pearl-Qatar in Doha is now its new home. At the recent Dubai International Boat Show, Emirates-based Gulf Craft has globally premiered three new yacht models- the long-range Nomad 55, tri-deck superyacht Majesty 110 and the luxurious Majesty 90. Dubai, 7th March 2016 -Gulf Craft culminates its 2016 participation at the Dubai International Boat Show on a high note. "This has been an excellent year for Gulf Craft, one of our best at the Dubai International Boat Show,” said Gulf Craft's Chairman, Mohammed Hussein Alshaali. Award-winning manufacturer, Gulf Craft, has conducted its latest Going Green Project at the local beaches of Umm Al Quwain. With the assistance of the UAQ Ministry of Public Works Service Department and UAQ Municipality, Gulf Craft has held a successful clean up of the beaches in the emirate of Umm Al Quwain on Saturday, February 13. 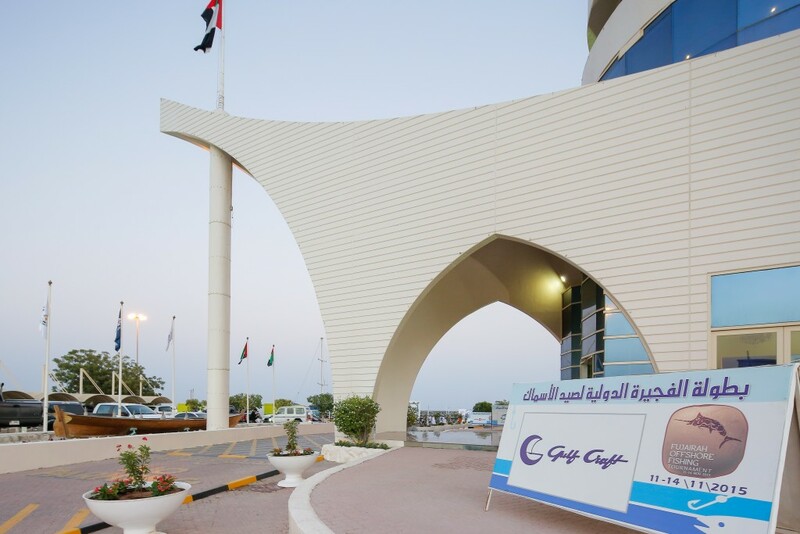 The UAQ Beach Clean-up Drive is Gulf Craft's way of giving back to the community. 8th February 2016- Gulf Craft received the confirmation from Boat International Media informing that not one, but three Majesty Superyachts- Majesty 155, Majesty 135 and Majesty 122, have been selected as finalists in the prestigious World Superyacht Awards 2016! Gulf Craft's biggest superyacht in the Majesty Yachts collection, the Majesty 155, is featured in the latest issue of Hadag, one of the leading marine lifestyle magazines in the GCC. Award-winning yacht & boat manufacturer, Gulf Craft, successfully held its second exclusive preview in the Sultanate of Oman last January 14-16 at the Almouj Marina in Muscat. Award-winning yacht and boat builder, Gulf Craft, together with its Thailand official representative, Go Boating Thailand, has once again made its mark at the Phuket International Boat Show (PIMEX), Thailand’s premier boating event with the grand display of its Majesty 105, the largest superyacht showcased at the show. With its ingenious utilization of indoor and outdoor space, clever fly-bridge and deck design and an extensive outdoor entertaining area, it’s no surprise the Majesty 105 has already turned plenty of heads. 15th December 2015- It was indeed a great experience for Gulf Craft being at the Masters of Luxury fair for the first time at the Amsterdam RAI held from December 10-14. 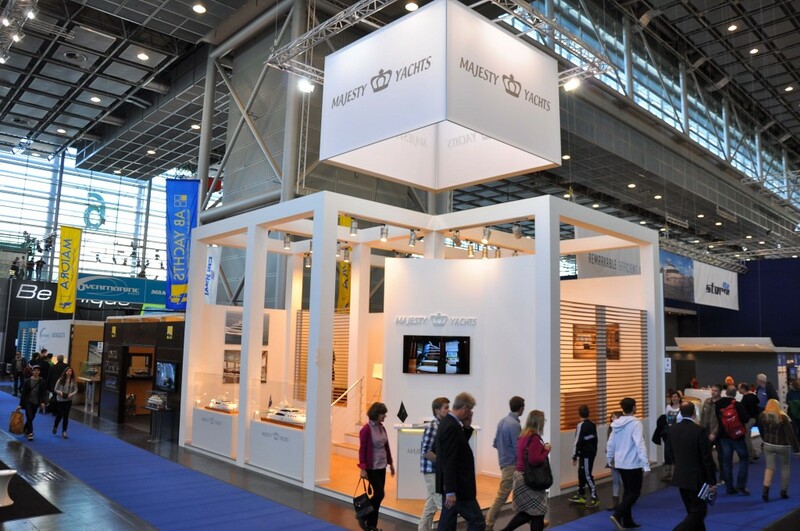 The Masters of LXRY is one of the biggest luxury events in The Netherlands where elite brands and products are combined into one fabulous world-class show. Dubai, December 2015 – Emirates-based Gulf Craft is gearing up for the highly anticipated Dubai International Boat Show 2016, where the shipyard will continue to redefine water leisure with a number of global premieres across its wide portfolio of premium yachts and boats. Gulf Craft brought the world of luxurious superyachts to this year's Masters of LXRY fair at the Amsterdam RAI, in cooperation with its BENELUX representative, Ocean's 500. 11th December 2015- Gulf Craft recently welcomed a group of 20 participants from the prestigious Abdulaziz Bin Humaid Leadership Program (ALP) to its Majesty Yachts and Nomad Yachts shipyard, where the aspiring young leaders had a unique opportunity to learn about some of the secrets of Gulf Craft business success story. Organized by the US-based publication, Boat International Media, the prestigious Showboats Design Awards, announces the finalists last November 2015 which included Gulf Craft's Majesty 155 and Majesty 135 superyachts. 4th December 2015- Under the patronage of H.H. Sheikh Mohammed Bin Hamad Al Sharqi, Crown Prince of Fujairah, the Fujairah International Marine Club organized the Fujairah Offshore Fishing Tournament, with Gulf Craft as one of its major sponsors. Formula 1 fever once again hit the United Arab Emirates! An international crowd flocked to Yas Marina Circuit in Abu Dhabi for the 7th Formula 1 Etihad Airways Abu Dhabi Grand Prix which was held from November 27-29. Dubai, 30 November 2015 – On 25 November 2015, Emirates-based Gulf Craft welcomed a large delegation of members from the International Council of Marine Industry Associations (ICOMIA), one of the world’s leading global trade entities representing the recreational marine industry. 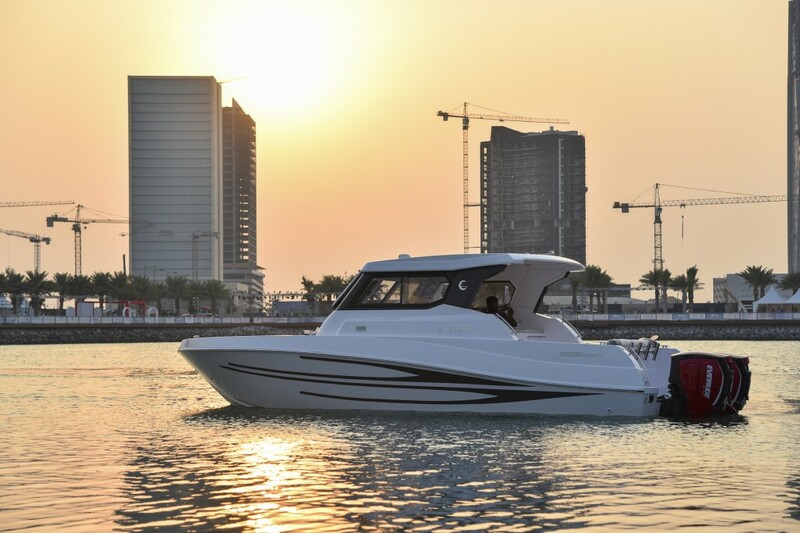 Together with the Silvercraft 31 HT, the Oryx 43 Fly yacht was successfully launched by Gulf Craft at the 2015 Qatar International Boat Show held from November 10-14 at the Mourjan Marinas, Lusail City in Doha. 22th November 2015- Gulf Times, Qatar's top selling English daily newspaper, has recently published their Q&A with Erwin Bamps, Chief Executive Officer Gulf Craft. Gulf Times newspaper is being distributed by Gulf Publishing & Printing Company (W.L.L.). We are introducing the all-new Silvercraft 31 HT- the latest boat model in the Silvercraft series of fishing boats & family cruisers of Gulf Craft. 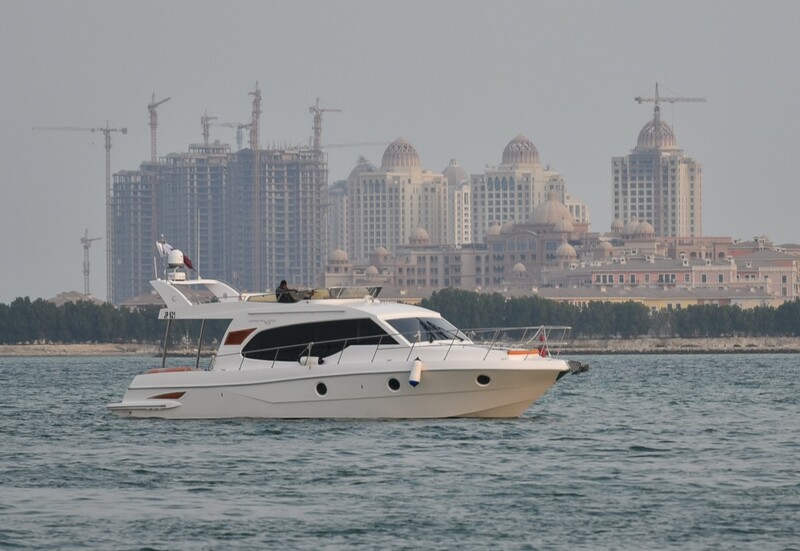 With its successful global premiere at the Qatar International Boat Show held last November 10-14 at the Mourjan Marinas in Lusail City, Doha, the Silvercraft 31 HT was one of the favorites. Gulf Craft's Majesty 122 is featured on the latest issue of the Yacht Premiere magazine (Issue 36) with a very generous 24-page spread entirely dedicated to this opulent superyacht. 15th November 2015- Gulf Craft's participation at the 3rd edition of the Qatar International Boat Show ends on a high note with the successful global premiere of two of its latest boat models- Oryx 43 Fly and Silvercraft 31 HT. The Silvercraft 31 HT is Gulf Craft's latest model in the Silvercraft series of fishing boats & family cruisers. 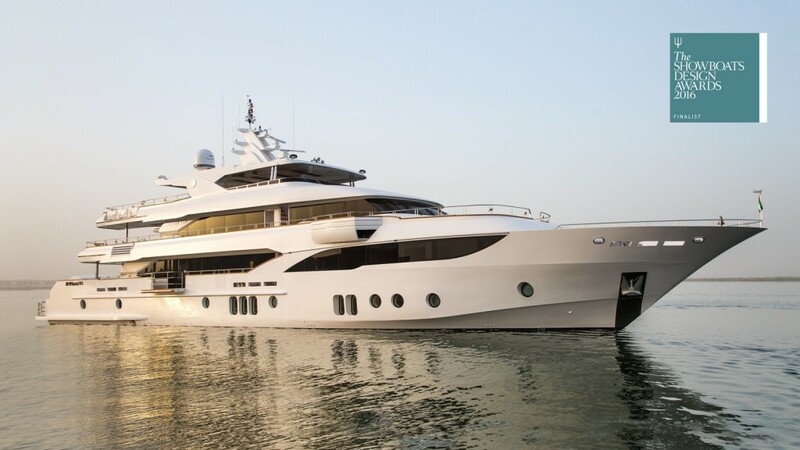 Doha, 10 November 2015 – Qatar’s growing appetite for luxury sea travel met Gulf Craft’s exquisite display of the 41-metre Majesty 135, the largest superyacht on exhibit at the Qatar International Boat Show. The award-winning yacht and boat builder also presented two global premieres of its latest innovations, a first time at the show. 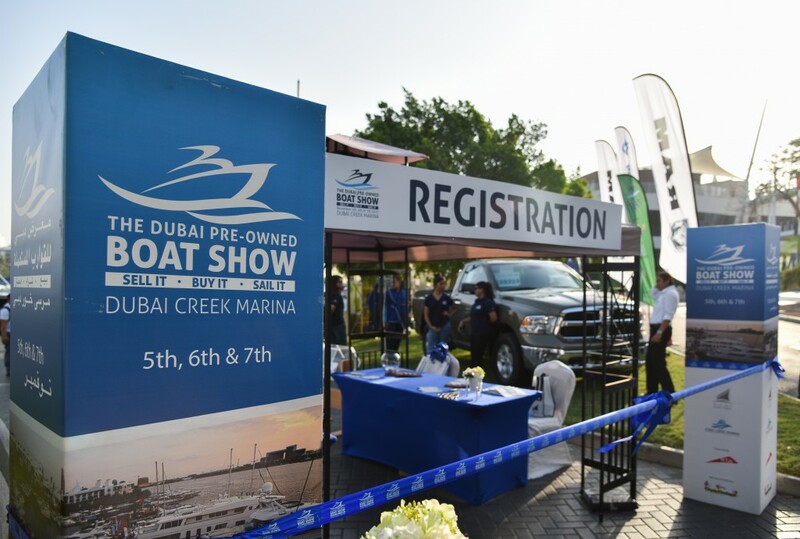 The 5th Dubai Pre-owned Boat Show proved to be a worthwhile platform not only for Gulf Craft's pre-owned buyers but also for customers who are looking to buy brand new yachts & boats. 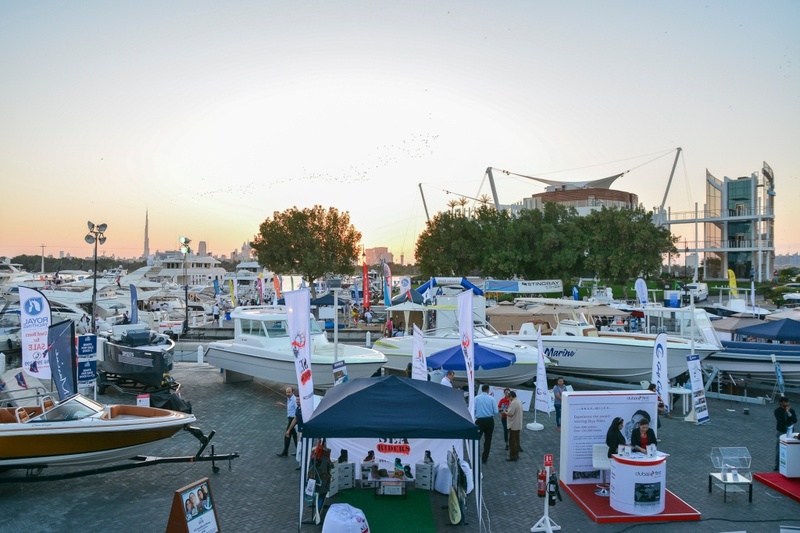 The Dubai Pre-owned Boat Show officially opened on November 5 held at the Dubai Creek Golf & Yacht Club. Entrance to the event was free. 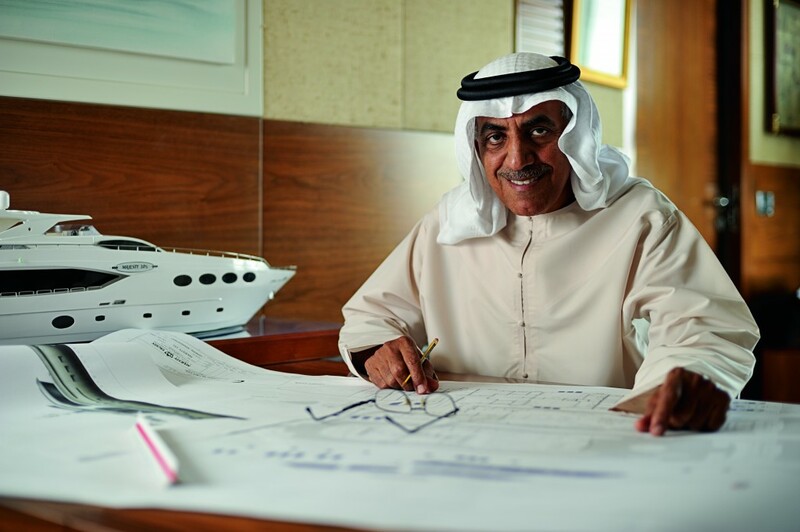 "From small boats to yachts and superyachts, Mohammed Hussein Alshaali is the man behind the visionary achievement that is Gulf Craft. Spearheading the impeccable creativity, extensive knowledge and innovative thinking that Gulf Craft has demonstrated across three decades, he unveils how he managed to ride the wave of success amidst the currents of change." 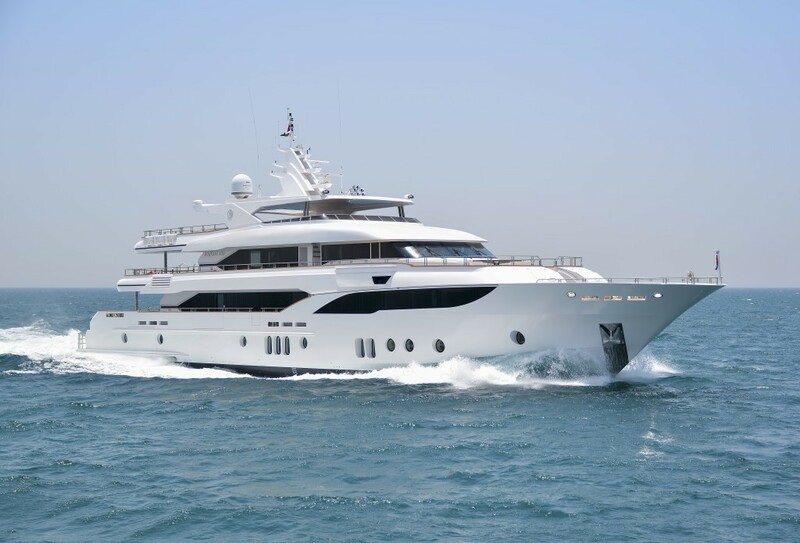 Doha, 5th of November 2015 – Qatari boat enthusiasts are gearing up for what is anticipated to be a striking presence by Gulf Craft, including the largest superyacht on display at the Qatar International Boat Show. Gulf Craft looks forward to meeting you at the 5th Dubai Pre-owned Boat Show, which will be held on November 5-7 at the Dubai Creek Marina. November 1, 2015- Gulf Craft's Australia dealer, Australian Superyachts, recently delivered to a Sydney-based corporate client a passenger boats from the Utility Series, the Touring 36. SuperyachtDigest.com Editor-In-Chief, Pamela Paci, sat down with Gulf Craft CEO, Erwin Bamps on the 2nd day of the Monaco Yacht Show on board the Majesty 135 for a special interview. Below is the article from Superyacht Digest. 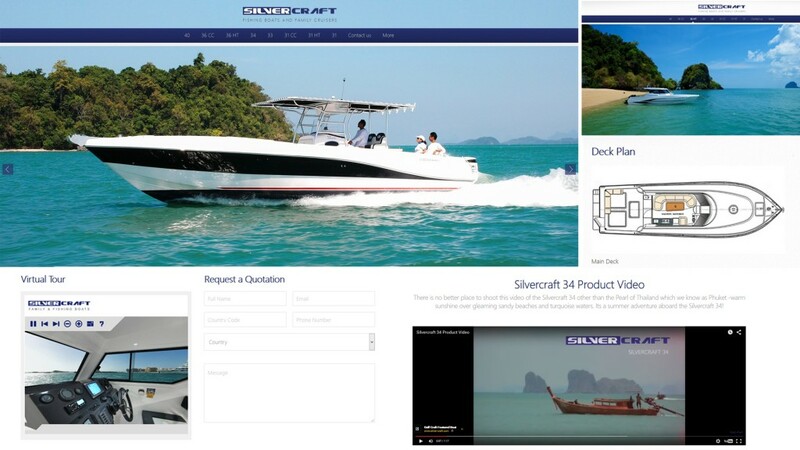 Gulf Craft has recently launched its revamped Silvercraft website. The website features the Silvercraft series of family & fishing boats ranging from 31- 40 feet. It is available in mobile and PC versions as well as in English & Arabic languages. 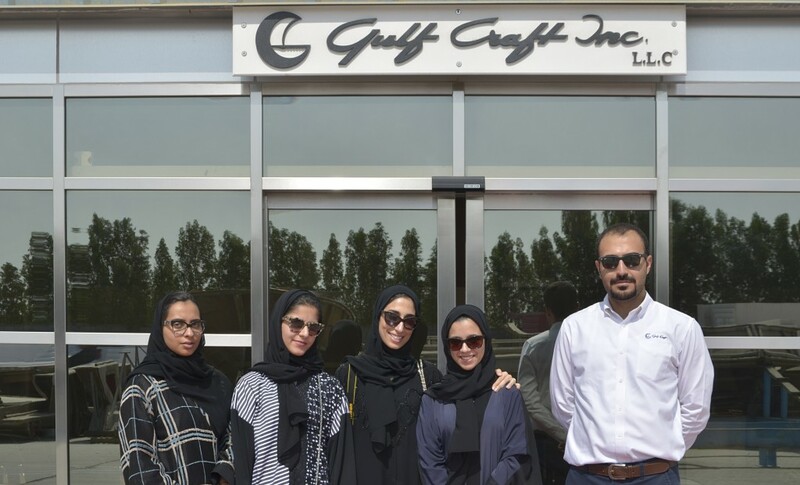 With nearly 2,000 employees, and a vertically integrated business model, Gulf Craft's workforce displays a wide variety of different cultures, languages, nationalities and professions. 19th October 2015- Erwin Bamps, Chief Executive Officer of Gulf Craft, was invited to the Qatar International Boat Show Press Conference as one of the panelists. The event was held yesterday at the Wyndham Grand Regency Hotel in Doha, Qatar. 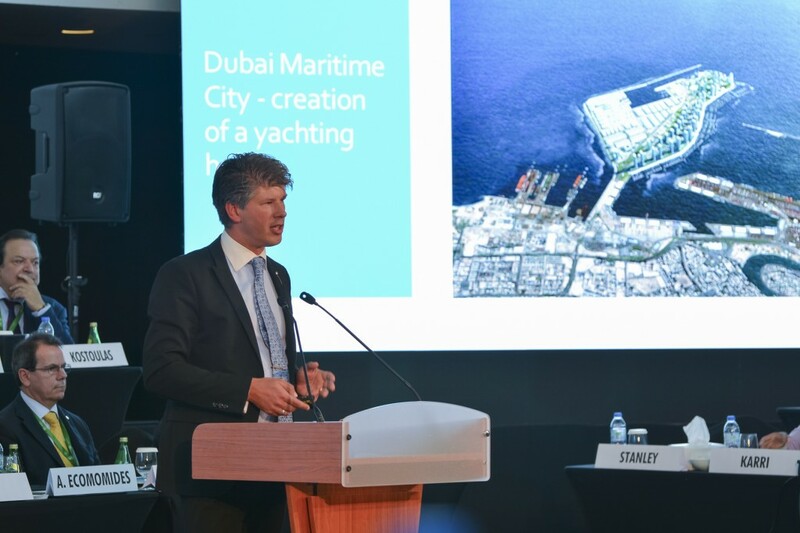 Dubai, 14 October 2015 – The Middle East’s dynamic economy, growing affluent population, and flourishing waterfront developments make it a promising yachting destination, but Chief Executive of UAE-based shipyard Gulf Craft, Erwin Bamps, says more needs to be done to attract sea travelers to GCC waters. Ultra Sea, P1 Magazine features this month Gulf Craft's latest and largest superyacht, the Majesty 155 in the article "Your Majesty". P1 Magazine is a of the top rated app magazine and news site. 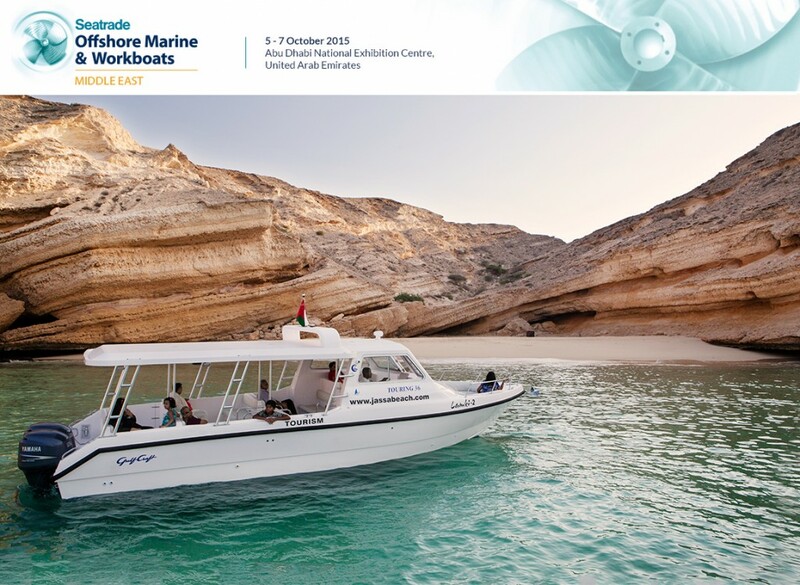 9th October 2015- Gulf Craft & Smart Own have concluded its first successful participation at the Seatrade Offshore Marine & Workboats expo held from October 5-7 at the Abu Dhabi National Exhibition Center (ADNEC). Dubai, 08 October 2015 – Luxury brands in the UAE play a valuable role in cementing the country’s growth as a knowledge-exchange hub globally and regionally, says Erwin Bamps, CEO of award-winning shipyard, Gulf Craft. Superyachts.com interviewed Erwin Bamps, CEO of Gulf Craft at their Breaking News Centre during the Monaco Yacht Show. With the Majesty 135 on display at the 2015 Monaco Yacht Show, Gulf Craft were not only displaying one their most recent launches, but a new phase in the future of the UAE yacht builders advancing mix of innovation and luxury. The Seatrade Offshore Marine & Workboats 2015 offers a platform untapped in the global marketplace. Its an event that brings together decision makers and buyers from a geographic marketplace that includes the mighty African Continent, the growing Caspian Sea area, the Indian Subcontinent and the Middle East. Here is a first behind-the-scenes shot taken during the Majesty 155 and Lamborghini Huracán sports car photoshoot. 28 September 2015- Award-winning yacht & boat builder, Gulf Craft, has released the official product video of its largest superyacht, the Majesty 155. The 47 m displacement luxury motor yacht Majesty 155 has been superbly designed in partnership with Massimo Gregori Grgic, naval architect of Yankee Delta Studio from Italy. Monaco, 27 September 2015 – Gulf Craft’s display of the Majesty 135 mesmerized visitors at the Monaco Yacht Show last week, drawing in crowds to experience the largest superyacht the award-winning shipyard has ever showcased in Europe. Gulf Craft preps up for its grand presence at the Monaco Yacht Show this year including a stunning display of the largest superyacht it has ever brought to Europe – the Majesty 135. 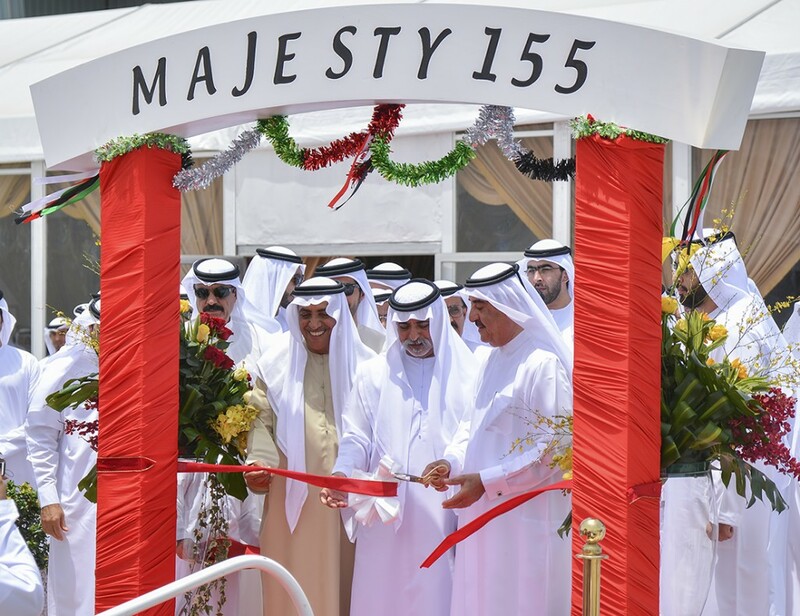 Sunday, 20 September 2015, By Charl van Rooy- Unveiled during a royalty-attended ceremony in June at Gulf Craft’s facility in the UAE, the Majesty 155 became the largest yacht to emerge from the sheds of the Middle Eastern ship builder yet. Invictus magazine features a staggering 12-page write-up on Gulf Craft's largest superyacht to date, the Majesty 155, in their latest Summer 2015 issue (no. 12) entitled "Ship of the Desert". At Gulf Craft, we envision a future where UAE nationals take center stage in the progress of the country’s maritime industry. Homegrown talent is key to the sustainable development and growth of any country, and we strongly share the UAE leadership’s commitment to investing in and supporting the next generation of Emirati professionals. 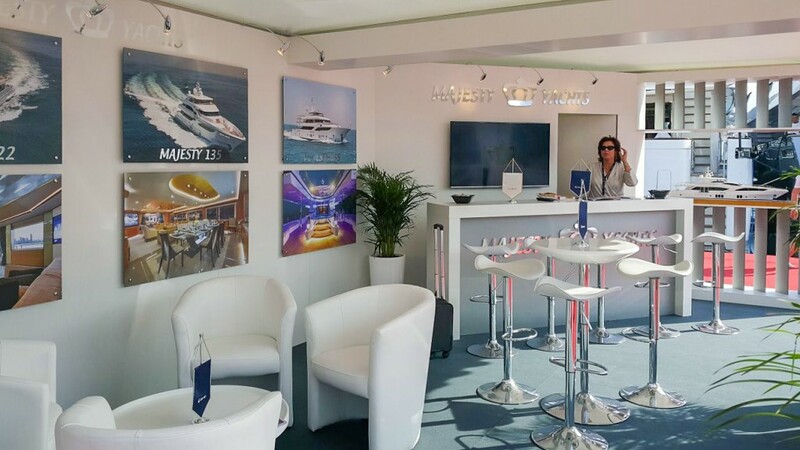 14 September 2015 - Gulf Craft, in partnership with its Majesty Yachts distributor in France, Aurora Yachts International, concluded its participation at the Cannes Yachting Festival held at the Vieux Port in Cannes from September 8-13. 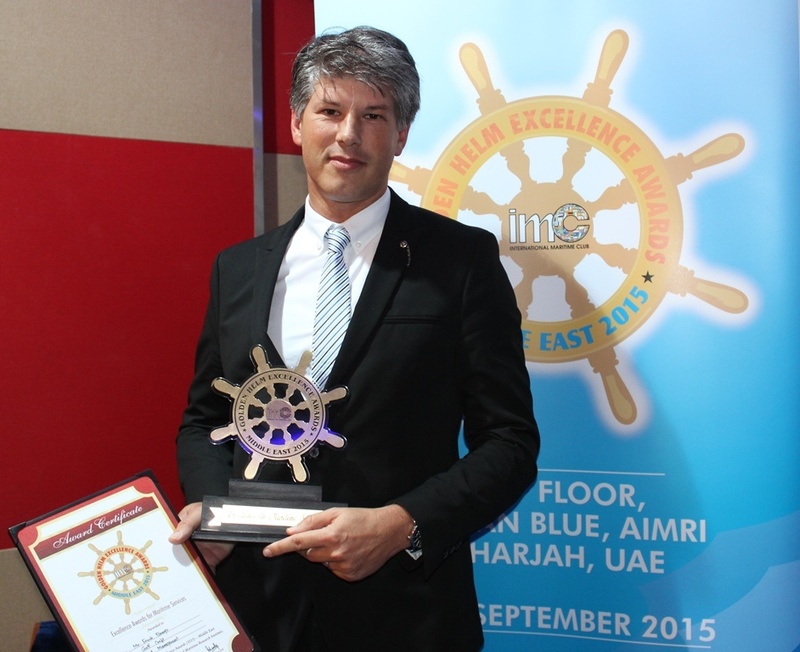 12 September 2015 - The International Marine Club (IMC) held an exclusive awards ceremony at the Ocean Blue (AIMRI) in Sharjah on September 9. Following its formal launching event at the Majesty Yachts shipyard last June 2015, the Majesty 155, is hailed as Gulf Craft‘s largest and latest superyacht model. Gulf Craft has released the new exterior and exterior photos of the Majesty 155. The Majesty 155 is a 47m displacement superyacht designed together with Massimo Gregori Grgic, naval architect of Yankee Delta Studio from Italy. She provides supreme luxury and comfort, from an ornately designed fountain on the sundeck, surrounded by a generous seating area, to an amazing waterfall that cascades from the rear sundeck into the Jacuzzi positioned on the upper deck. The Majesty 155 elegant exterior design. 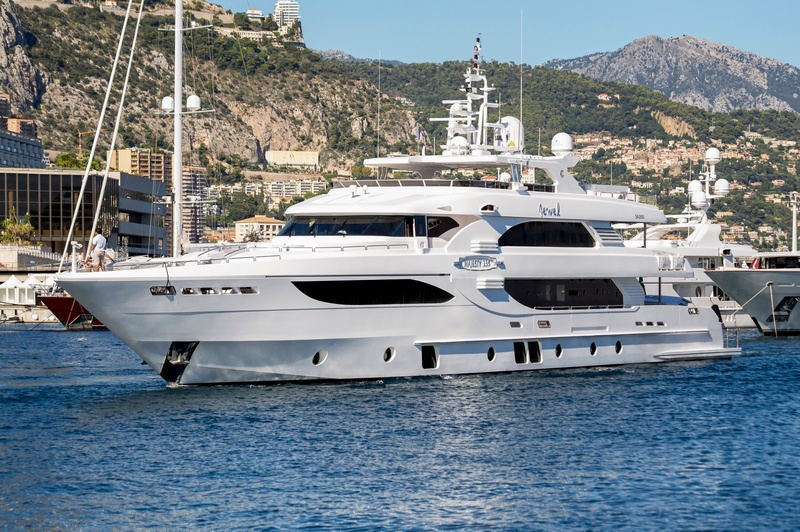 Accommodation aboard Majesty 155 yacht is provided in a gorgeous owner’s stateroom, boasting the finest fabrics as well as leathers, with counter tops constructed from cappuccino onyx and crema marfil marble. It features a balcony, as well as a breath-taking cigar lounge, with a ceiling crafted from genuine cigar leaves. The lower deck guest staterooms are finished using the best red and green onyx and botticino royal marble. The lower deck of the Majesty 155 offers an amazing beach club, featuring a pantry, a retractable television, and a spacious lounging area. There is also a large garage behind the beach club, which can store a tender as well as two jet skis, all comfortably moved in and out with a crane. 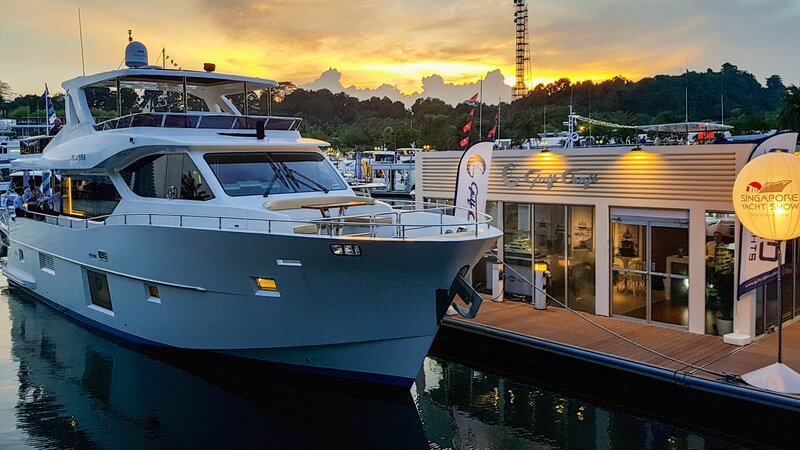 Gulf Craft, in cooperation with ProMarine Yacht Sales (Singapore) and Pangkor Marina (Malaysia), has successfully concluded its third participation at the Indonesia Yacht Show held at the Batavia Sunda Kelapa Marina in Jakarta, Indonesia, from August 21 until 23. Jakarta, 19 August 2015: Gulf Craft is set to showcase one of the most acclaimed superyachts from its ever-expanding portfolio, the Majesty 105, at the upcoming Indonesia Yacht Show, an event which caters to Southeast Asia’s largest luxury market by population. DUBAI, 13 August 2015: Gulf Craft will have a grand presence in Cannes and Monaco this boat show season, including a stunning display of the largest superyacht the shipbuilder has ever brought to Europe – the 42m Majesty 135. 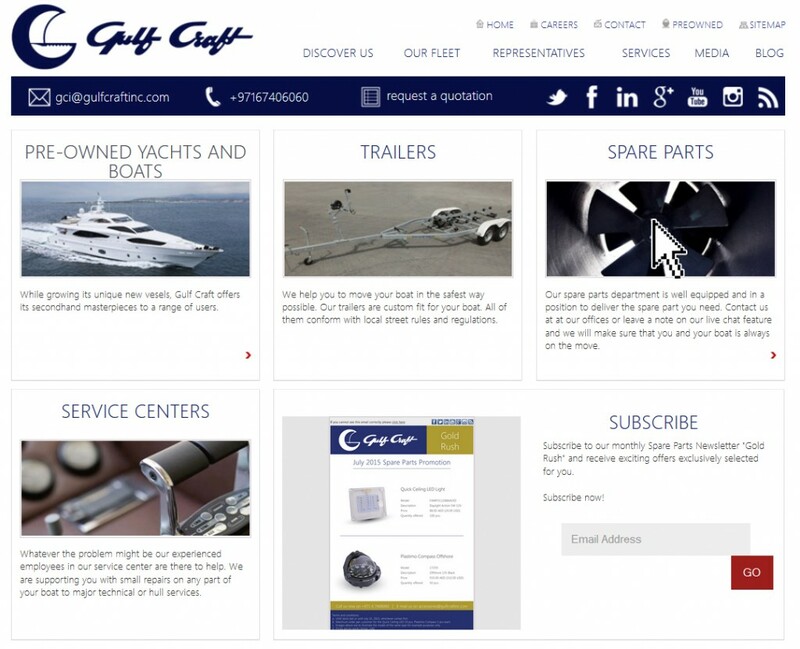 Gulf Craft has recently launched its online spare parts page for easy access to spare parts and accessory items by our clients. 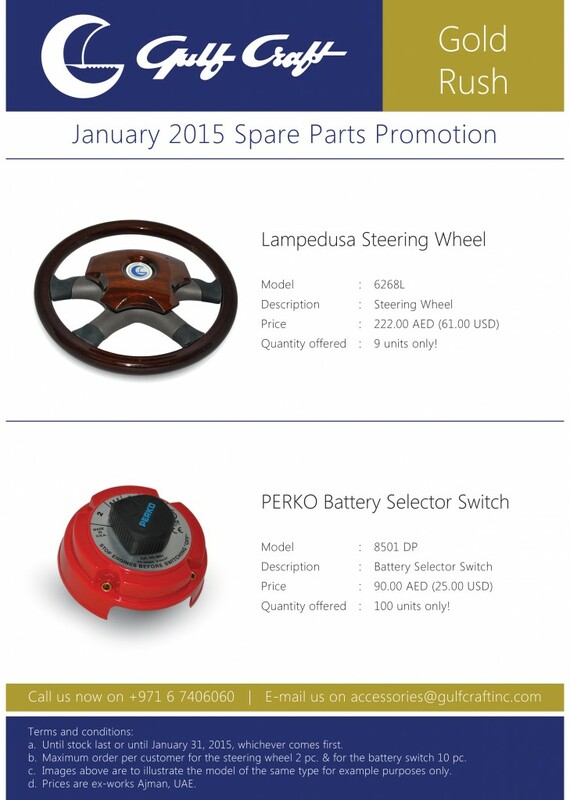 We have a tremendous number of spare parts and accessories available in our centralized stores in the United Arab Emirates for any Gulf Craft or non-Gulf Craft boat owners. Gulf Craft & Australian Superyachts concluded its successful participation in the 2015 Sydney International Boat Show ending last August 3, showcasing its global reach and commitment to serving the evolving yachting needs of the Australian market. Last June 2015, Gulf Craft held a private event for the unveiling of their biggest superyacht to date, the Majesty 155 at the Majesty Yachts shipyard. Gulf Craft has released recently the two interior selections for both the Silvercraft family & fishing boats and Oryx Sport Yachts & Cruisers brands. These two interior options are golden oak suede finish and Canadian walnut suede finish. Launched at a formal event at the Majesty Yachts shipyard last June 2015, the Majesty 155, is Gulf Craft's largest and latest superyacht model. DUBAI, 06 July 2015: Middle East governments should consider easing restrictions on traveling between states to boost the region’s tourism industry and support the fast-developing yachting and cruise market, says Mohammed Hussein Alshaali, Chairman of the UAE-based yacht and boat builder, Gulf Craft. Gulf Craft, has released a new video recently, highlighting the Majesty 70 fly-bridge motor yacht, boasting elegant design and state-of-the-art engineering. 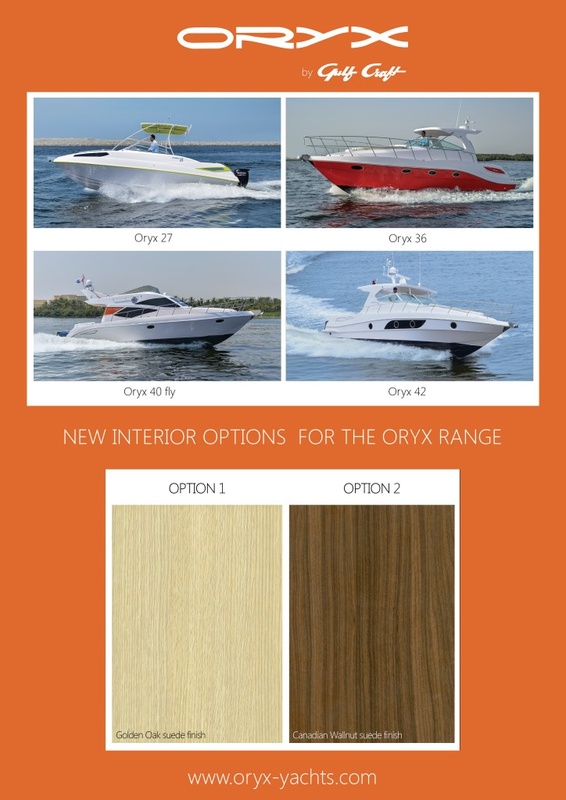 Last December 2014, Gulf Craft has announced the two interior options for both the Silvercraft and Oryx series. The two interior options are golden oak suede finish and Canadian walnut suede finish. Gulf Craft has integrated the latest gyro stablizer technology in its Oryx 40 Fly. This gyro stabilizer reduces, dramatically, the roll of the yacht and helps it to be more stable on water for smooth cruising. 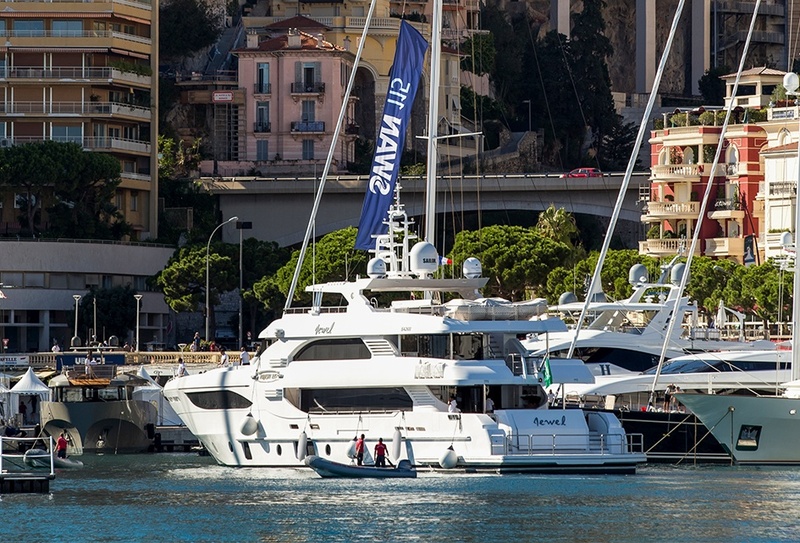 The premiere of the 47m Majesty 155 has been a huge success! Gulf Craft’s largest and latest addition to its Majesty Yachts brand clearly shows the company’s continuous dedication to the luxury superyacht market. Gulf Craft's elegant Majesty 88 is a luxury fly-bridge motor yacht that can easily accommodate a party of up to 40 guests between it's spacious saloon and fly-bridge area. From the fly-bridge with bar and barbecue to the saloon with its full length panoramic windows, the Majesty 88 has an imposing, yet elegant appearance. 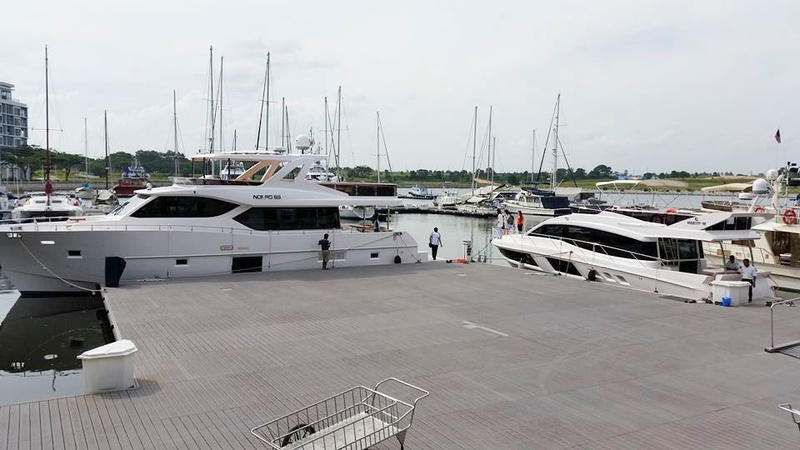 20 June 2015- It was a perfect Saturday afternoon at the Puteri Harbour Marina in Iskandar, Malaysia to enjoy a private viewing & sea trial of the Nomad 65 and the Majesty 48 yachts. 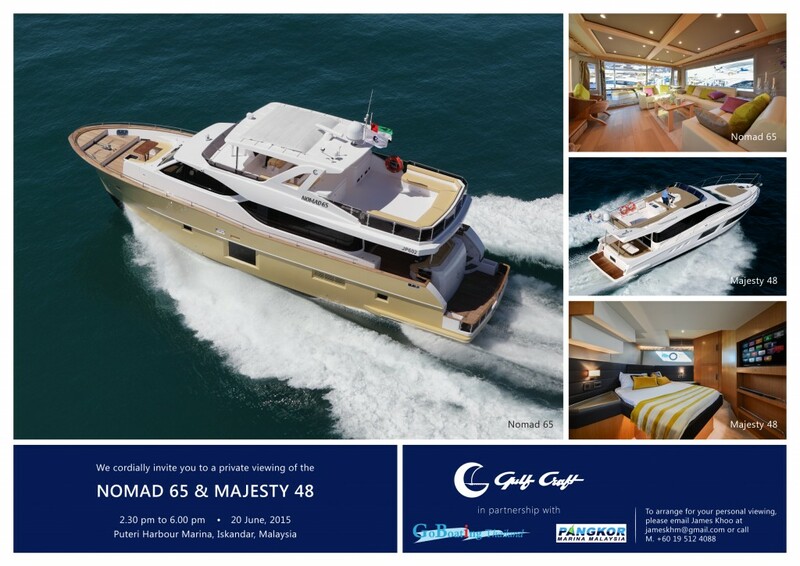 Gulf Craft together with Go Boating Thailand and Pangkor Marina Malaysia cordially invites you to an exclusive private viewing of the Nomad 65 this June 20, 2015 from 2:30- 6 PM at the Puteri Harbour Marina, Iskandar, Malaysia. 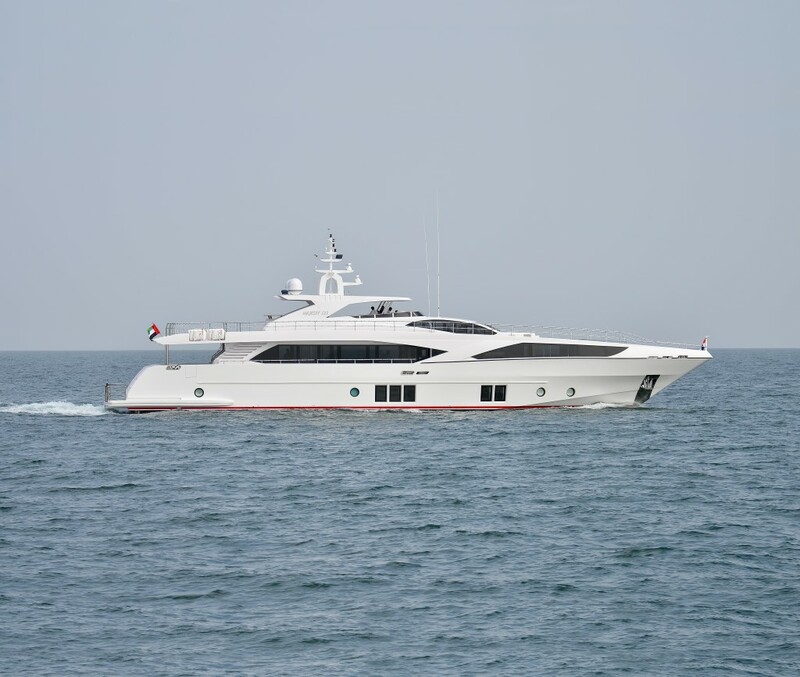 Prior to the unveiling of the Majesty 155 last June 6, 2015, Gulf Craft conducted its first Majesty 155 sea trial following its launch in May 2015. Gulf Craft's fun & trendy 8.40 m sport cruiser, the Oryx 27, quickly gained popularity since its introduction at the 2013 Dubai International Boat Show. 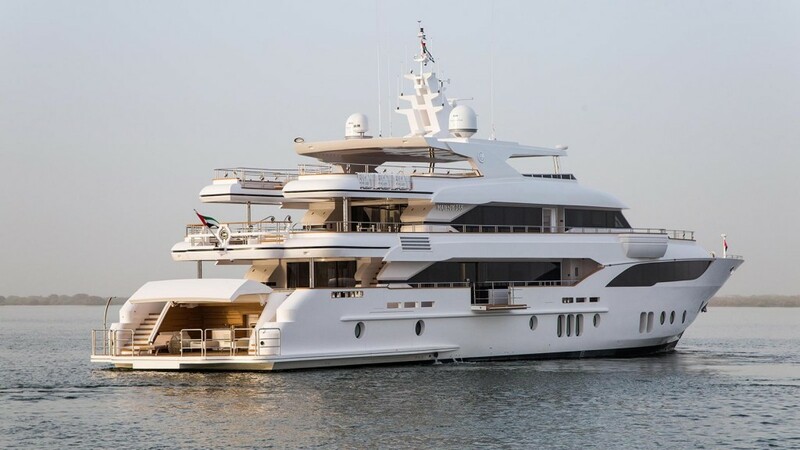 Umm Al Quwain, UAE, 06 June2015: Under the patronage of His Highness Sheikh Saud bin Rashid Al Mu'allah, member of the Supreme Council of the UAE and Ruler of Umm Al Quwain, Gulf Craft today unveiled the Majesty 155, the UAE shipbuilder’s largest-ever, fly-bridge motor superyacht. DUBAI, 4 June 2015: Engaging and selling successfully to ultra-high net worth individuals (UHNWIs) is not possible without first taking time to understand their needs and desires, and then to establish a trusting, consultative relationship, says a top regional CEO. Nomad Yachts is Gulf Craft's brand name for an exciting new range of cruisers. Created for the serious boater, they reflect the growing interest in the worldwide market for a craft that can offer long range cruising, along with the luxury and comfort of a mini superyacht. The Nomad Yachts range consists of the 65, 75, and the 95. and today, we take a closer look at the 20-meter 65. The 23m Nomad 75, launched at the 2015 Dubai International Boat Show, is one of the models in the Nomad Yachts brand of Gulf Craft. Like its sister models, the Nomad 95 and Nomad 65, this yacht offers superb stability with a long-range cruising capability. The dictionary definition of ‘nomad’ is, “a person with no settled home who moves from place to place.” This accurately sums up this new brand of yachts from Gulf Craft, who are intent on making waves in the leisure boating industry from their base near Dubai in the United Arab Emirates. After its official launch at the 2015 Dubai International Boat Show in March 2015, the Nomad Yachts has quickly gained popularity. Its line-up covers the Nomad 95, Nomad 75 and Nomad 65 models. Since its global launch in March 2015 at the Dubai International Boat Show, the award-winning Majesty 122 has proven to be a welcomed addition to the Majesty Superyachts collection, Gulf Craft’s line of luxury fly-bridge motor yachts that combine style and elegance with innovation to create the epitome of truly royal cruising. Built by the UAE based shipbuilders Gulf Craft, the Majesty 122 is one of six Majesty superyachts that have thus far been launched by the brand. 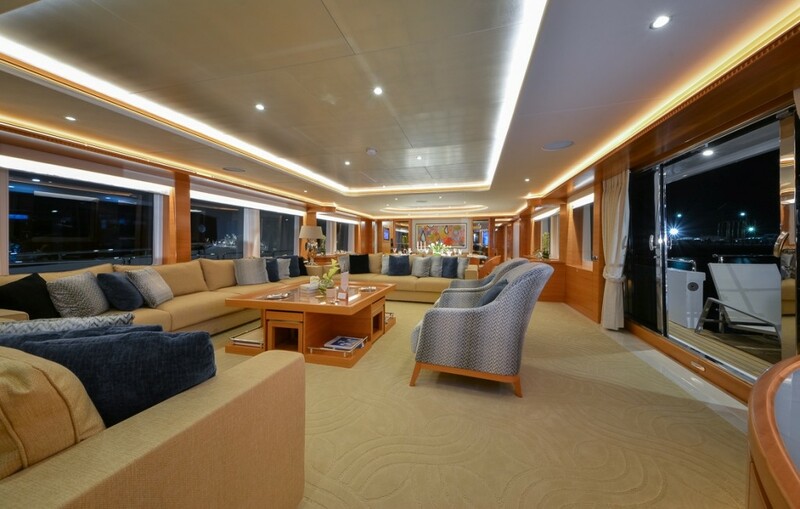 She features naval architecture, interior and exterior design completed in-house by Gulf Craft's Design Studio. Constructed with GRP and measuring 37.50 metres in length, she has a beam of 7.60 metres and a draft of 1.90 metres, she has a Gross Tonnage of 247 and is Bureau Veritas certified. Both inside and out, she looks every part the luxury fly-bridge superyacht she is. 7 May 2015: Gulf Craft celebrated its 33rd Annual Sports Fest at its Majesty Yachts facility in Umm Al Quwain with more than 1,500 employees of whom more than 500 participated in different sports events such as football, volleyball, table tennis, badminton, cricket, billiards, table soccer and table football along with its latest sports activity, the raft race. 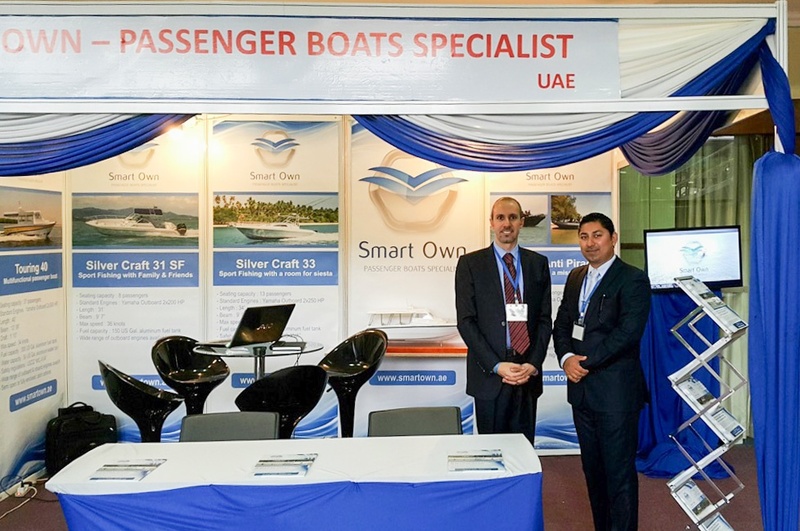 10 May 2015: Gulf Craft together with Smart Own has recently concluded its successful participation at the 18th Kenya International Trade Expo. 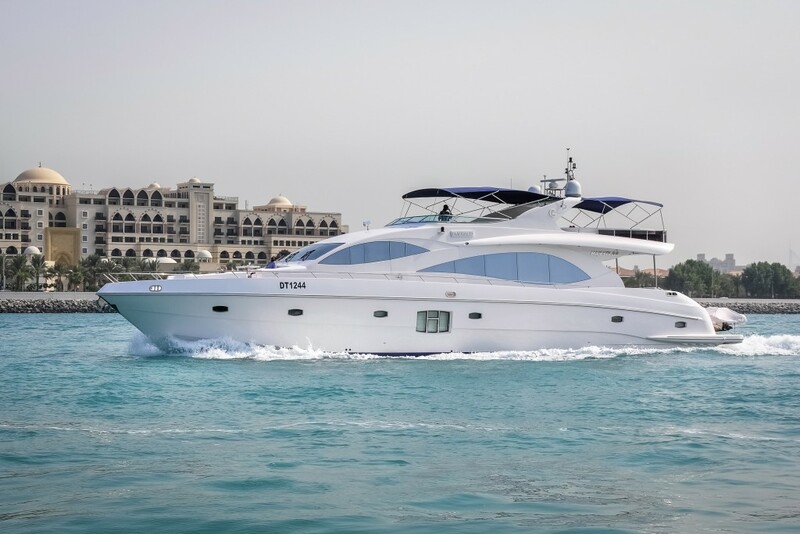 DUBAI, 7 May 2015: Leisure cruising is becoming an increasingly popular option for tourists in Dubai, with prices comparing favorably with staying in five-star hotels, and visitors keen to enjoy the breathtaking views of the city’s waterfront, say industry experts. 25 April 2015 - Mohammed Alshaali, Chairman Gulf Craft, together with John Lee of Shanghai Bahrfuss , Gulf Craft's exclusive dealer in China met with Xi Qunfeng, Vice-President and Shen Bin, General Manager of Expo Shanghai Group for the signing of Gulf Craft's participation at the 1st Yachting Shanghai International Marine Expo 2015. The official signing was executed on-board the Majesty 105 during the Singapore Yacht Show last April 24. 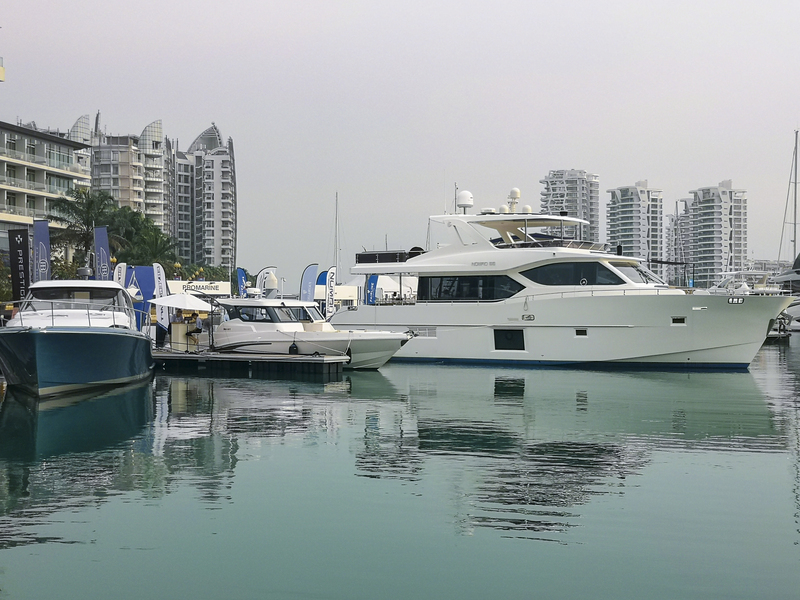 Singapore, 23 April 2015: Visitors of the Singapore Yacht Show lined up to experience Gulf Craft’s largest superyacht it has ever brought to the region, the Majesty 105, and the latest innovation, the oceangoing Nomad 65 in an impressive display to show the manufacturer’s range of leisure crafts. Gulf Craft is displaying and regionally launching the superyacht Majesty 105, finalist in World Superyacht Awards 2014, alongside the fully equipped family yacht Majesty 48 and the newest addition to its wide range of yachts and boats, the Nomad 65, at the Singapore Yacht Show. Nomad 65 is the first hybrid semi-displacement yacht under the recently established brand, Nomad Yachts. The Singapore Yacht Show gives us the perfect opportunity to catch up with all our existing customers in the region – and meet with potential new ones. This year we’re particularly excited to be attending the event because it gives us the chance to show off the latest addition to our new fleet of oceangoing craft – the Nomad 65. In preparation for the Singapore Yacht Show (April 23 -26), Gulf Craft has shipped a Majesty 105 superyacht, Nomad 65 and a Majesty 48 to Asia. Seen here in Jebel Ali port, the yachts are being lifted and tightly secured. See you there! 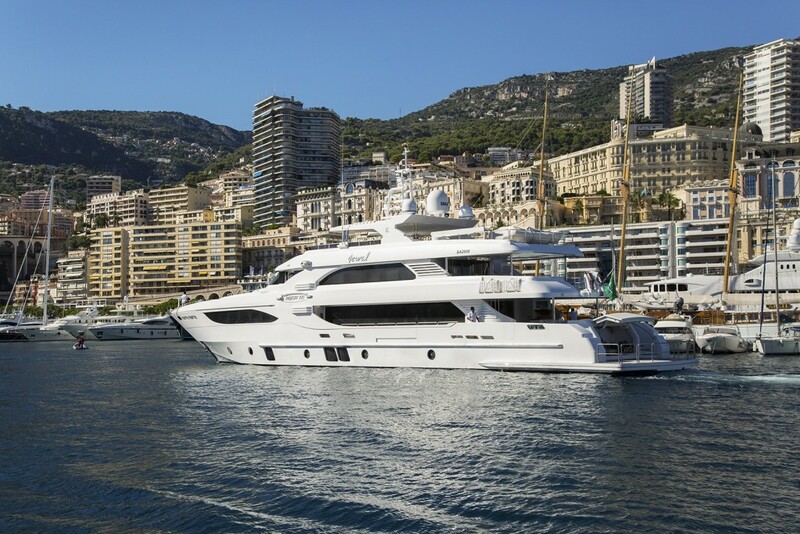 LONDON, April 8 2015: Gulf Craft, one of the world’s leading superyacht shipyards, will participate in the first-ever London Yacht, Jet & Prestige Car Show, bringing its European and international customers up-to-date with the latest innovations in its range of luxury yachts, sports cruisers and leisure craft. Majesty 105 continues to turn heads because of its spacious interior as well as cleverly designed fly-bridge, and in the words of Asia Pacifc Boating magazine, one of Asia's leading yachting publications : a superyacht for one purpose- ANYTHING". 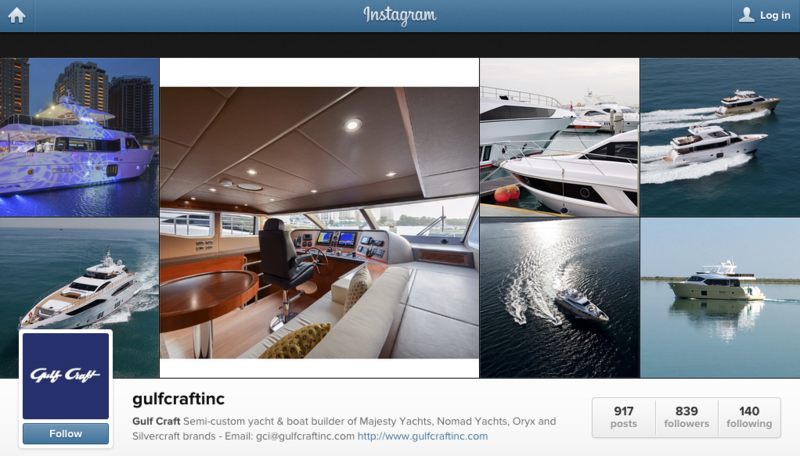 Follow Gulf Craft on Instagram! Looking for awesome yacht pictures ? Or for some of our best shots of our wide range of leisure craft ? Or for live updates and snapshots of our events ? 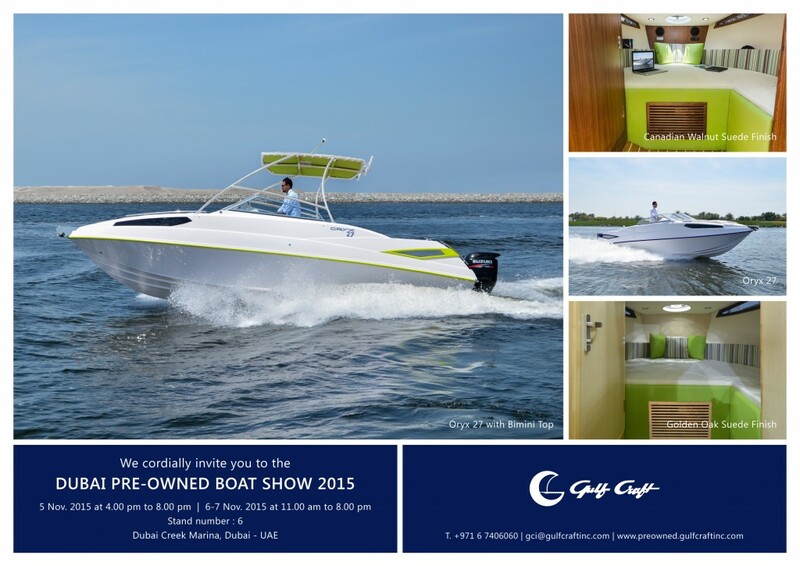 Gulf Craft recently participated in the Amwaj Marina Boat Show 2015 held last March 26-28 in Bahrain. Showcased was the new Majesty 122 together with Majesty 48, Waveshuttle 56, Oryx 27 and Oryx 42. Majesty 105 is not your average superyacht. With it's immensely spacious interior and exterior layout, you can have the maximum liveable space on a cleverly engineered yacht. As as semi-customized boat builder, Gulf Craft gives its clients the personalised luxury they desire with more space and less clutter. 18 March 2015: Gulf Craft, one of the world’s leading superyacht shipyards, amazed Qatari guests with its latest superyacht, the Majesty 122, and its new and innovative yacht collection built for extended sea travel – Nomad Yachts – at an exclusive preview this morning of its leisure craft. 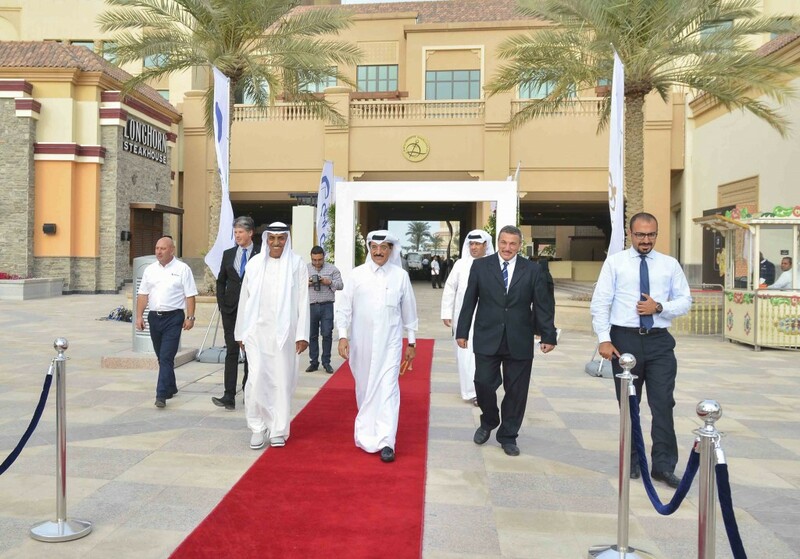 18 March 2015 – Doha, Qatar: HE Dr Hamad bin Abdul Aziz Al Kuwari, Minister of Culture, Arts and Heritage, today inaugurated the Gulf Craft Exclusive Preview in Qatar. 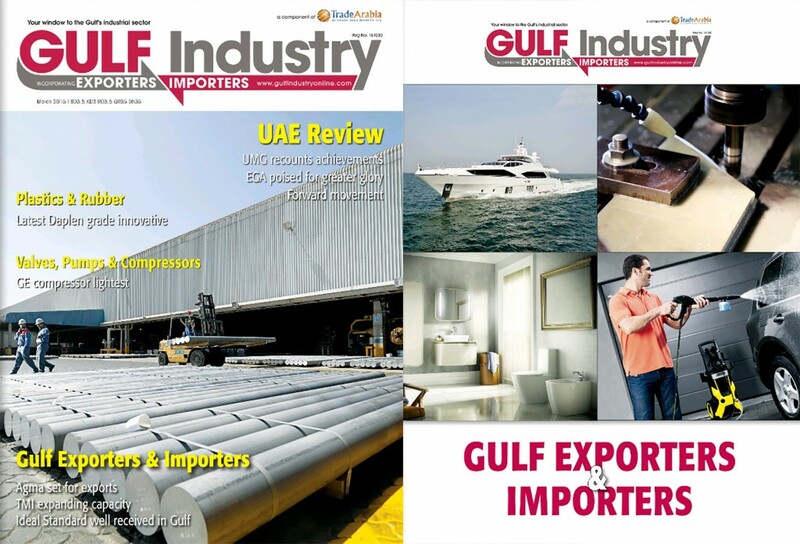 Gulf Industry features Gulf Craft in its March 2015 issue, pp 66-67 entitled, "Gulf Craft buoyant about exports". 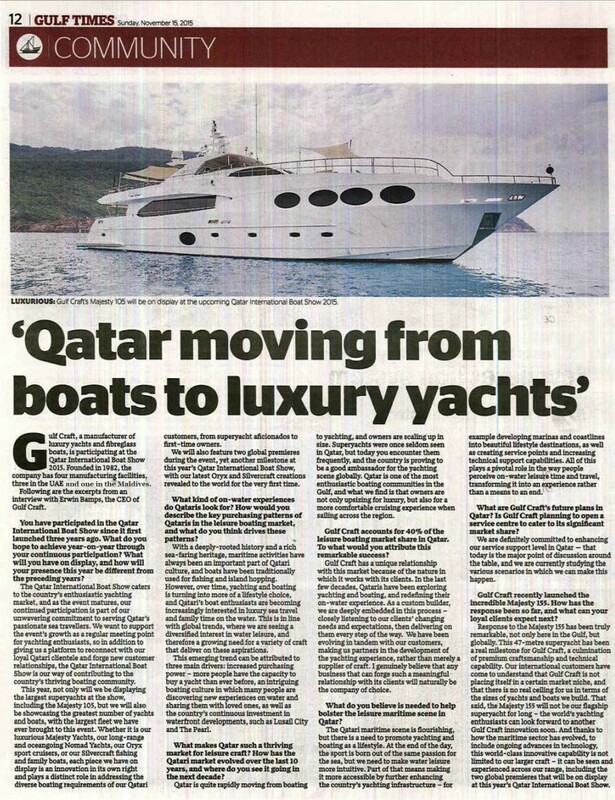 Mohammed Al Shaali, Chairman of Gulf Craft and Erwin Bamps, Chief Executive Officer were interviewed for this article. Globally acclaimed UAE yacht and boat builder, Gulf Craft, impressed visitors at the 23rd edition of the Dubai International Boat Show featuring two global launches- our latest Majesty Yachts superyacht, the Majesty 122, and the Nomad 65 from the new collection of yachts designed for the passionate seafarer, Nomad Yachts. Providing us with an insight into the ever changing sands of the Gulf yachting market as well as their beautiful fleet of yachts, Erwin Bamps speaks to Ben Roberts of Superyachts.com about how Gulf Craft rose to the top of the chain and how the culture of the region has created such a rich heritage of yacht owners over the years. How has Gulf Craft evolved since its inception? 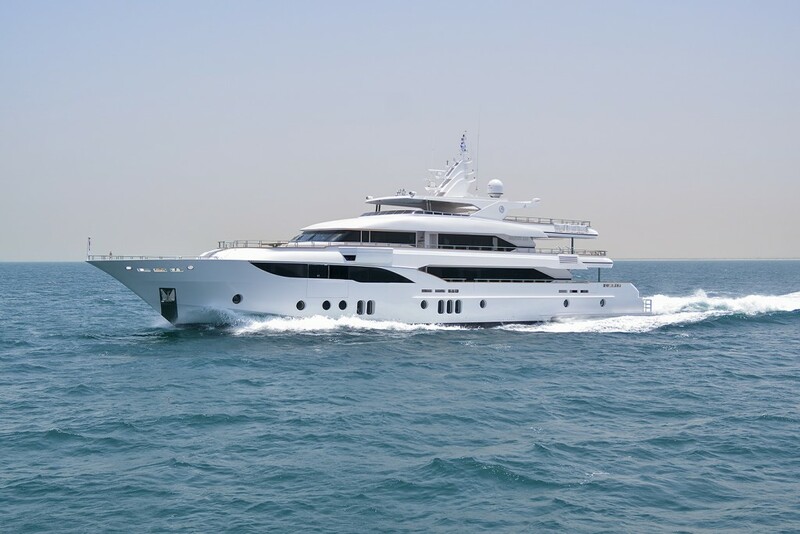 "Gulf Craft has grown from a yacht and boat manufacturer that is dedicated to the region’s needs – by feeding into people’s aspirations for spending time on the water, be it for fishing or leisure with family and friends – to one that is fulfilling the ever-growing demand for luxury sea travel. Our wide range of vessels now include larger and more luxurious craft tailored to the individual needs and requirements of our clients. However, we have not stopped at the Gulf coast. While we continue to transform the aspirations of our clients in the region into a tangible reality, we are simultaneously looking at an ever-wider horizon of clients beyond the borders of the Gulf. Over the years, we have gained the loyalty of customers in neighboring countries and across continents, amplifying our global presence. People not only appreciate the quality of our build, but also our unique hospitable approach to both the product and the client, engaging boat owners in the creation of their craft for a truly personalized vessel. Today, we remain loyal in our commitment to make yachting and boating accessible to everyone through our wide range of innovative craft. We stay true to our objective of getting people out on the water as much as possible, and we are now recognized for our ability to create oceangoing superyachts with a high level of sophistication and finish. We are still dedicated to redefining the boating experience, and we continue to listen to our customers every day in our continuous efforts to enrich change and celebrate innovation in the landscape of the dynamic yachting and boating industry." What is it about the UAE culture which marries itself so well with the superyacht lifestyle? "First is simply the geographic location of the UAE. The people of this country have spent most of their lives living close to the water, and so the seafaring lifestyle is deeply rooted in their culture and history, and therefore their hearts. The people of the UAE also have a genuine appreciation for the finer things in life, and there is a strong hospitality culture in which networking is key to a flourishing business. The superyacht offers a setting that is less formal than the office, but more formal than the home – the perfect environment for not only spending time with loved ones, but also a corporate gathering. 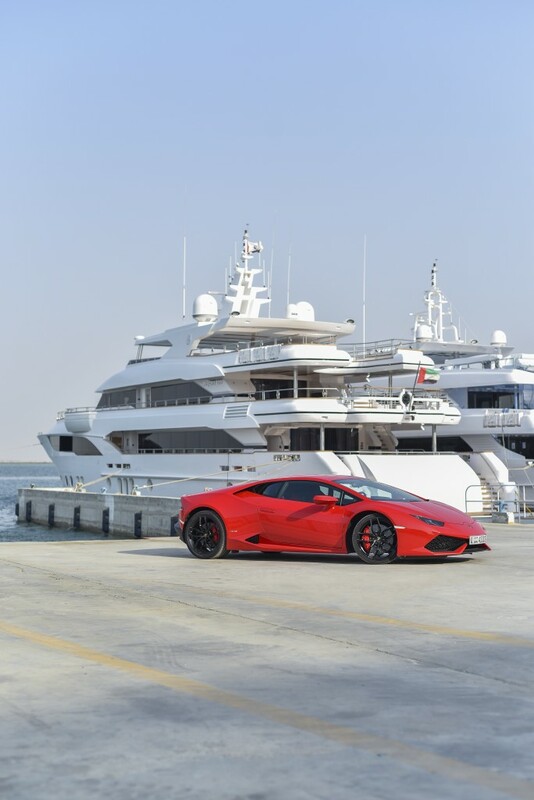 This combination of the UAE’s waterfront geographic setting, its hospitable cultural and social values, and, of course, the financial capacity of its people, is what makes the country a favourable market for the superyacht lifestyle." How has the state of the market affected new build and brokerage activity in the region between 2009 and 2015? "Speaking from experience, I truly believe that this market has proven to be more resilient than the global market when it comes to yachting. People have this lifestyle in their hearts – it is not seen as a luxury, or something they might only enjoy a couple of times over the summer, but an essential part of life. As much as they breathe, people want to be on the water, and that is why there is less discretion when it comes to spending on a superyacht in this part of the world. In fact, we have witnessed an upturn in the last few years in terms of superyacht demand. We have seen a maturing demand in which clients are requesting larger yachts, so there are higher quality relationships and bigger yacht sales." Where do you think other markets across the world stand in relation to the UAE? "The UAE still has a limited number of berthing spaces, and is working hard to establish new boating destinations, from The World islands to the Dubai Canal. I therefore believe that what you see today in the UAE is only a fraction of the potential that lies ahead of us, and this is what makes this country and the Gulf so appealing – its promise, rather than its present day potential. When it comes to upcoming yachting destinations, I believe the UAE will be positioned at the top of the global list." The Dubai Boat Show opened today, what can you tell us about the new Majesty 122 you’re launching? "The Majesty 122 is our latest superyacht model that features a design concept that we originally introduced with the Majesty 105, which is “barrier-free living”. This means the superyacht enables guests to live in-between the outdoor and indoor environment, allowing them to experience the best of both worlds. With large windows, extended balconies, and sliding doors, you feel like you are in a luxurious loft overseeing the water. The entire setting feels flowy and breezy – it is about outdoor living stretched into the interior. The Majesty 122 was inspired by both market growth and client needs, and about bringing guests into the yacht to experience an outdoor lifestyle. With unrivalled on-deck lounging areas a characterizing feature of this new craft, the Majesty 122 also allows yacht owners to host more friends and loved ones and share the “barrier-free living” experience. It not only feeds into the regional and global demand in the charter business for larger yachts, but also fulfils the requirement in the private market for spacious living. The Majesty 122 provides yacht owners with the full capacity to entertain – featuring a fully equipped galley, five en-suite staterooms that can accommodate up to 10 guests, and a garage at the rear of the superyacht that can hold a tender and two three-seater watercrafts. 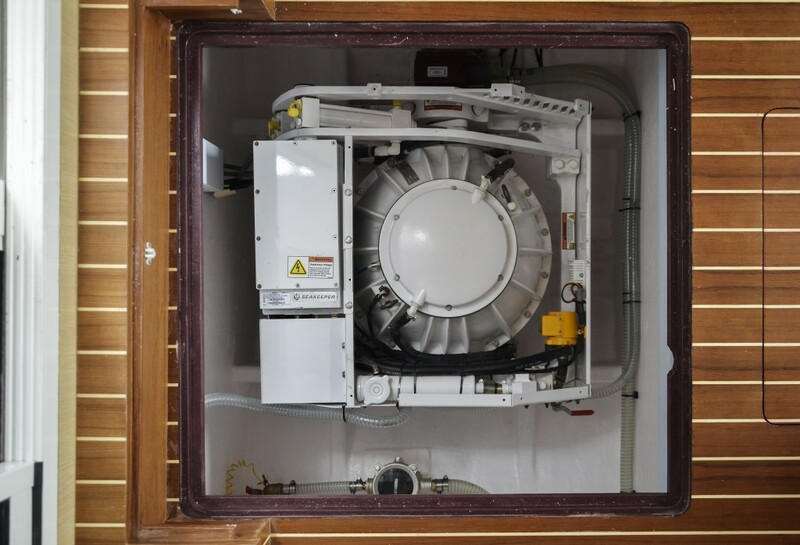 And, of course, deep within the superyacht, behind the panels, lies the engine room with highly sophisticated technology. The Majesty 122 is truly one of the best oceangoing yachts that we have to offer." How does it represent a change in the Gulf Craft fleet? "It is not a change, but more an enhancement of what we are doing. It is an indication of our innovative capability to continue redefining the yachting experience, a representation of our growth and our philosophy in which we build crafts around the client and evolving market requirements by constantly thinking outside the box." 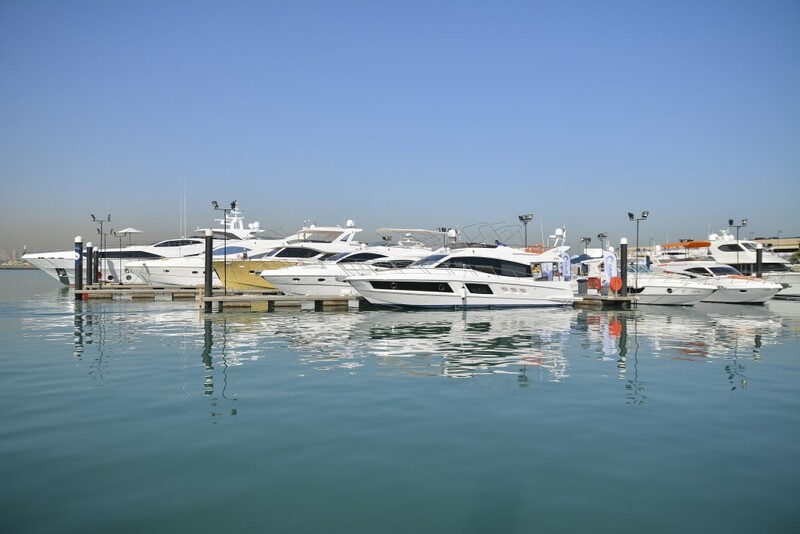 How important is the Dubai Boat Show to Gulf Craft’s overall annual sales activity? "The Dubai International Boat Show is one of the key platforms for us to globally launch our creations, and in this way, it has a greater ripple effect on our activity for the rest of the year. It is the place where we not only unveil our new models, but also where we reconnect with our clients and share our new strategy with the world. The show is a starting point for sales activity for most of our new models, and it creates quite significant business for us in the upcoming months." How is Gulf Craft expanding into 2015? "The construction of our new world-class facility in Dubai Maritime City for the manufacturing of mega and superyachts will commence very soon. We are actively hiring new employees, and we have many new models not only being released at the Dubai International Boat Show, but also on the drawing board for launch later in 2015. We are making investments not only in the immediate short-term, but also in the long-term in our approach to fulfilling the evolving needs of the market. We will continue to push the envelope and use our customer insights to inspire crafts that are built around their requirements. Based on the unwavering trust and enthusiasm that we continuously receive from our clientele, we believe that this is the right time for us to invest and make a difference in the yachting industry, both on a regional and global level." 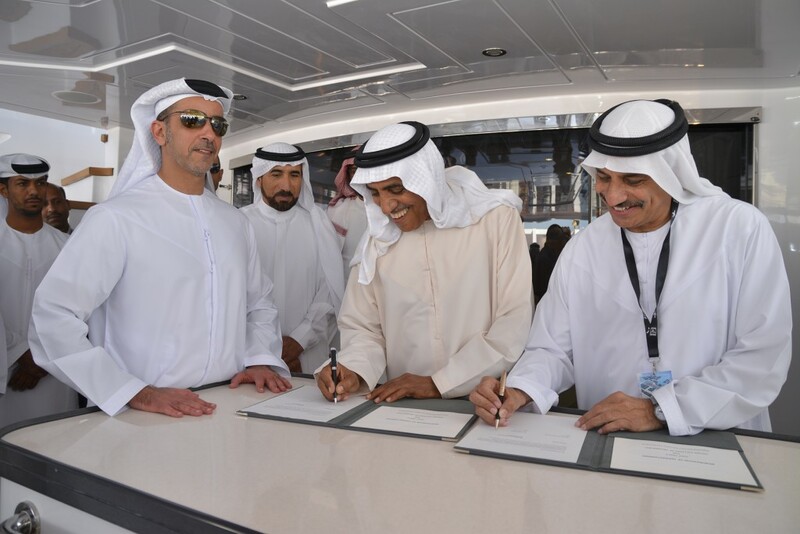 DUBAI, March 4, 2015: Gulf Craft, a leading UAE-based yacht and boat manufacturer, today signed a Memorandum of Understanding with the Higher Colleges of Technology (HCT) to develop avenues for the training and education of the UAE’s future maritime professionals. DUBAI, 03 March 2015: Globally recognized UAE yacht and boat builder, Gulf Craft, impressed visitors at the Dubai International Boat Show today with two global launches, featuring their latest superyacht, the Majesty 122, and the Nomad 65 from the new collection of yachts designed for the passionate seafarer. DUBAI, 25 February 2015: UAE-based yacht and boat builder, Gulf Craft, will be launching an entirely new brand collection of yachts at the Dubai International Boat Show, which runs from 3-7 March 2015 in Mina Al Siyahi, DIMC. DUBAI, 22 February 2015: UAE-based yacht and boat builder, Gulf Craft, is gearing up to make a number of breakthrough announcements at this year’s Dubai International Boat Show, with an impressive display of its latest superyachts, sport cruisers and leisure craft. 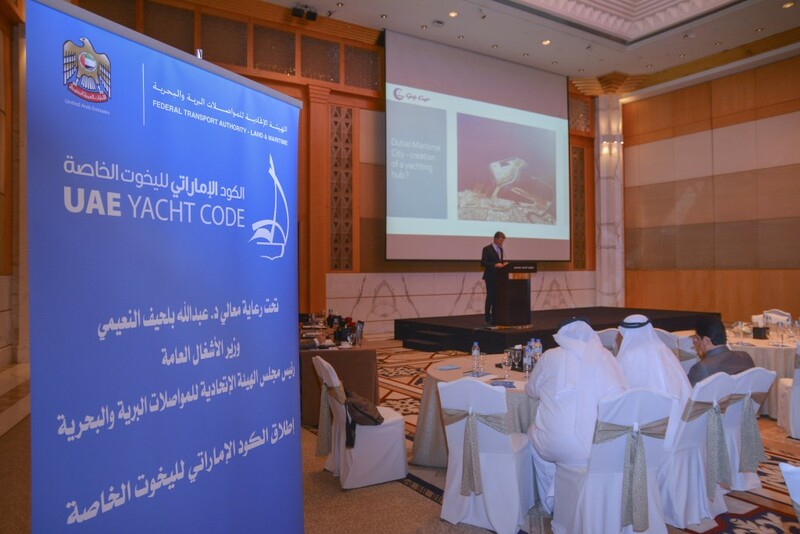 DUBAI, February 2015: The new UAE Yacht Code, announced on Monday by the Federal Transport Authority, plays a pivotal role in boosting the country’s global recognition in the international maritime industry, said Erwin Bamps, CEO of Gulf Craft. DUBAI, 10 February 2015: The UAE’s potential as a global maritime hub can be realized in tandem with the further regulation and integration of the UAE marine industry, said Erwin Bamps, Chief Executive Officer of the UAE-based yacht and boat builder, Gulf Craft. Gulf Craft, one of the world’s leading superyacht-building shipyards, showcased its exciting range of luxury superyachts, sport cruisers, and leisure craft at the Kuwait Yacht Show including the largest superyacht to ever enter the Kuwait market, the Majesty 122. 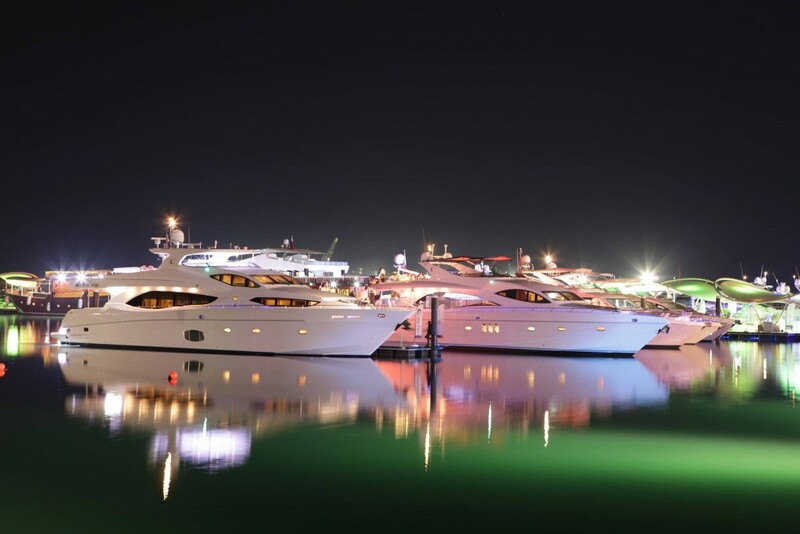 KUWAIT CITY, 3 February 2015: Gulf Craft, one of the world’s leading superyacht-building shipyards, is showcasing its exciting range of luxury superyachts, sport cruisers, and leisure craft at the Kuwait Yacht Show – including the largest superyacht to ever enter the Kuwait market, the Majesty 122. Gulf Craft stores a tremendous number of spare parts and accessories in its centralized stores in the United Arab Emirates for any Gulf Craft or even non-Gulf Craft boat owners. DUBAI, 28 January 2015: Gulf Craft, one of the leading superyacht shipyards in the world, has launched three of its Majesty superyachts into the water in a single week, once again demonstrating its remarkable capacity to turn out premium quality vessels. In response to the initiative of HH Sheikh Khalifa bin Zayed Al Nahyan, President of the UAE, and HH Sheikh Mohammed bin Rashid Al Maktoum, Vice-President and Prime Minister of the UAE and Ruler of Dubai, to support the "Tarahamo" campaign, Gulf Craft has donated a sum of AED 500,000 to help support thousands of Syrian refugees from the Levant region. How great to call this work. Right after our successful participation at the Phuket International Boat Show earlier this month, we decided to take a photo shoot of our Oryx 42 in the turquoise waters of Thailand. To reinforce Gulf Craft’s continuous global expansion, the yard has its presence in the superyacht hall of the Dusseldorf Boat Show 2015, the largest indoor boat show in the world. Located in Hall 6, stand number 6D-30, Gulf Craft staff along with its international dealers is looking forward to see you. Gulf Craft, one of the world’s leading superyacht-building shipyards, has completed its successful participation at the Phuket International Boat Show, PIMEX, where the company has showcased its line-up of luxury yachts and boats . Gulf Craft, one of the world’s leading superyacht-building shipyards, will be highlighting its support for Asia’s maritime industry at PIMEX, the Phuket International Boat Show, where the company will showcase its line-up of luxury yachts and boats for the 12th consecutive year. For the 12th consecutive year, Gulf Craft, together with Go Boating Thailand, will be participating in one of South-east Asia's most anticipated and luxurious boat shows, the Phuket International Boat Show (PIMEX), bringing its exciting line-up of luxury yachts and boats to the forefront of Asia’s maritime scene. The show runs from Thursday, January 8 until Sunday, January 11. Gulf Craft has unveiled two stunning interior design options for our Oryx and Silvercraft brands. The two interior options available are golden oak suede finish and Canadian walnut suede finish. 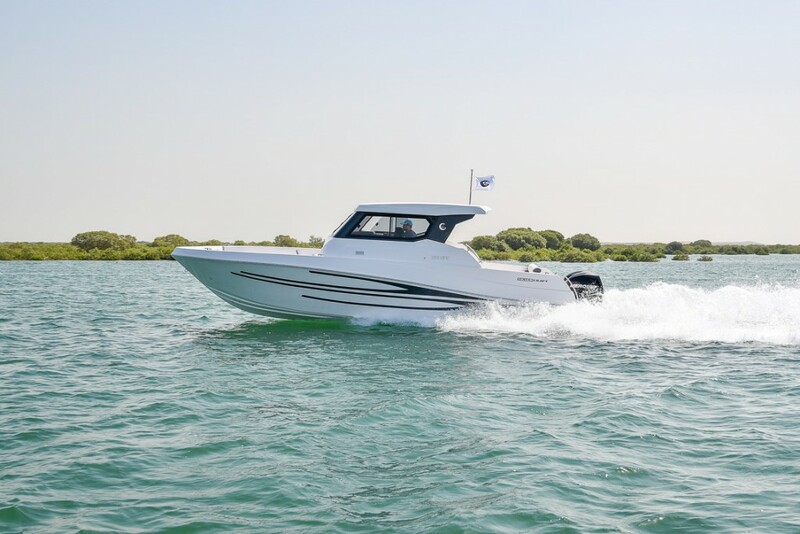 Launched at the Dubai International Boat Show in 2011, the Oryx 42 is Gulf Craft's answer to boating enthusiasts who are looking to combine performance cruising in style with the ability to do some leisure sport fishing. Gulf Craft, one of the top 10 superyacht builders in the world and 2014 Shipyard of the Year awardee, not only builds yachts and boats. Aside from its corporate social responsibility programs, Gulf Craft also welcomes traineeships and requests for activities such as educational tours from different universities and technical institutes. 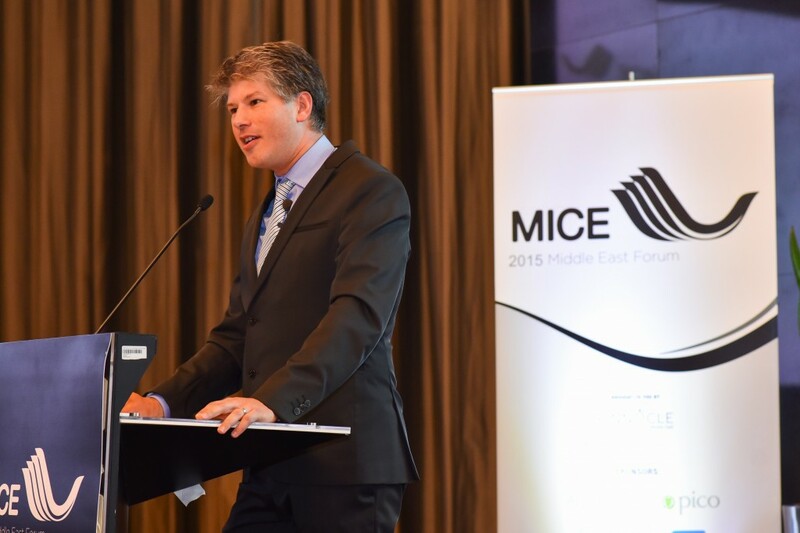 Gulf Craft's CEO, Erwin Bamps, has been invited as one of the keynote speakers at the 4th Annual CET (Customer Engagement Technology) Middle East conference held last November 25, 2014 at the Sofitel Dubai, The Palm with the theme, "Discover the World of Customer Engagement Technology". Gulf Craft recently participated in the fifth edition of the Dubai Pre-owned Boat Show together with its Dubai representative for its Oryx and Silvercraft brands, Gulf Boats Trading, taking place from November 27-29 at the Dubai Creek Marina.